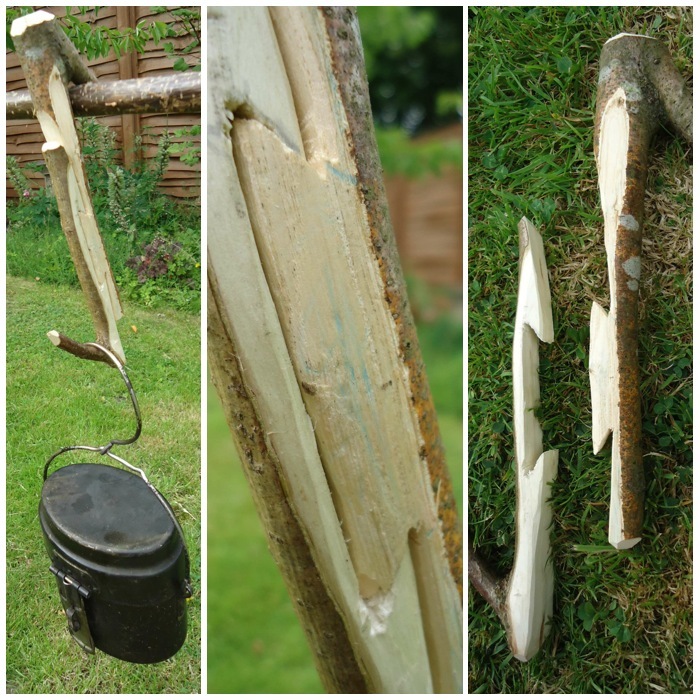 Any self-respecting Stone Age woodworker would always have had a decent flint adze to hand. 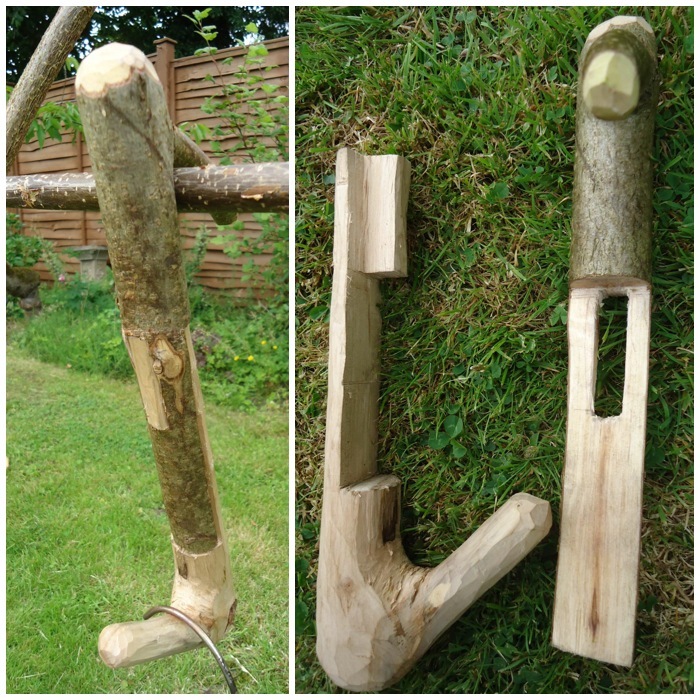 So to become that self=respecting Stone Age woodworker I had to go out and make myself one as they do not turn up in the shops that often. 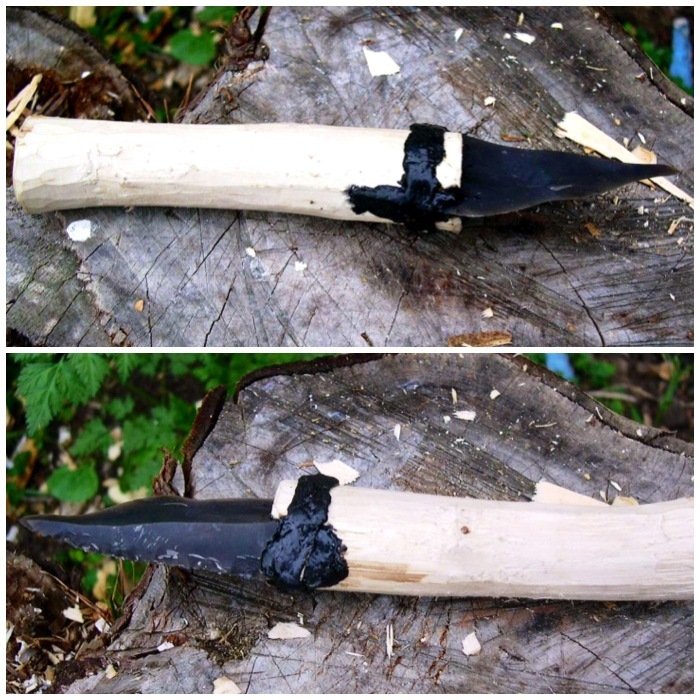 I needed one to undertake my final project on my Woodcraft School Primitive Technology course: to create a bone bodkin and a bark sheath. 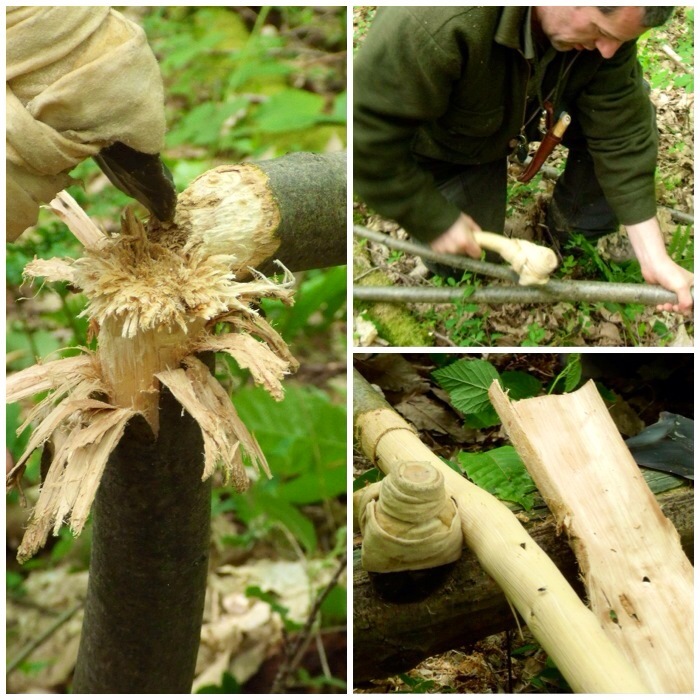 The aim was to make them without the use of modern tools and I would need an adze to help me craft the sheath. 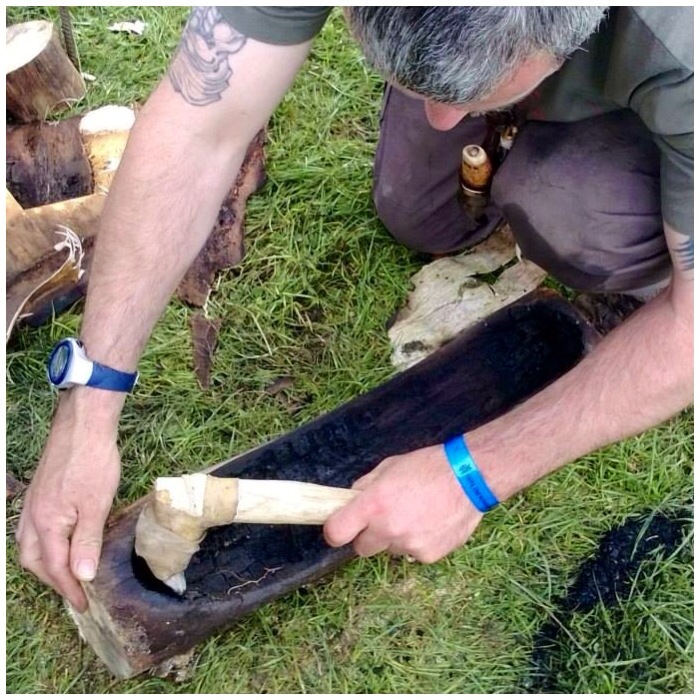 The adze I created for this has been extremely useful since then on other projects such as hollowing out this long bowl. 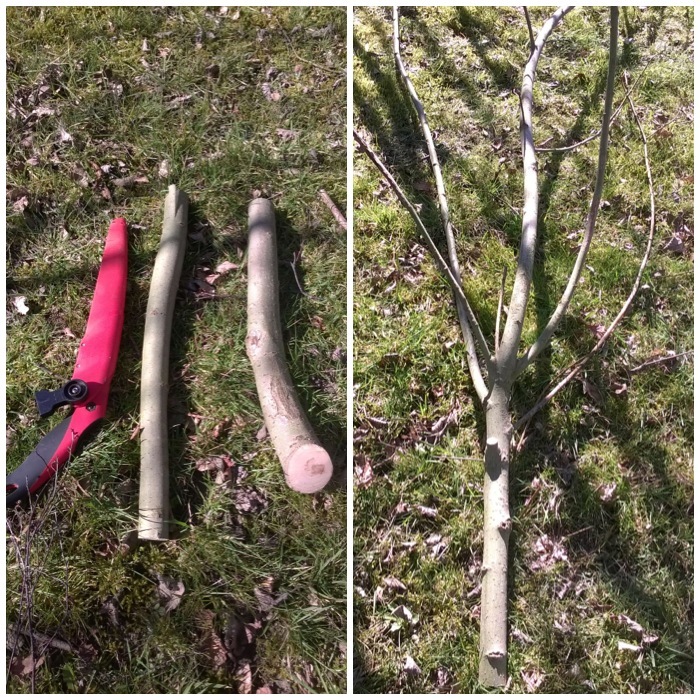 I ended up making two adzes out of flint, rawhide and curved branches. 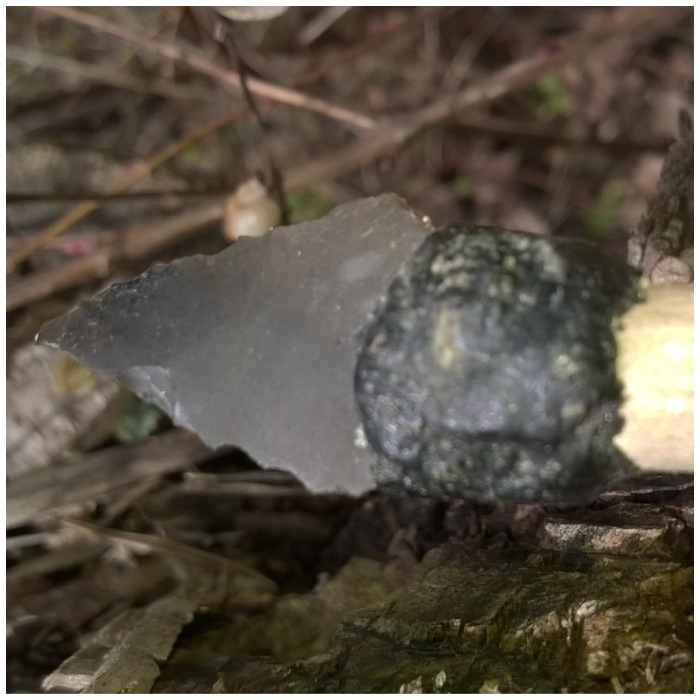 I took my inspiration from the Cheddar Gorge Museum where I came across this very basic but beautiful flint adze. 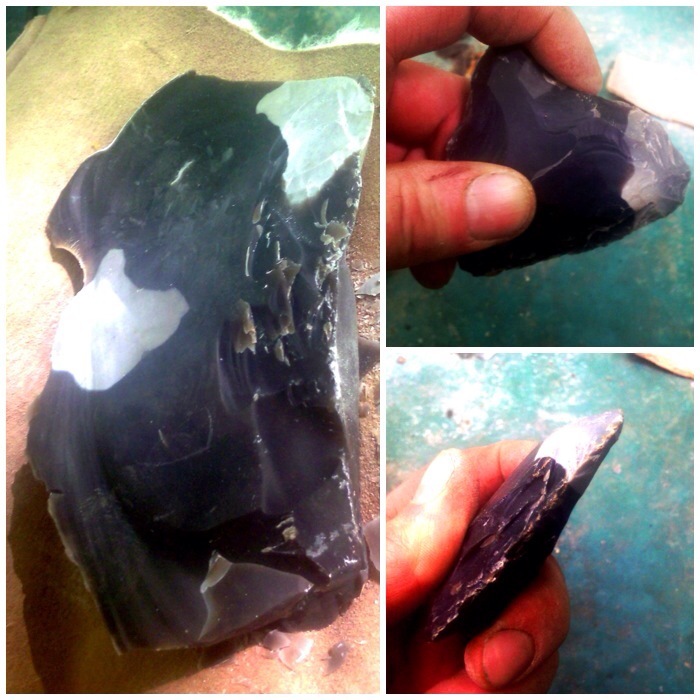 I had kept some flint from the course I had done with John Lord and I got a couple of good strong blades from this chunk of flint. 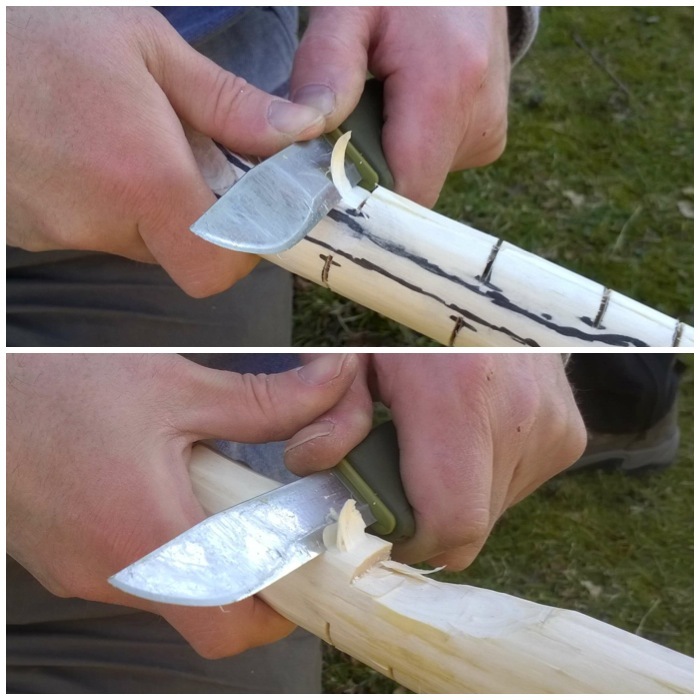 The flint axe blade shouldn’t be overly sharp as that will make it fragile. It needs to have a well-defined edge that has good strong shoulders. 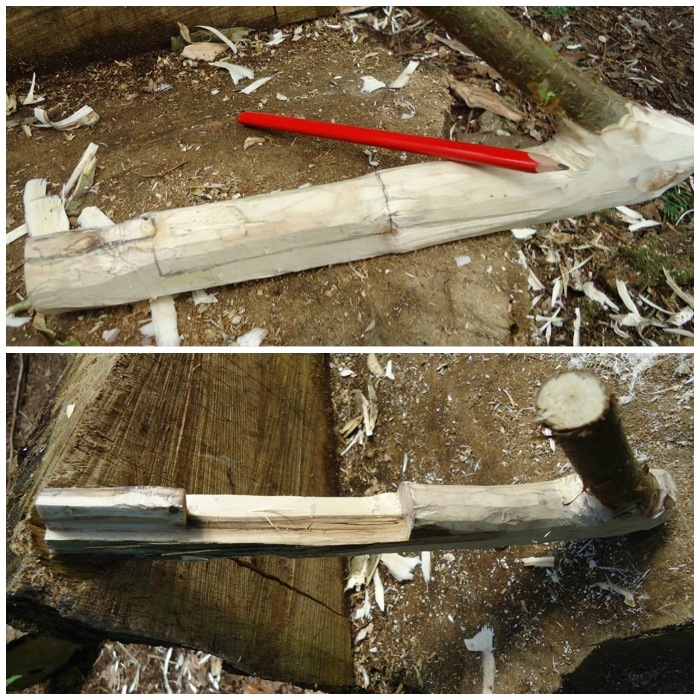 This piece of yew was cut down in my garden and then sawn to its basic shape with a modern saw. 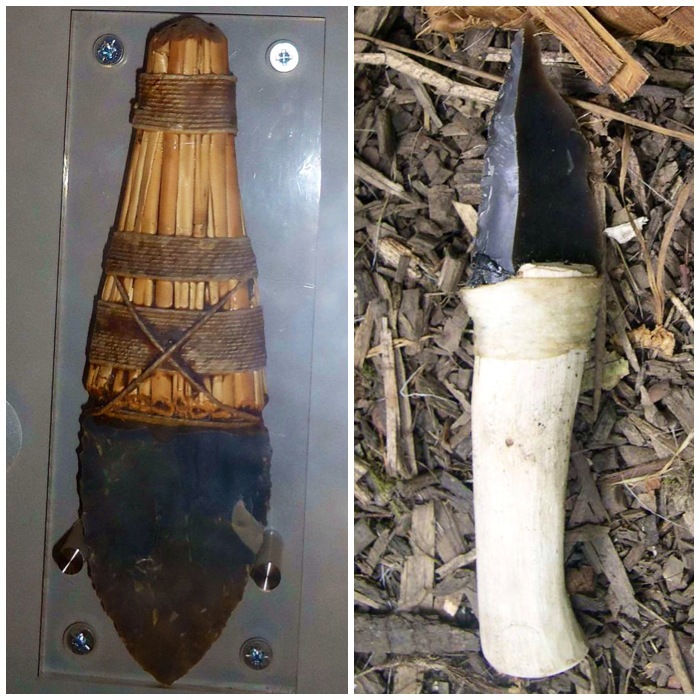 I used the curve to give the flint blade a flat surface to sit on and carved out the notch to give the rawhide some additional surface area to hold on to. I did not cut so deep so as to weaken the handle as this tool was destined for some hard use. 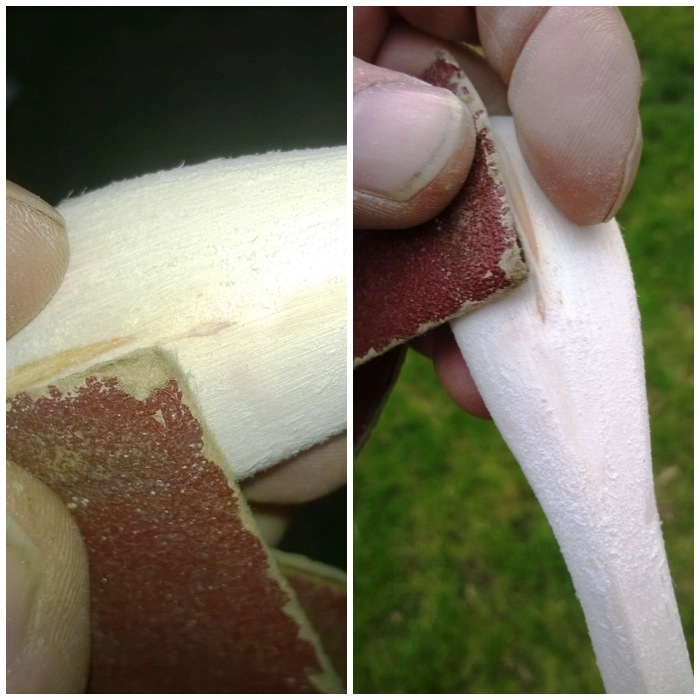 After shaping I stripped the bark off and roughly smoothed it with sandpaper. 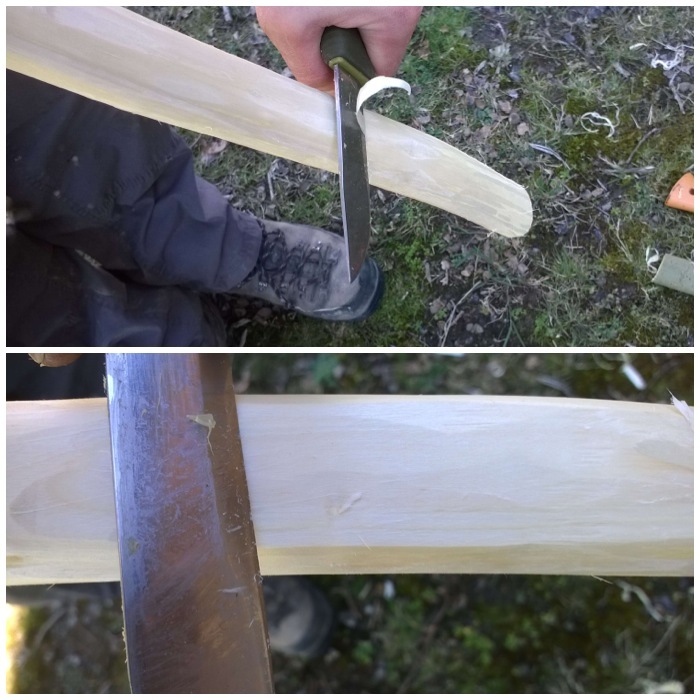 I did not smooth the handle down too much, as I wanted to retain some natural grip. 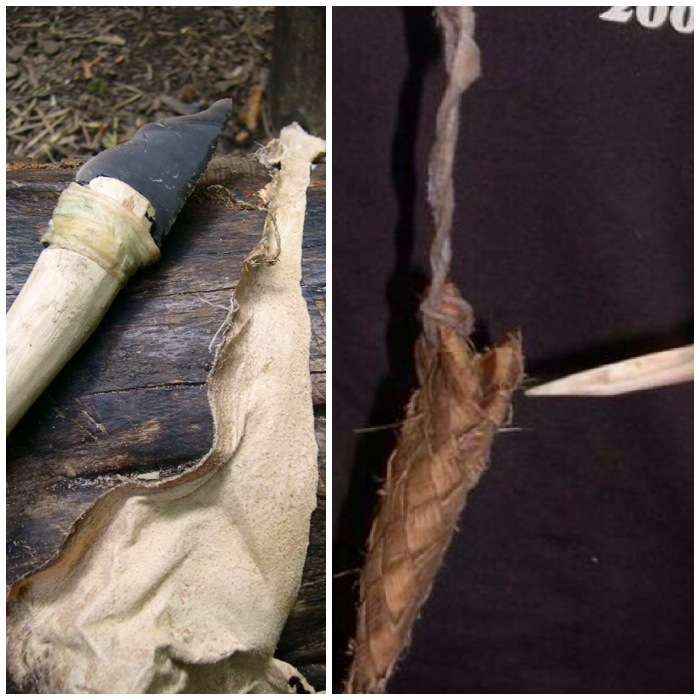 Traditionally rawhide was used to bind the flint to the handle alongside sinew, buckskin or other natural cordage. 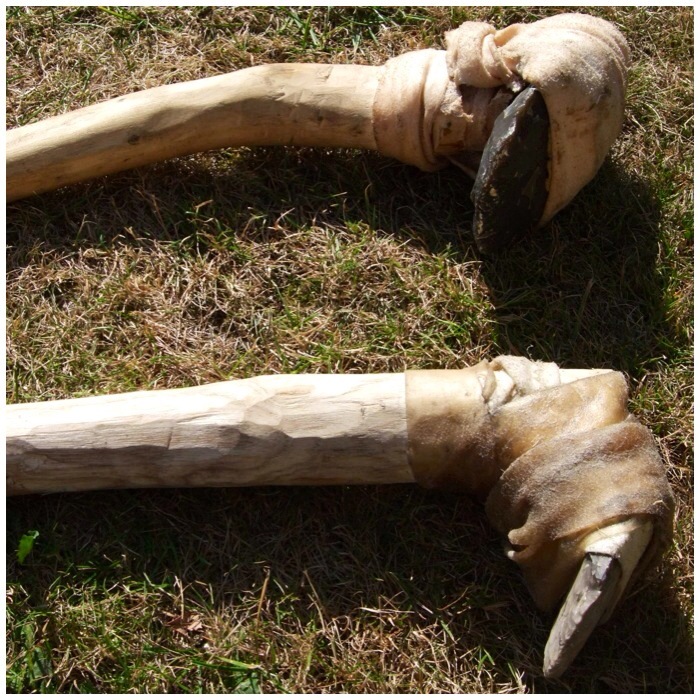 I like to use rawhide as it was commonly used and is easily obtained these days from dog chews (I buy the biggest I can find). I boiled the dog chew in water for about twenty five minutes in order to soften it enough to be able to cut it into strips. After laying the rawhide out flat I just used a sharp piece of flint to cut it into strips I could use to bind the adze together. 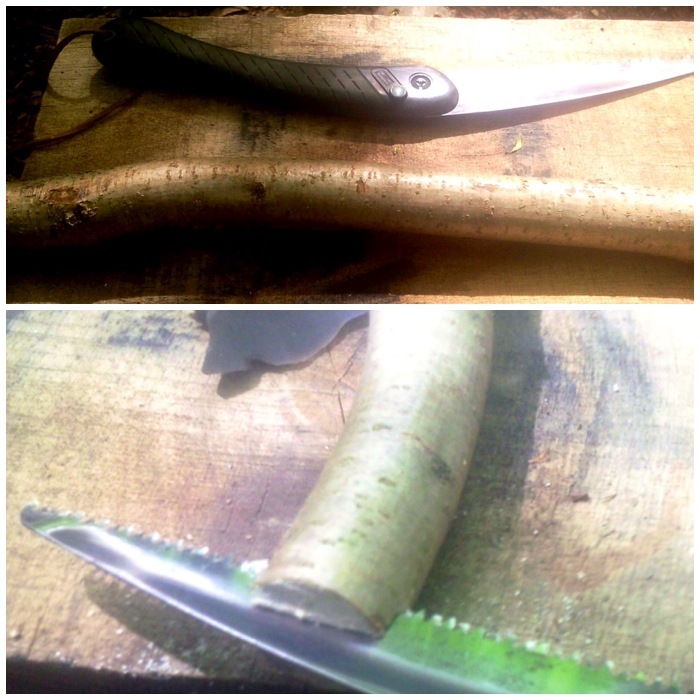 I wrapped thin pieces around the blade and the handle initially. Don’t pull too tight as this will snap the rawhide. 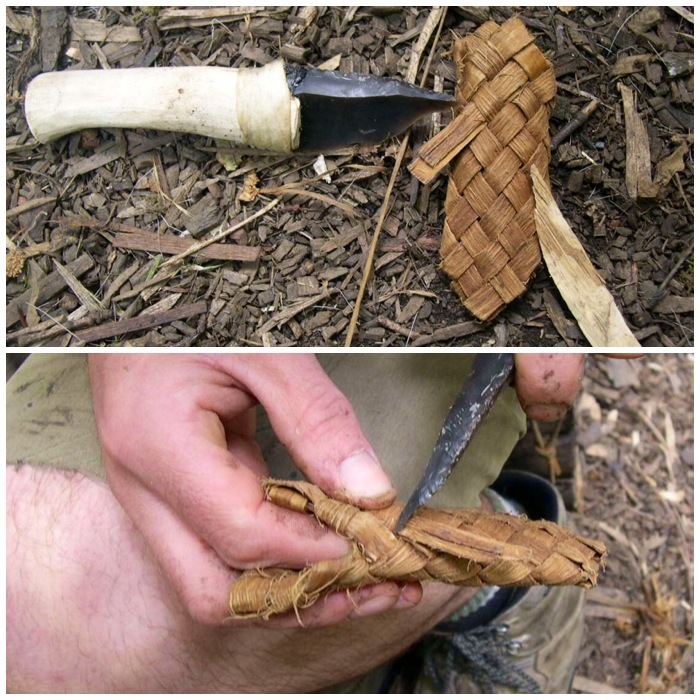 Just tighten slightly, and tie off the ends when you are finished. I left this one to harden in a warm area for a couple of days. 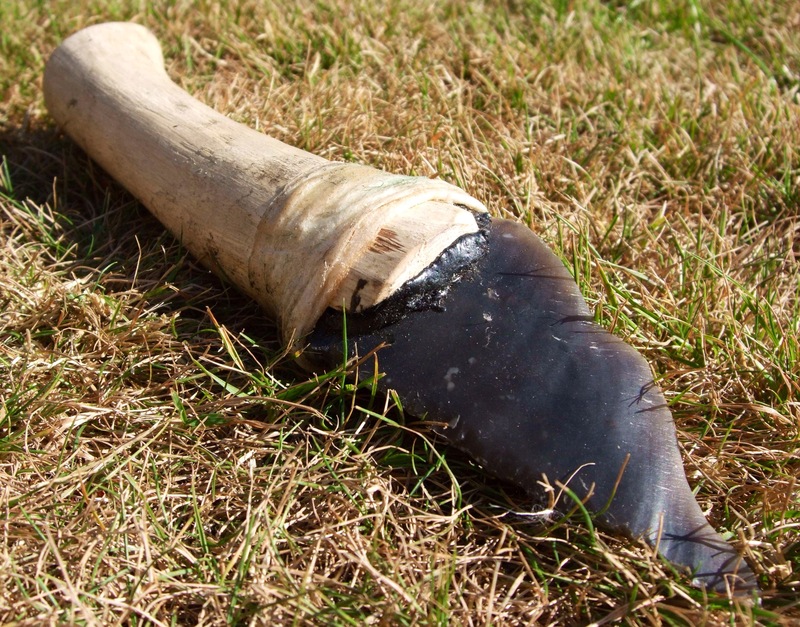 As rawhide dries out it shrinks and goes very hard (almost rock hard). For the next layer of rawhide I used wider strips, which allowed me to really pull them tight without worrying too much about it splitting. They were quite difficult to tie off but I settled for simple overhand knots to finish. 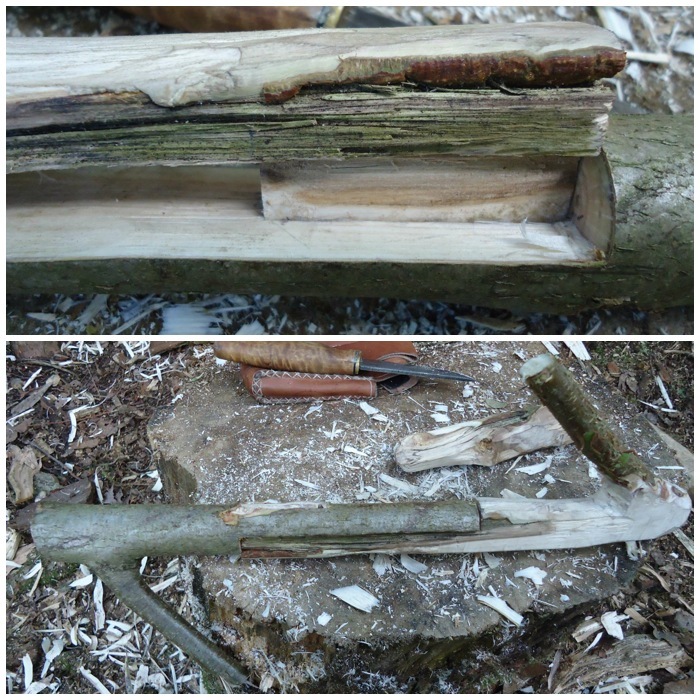 I left these adzes to dry out and tighten for a month until they were needed on the final part of the course. 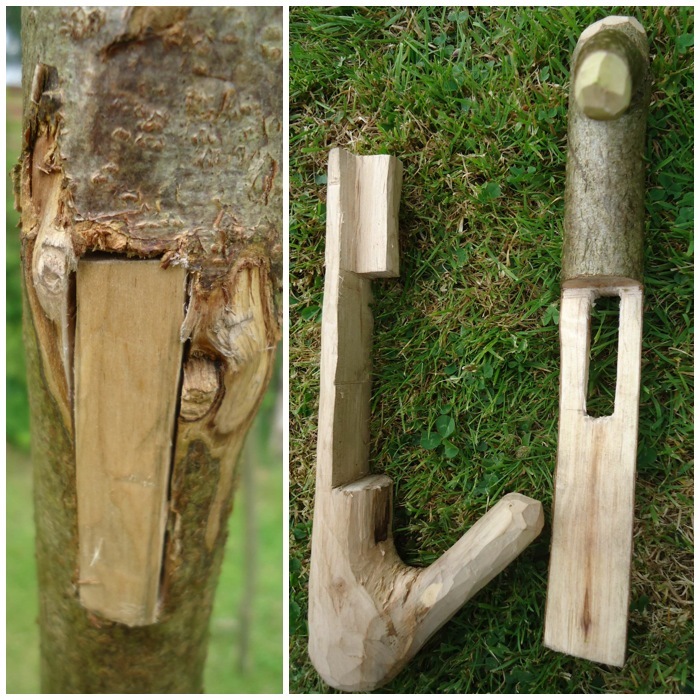 The first job I had to do with the adze was to take down a small sweet chestnut limb. 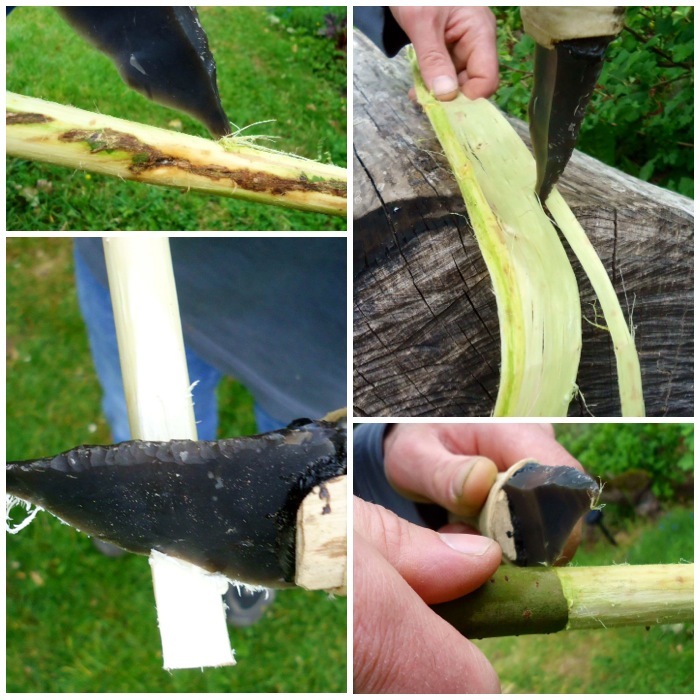 I needed this to make bark strips for weaving a sheath out of the bark and the wood for carving spoons. 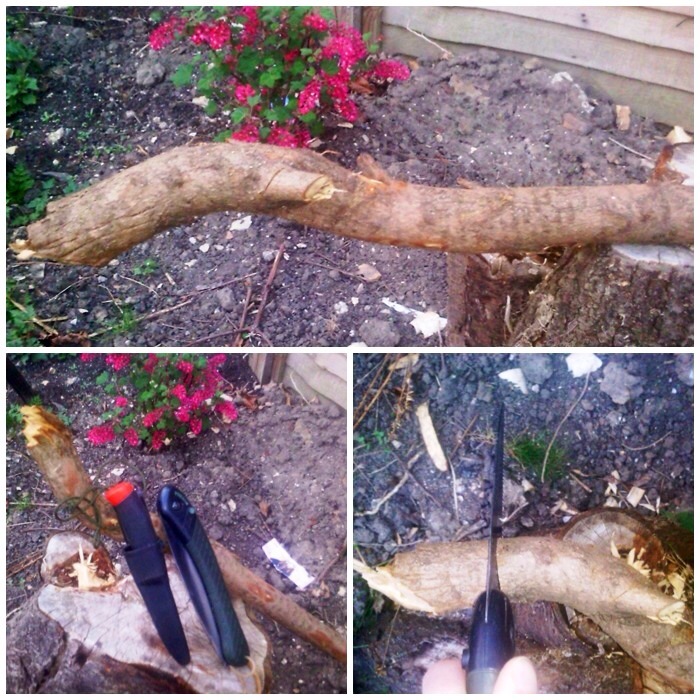 I took the limb down using a rosette cut, chipping away at the wood all the way around the limb until it fell over. 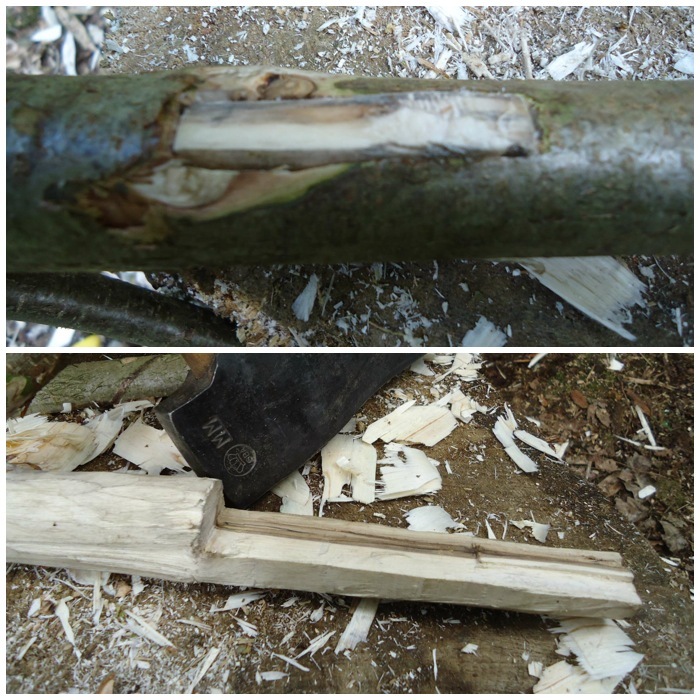 I did not use any large swings or try and gouge the wood out with it, just a steady chipping rhythm, and eventually worked my way through the limb. 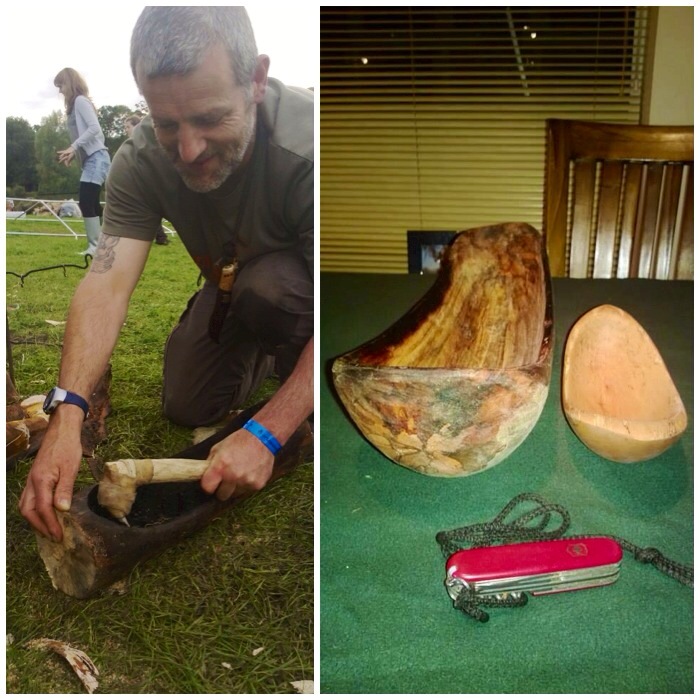 The next project I put the adze to was the shaping of a yew handle for a large flint axe. 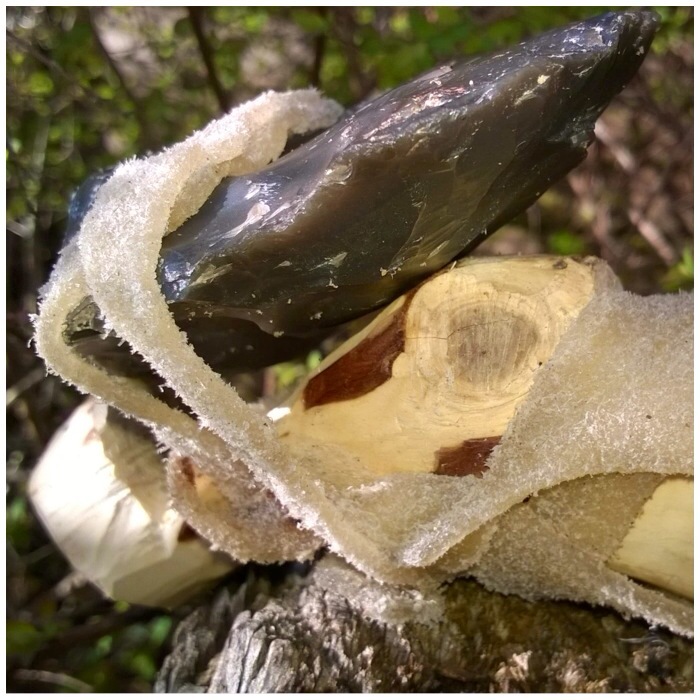 The yew piece I was using was well seasoned and proved too much for the flint adze. 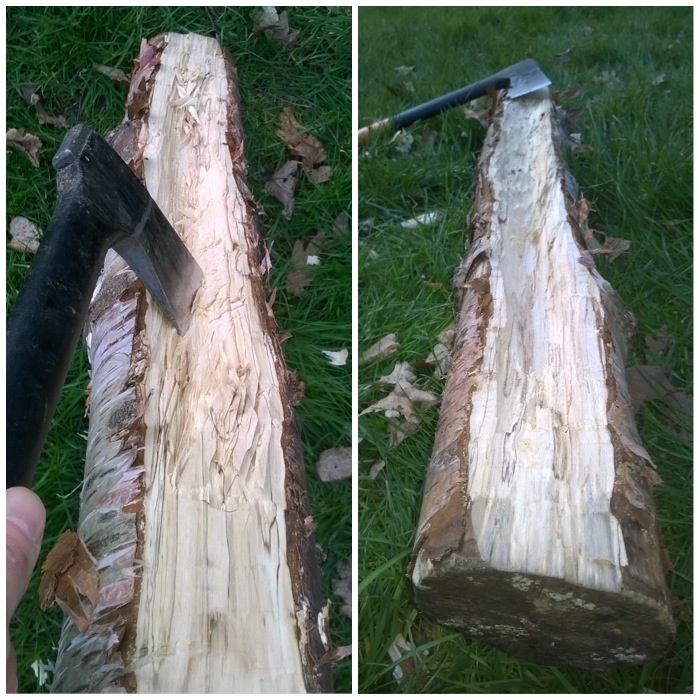 After about half an hour of chipping away at the bark and outer layer of wood I chipped the blade of the adze quite badly. 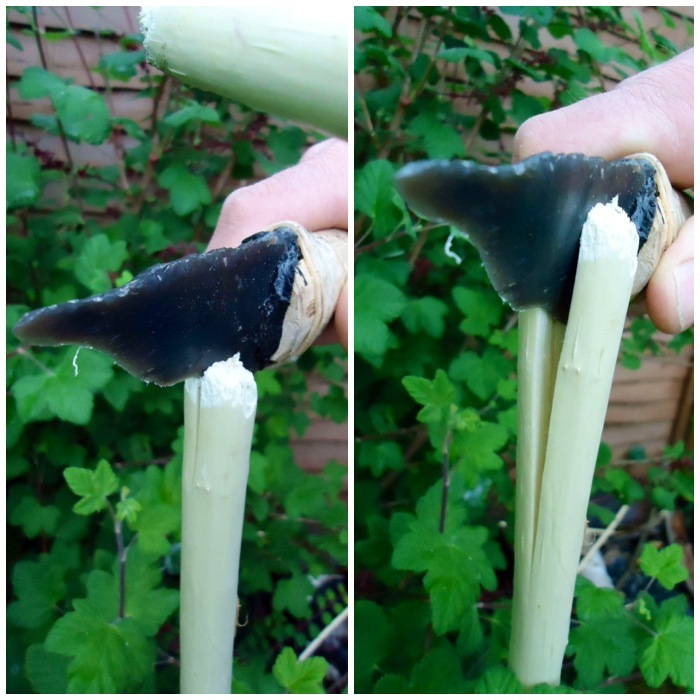 It was quite easy to re-profile the edge with a bit of pressure flaking but I resorted to using a modern axe for carving the flint axe handle. 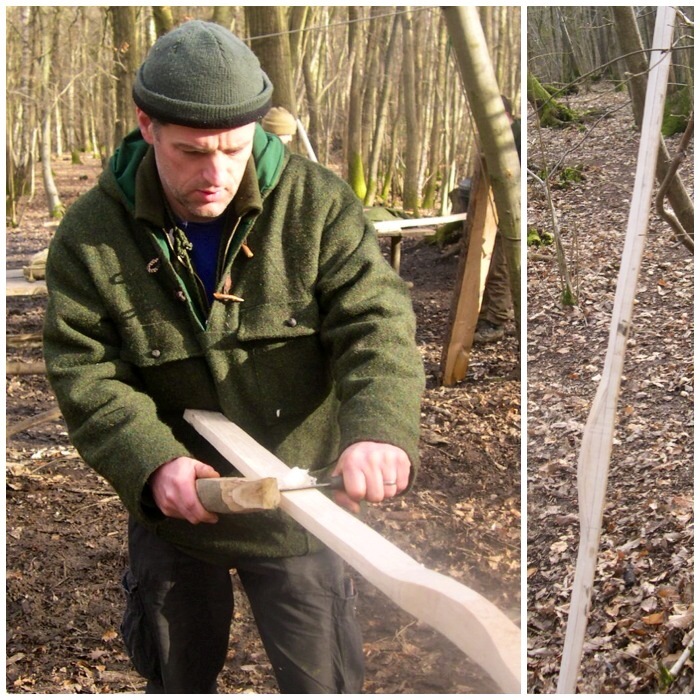 When working with green wood woods like this goat willow the adze worked very well. 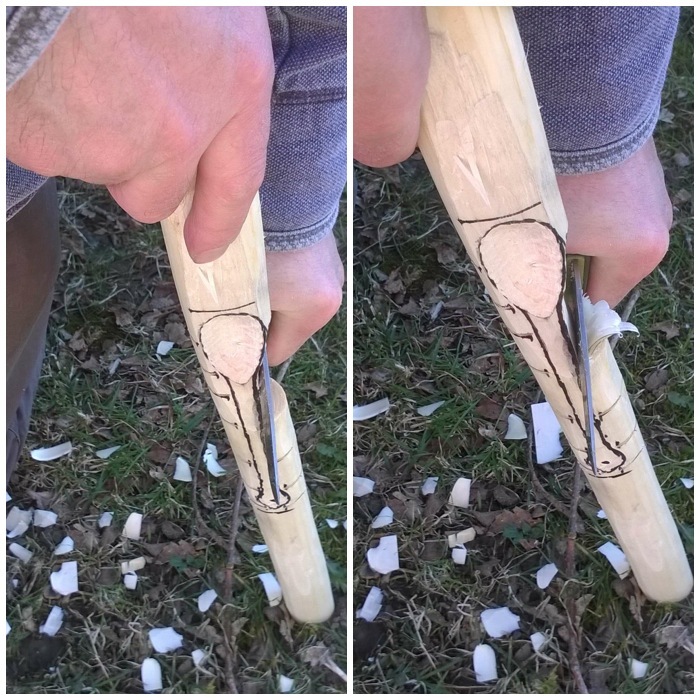 I used the adze here to create a wedge for my Split Stick Atlatl. 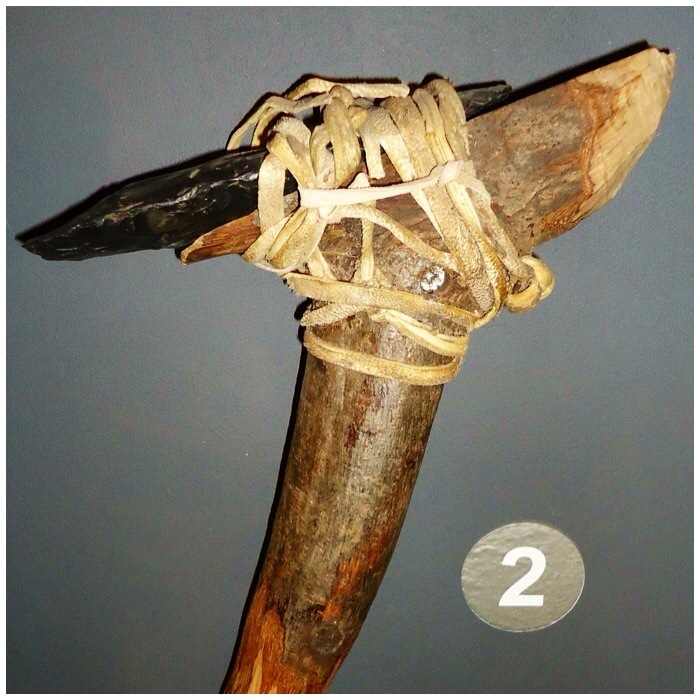 My friends have all been keen to try these adzes out. 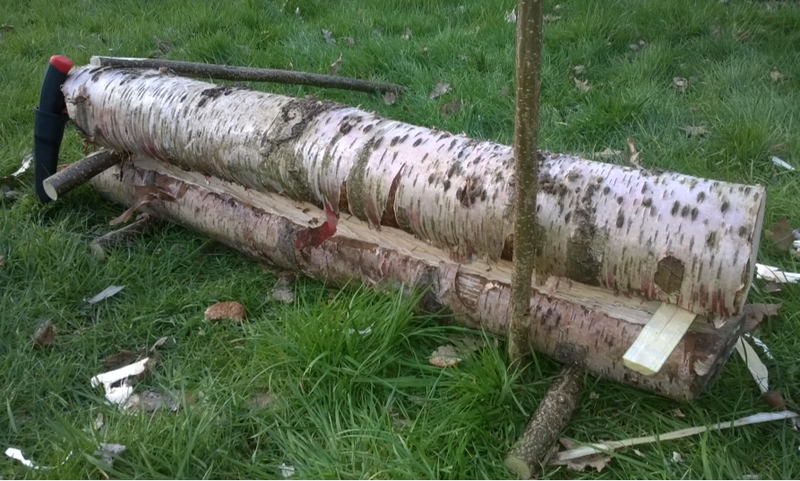 The silver birch that Angela is splitting was fairly well seasoned but still quite easy to cut with the adze. 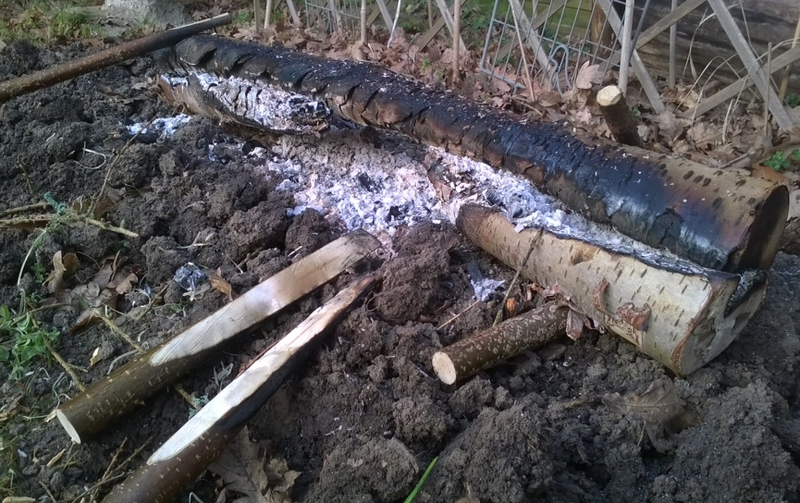 When Angela had the branch weakened enough it was just a case of tap tap and…………………………………..
…………we had two more logs for the fire. 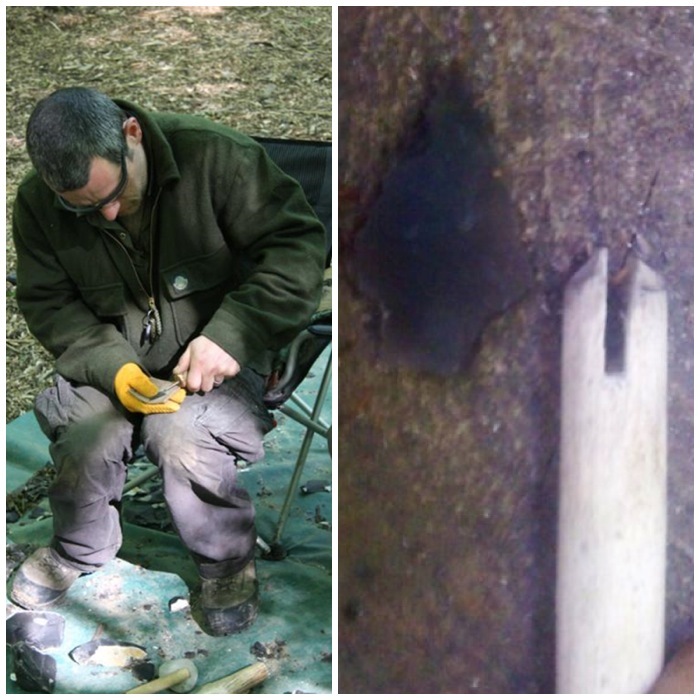 The adze really did come into its own when my friend Stephen Herries found this burnt-out log lying in a ditch. The adze was perfect for chipping out all that charcoal so that in the end I had a rather lovely long bowl to add to my collection. 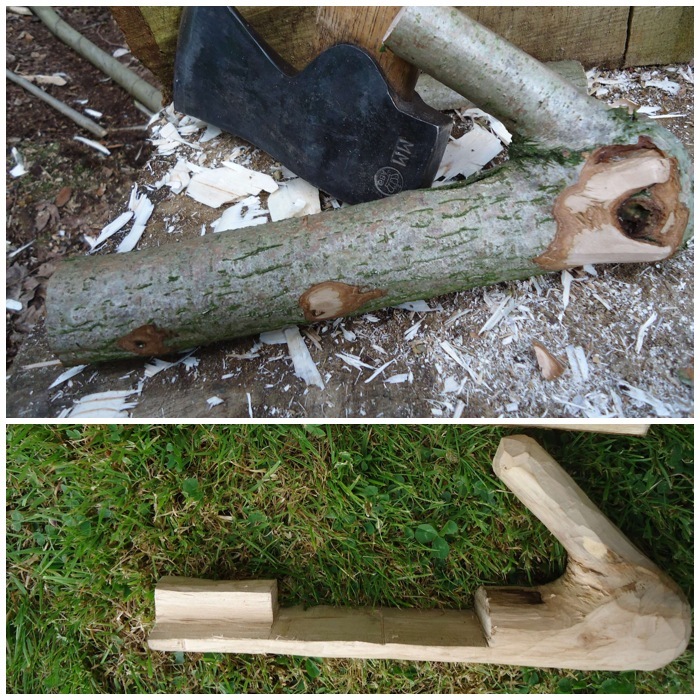 In comparison to a modern steel/iron adze you have to invest more time in whatever you are creating when using a flint adze. 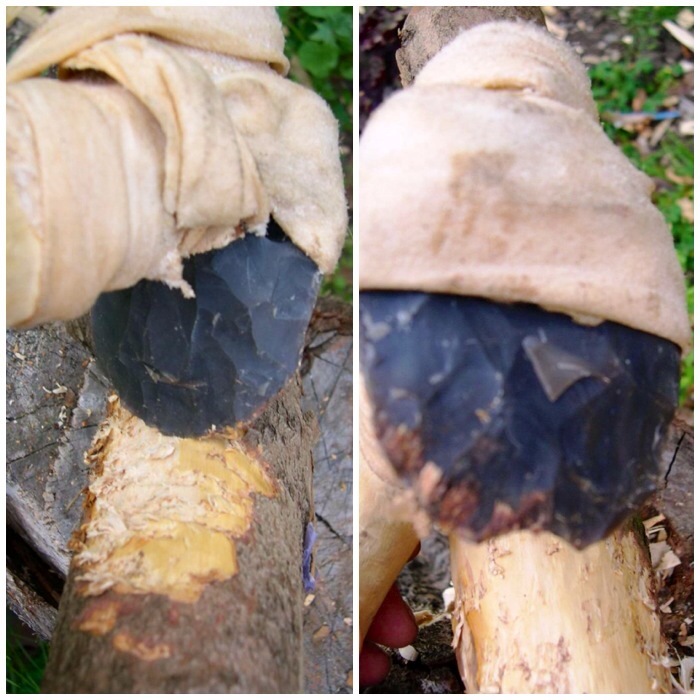 Unlike a modern adze, which will slice wood off cleanly, a flint adze rips the wood off and leaves totally different tool marks. 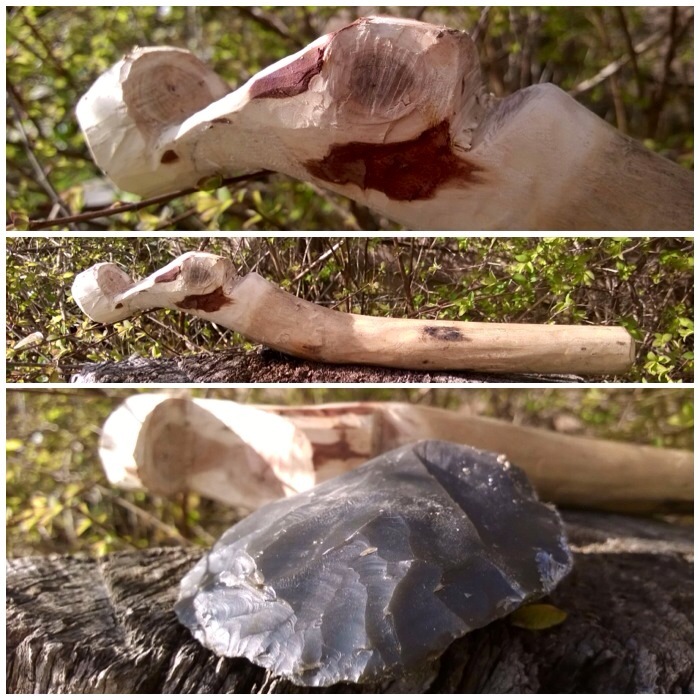 When I want a bowl fast a modern adze is what I use, but if I have the time and I want to create something in a more leisurely fashion then I love to use a flint adze. It kind of takes me back in time I suppose. This post is for my friend Spikey who had one of those Eureka moments that pop up out of the blue. 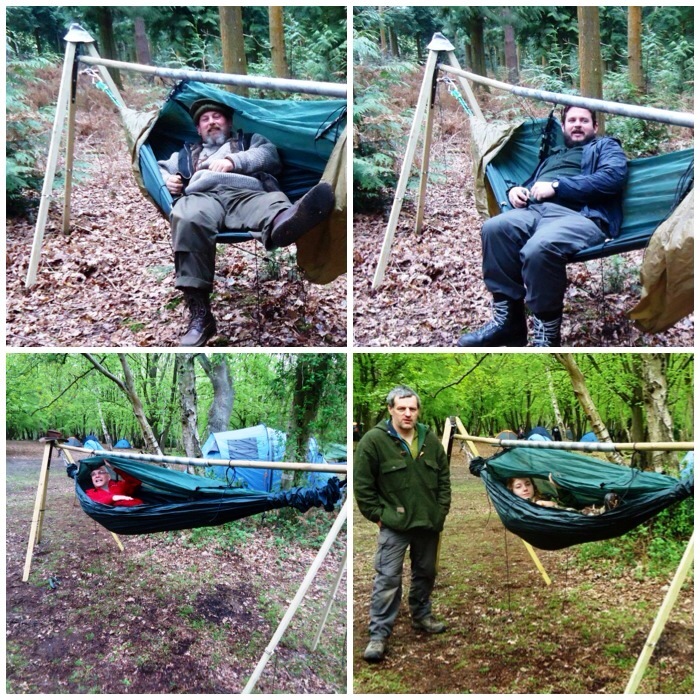 It happened when we were experimenting with the building of a green-wood, free-standing hammock stand at the 2012 BCUK Bushmoot. 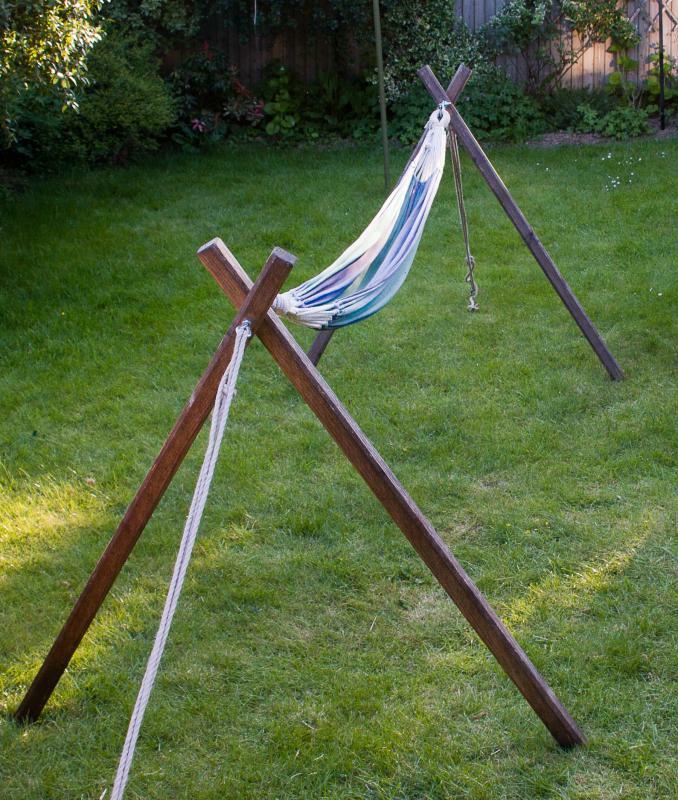 If it hadn’t been for his inspired idea this hammock stand would never have worked. 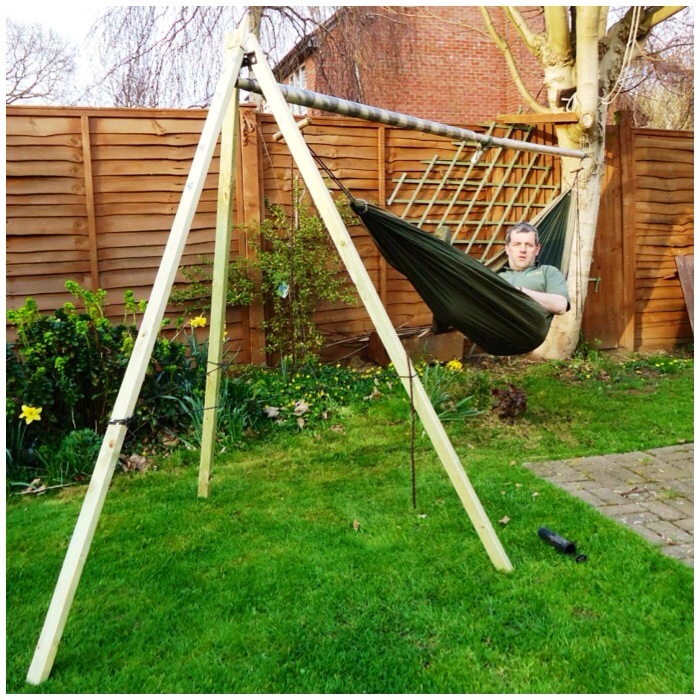 More on that later but to begin with I need to explain how I got into building these free-standing hammock stands and explain a bit more about what they are. 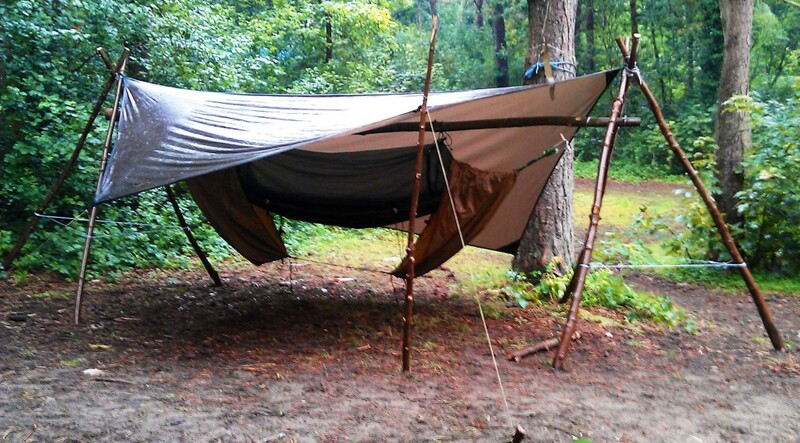 A free-standing hammock stand comprises a couple of tripods with a ridgepole hanging down between them. The ridgepole is not directly attached to the tripods but slung on some Amsteel cordage. I like to use Amsteel cordage as it is fantastically strong, does not stretch easily and is very rot resistant. 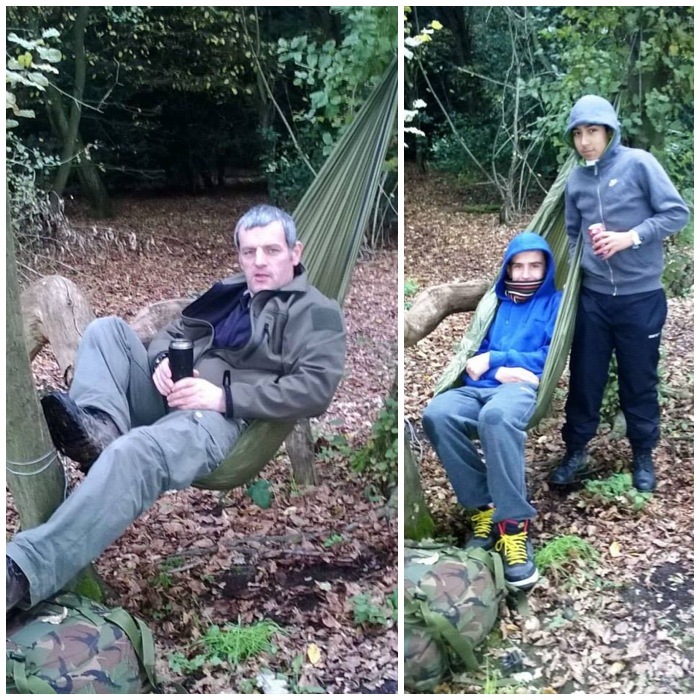 The hammock is tied off to the ridgepole so that the compression forces from someone lying in the hammock are solely on the ridgepole. The tripods only take the vertical forces caused by the person’s weight. As the forces are separated there are no compression forces on the tripods that could cause them to topple over, which means you do not need ground anchors. 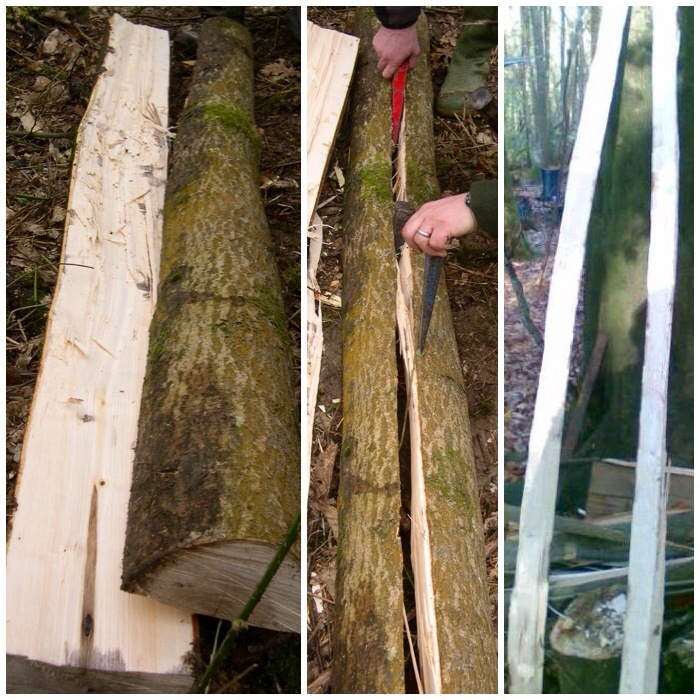 The two pictures below show two free-standing hammocks I made, one with green wood and one from machined wood. To me there is nothing better than finding a nice spot with two perfectly placed trees where you can set up a hammock, have a great sleep and waken up in the morning to a great view. Sadly this is not always possible: the trees may not be placed perfectly, or may not be strong enough to support a hammock, or there may simply be no trees about. 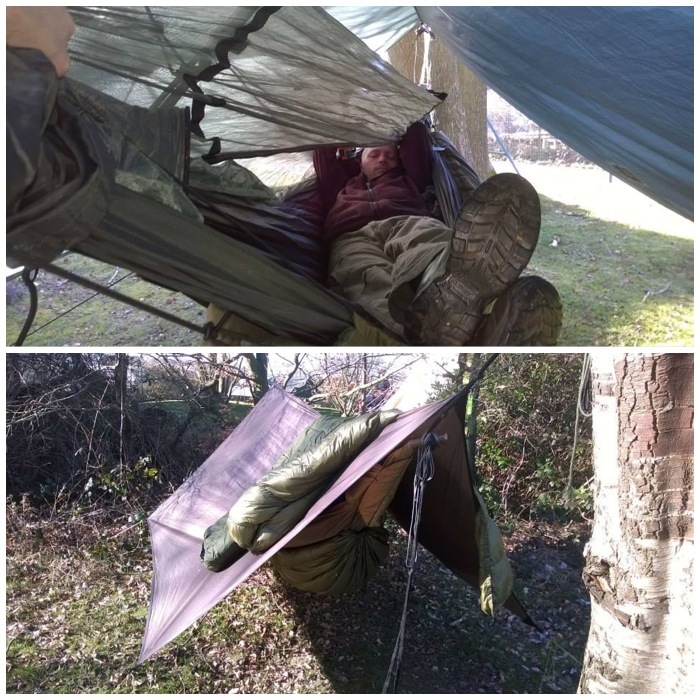 At times like this you have to start thinking out of the box if you want to still sleep in your hammock. 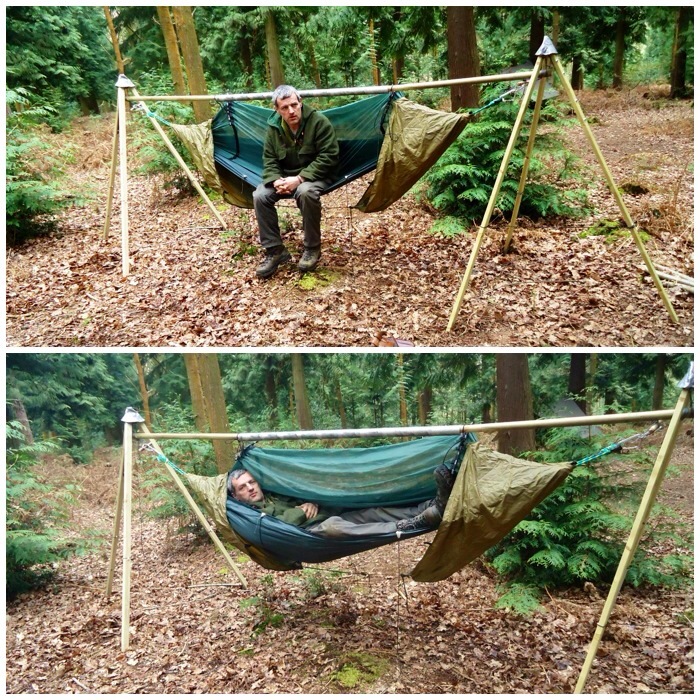 If you have the tools and the ability to transport your own hammock stand you can make something as good as my friend Mat made for displaying his UK Hammocks. I can’t transport or store a hammock stand like Mat’s so I started experimenting with what I called the one-tree hammock stand. 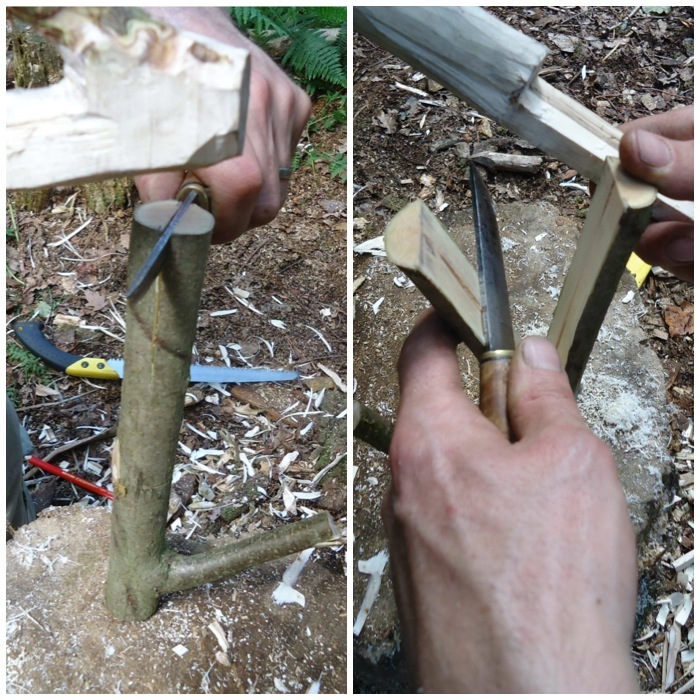 I set up a tripod made of sycamore rods that had lots of wooden anchors to hold the tripod in place. 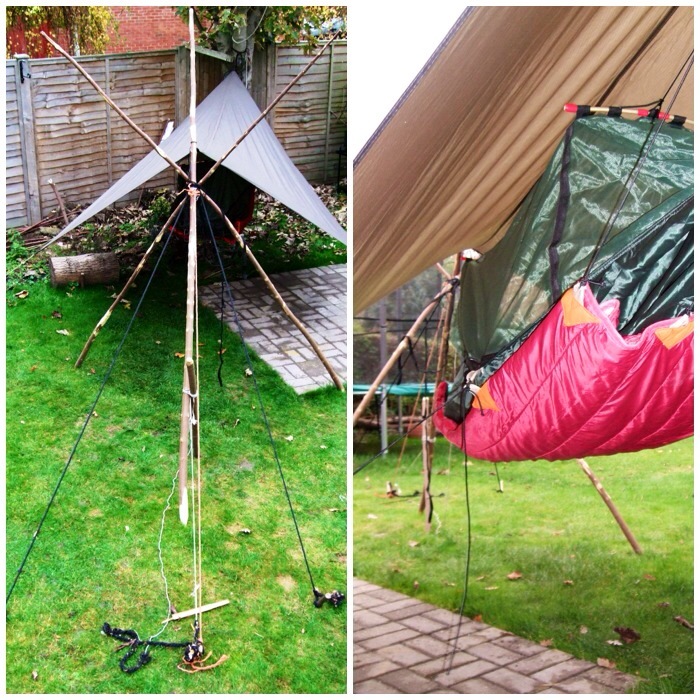 I then tied one end of my hammock to the only big tree in our garden and the other end to the tripod. 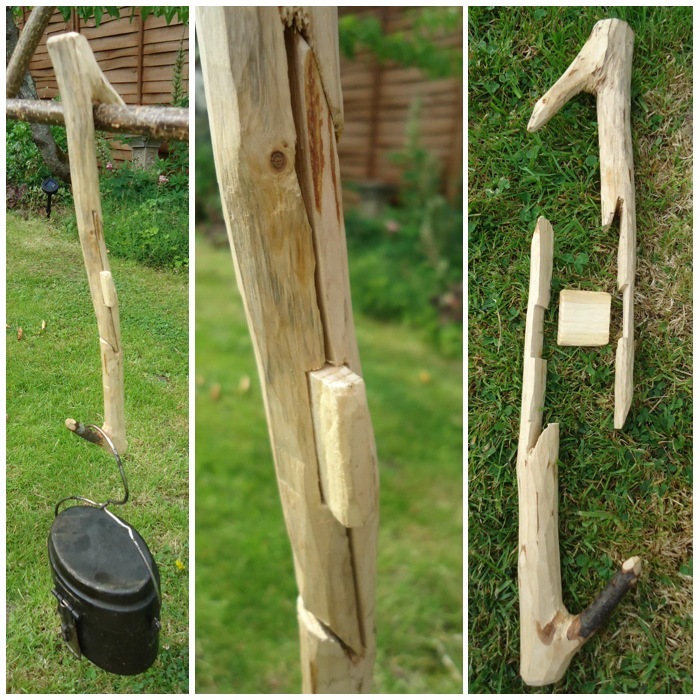 The tripod was held in place by lots of anchor points and worked well until my wife Alison pointed out all the holes I was making in the garden, and muttering about ‘trip hazards’. Not only did I need anchors to stop the tripod from toppling over, I needed to set up further spikes on the tripod to give it extra strength and keep it in place. I suppose this was due to the fact I was using wooden pegs and ropes of different strengths which tended to stretch a bit. 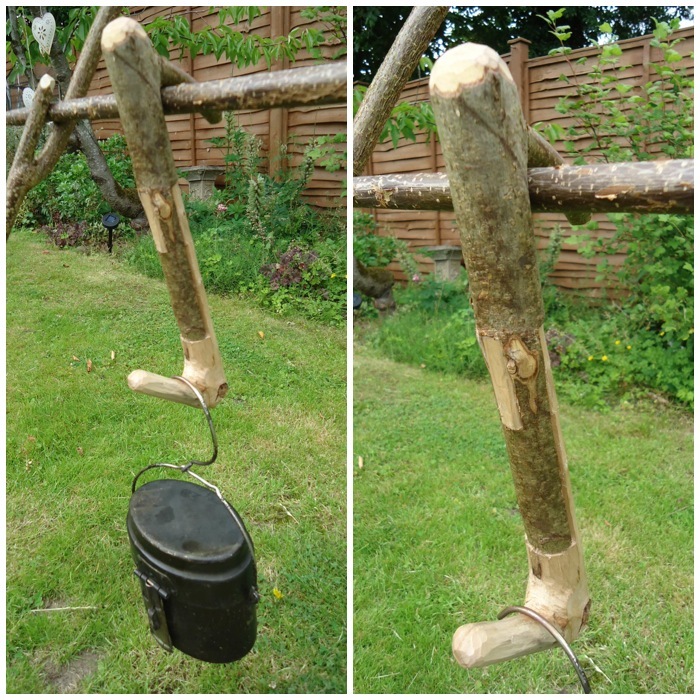 My friend Paul Bradley (Bardster) cracked all this with a hammock stand he made that had 10″ screw anchors and used top-quality non-stretch rope. Paul plans to experiment with delta anchors in the future. I however did not have screw anchors and had never heard of delta anchors. 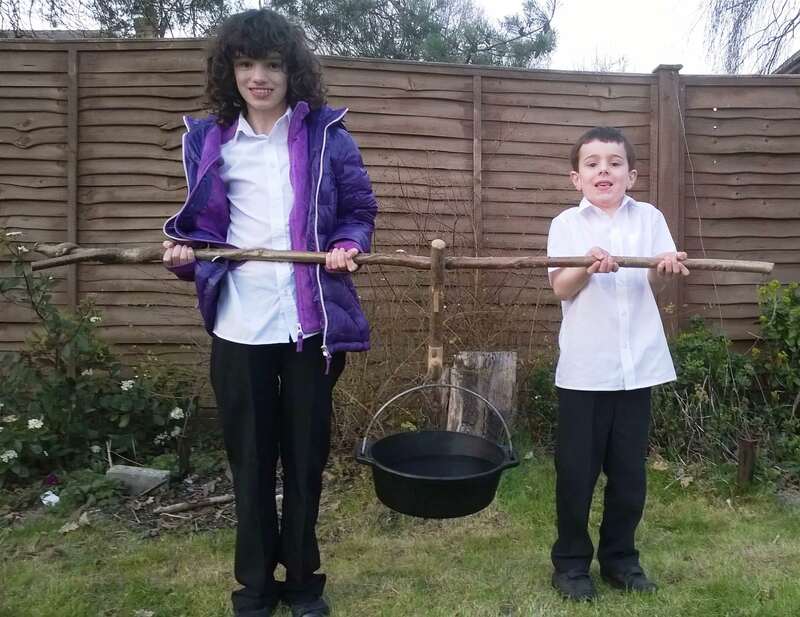 I wanted something I could just put up in my garden for the kids to use, as and when required, something that did not take up much space, was not dependent on land anchors and could be easily transported in my van. 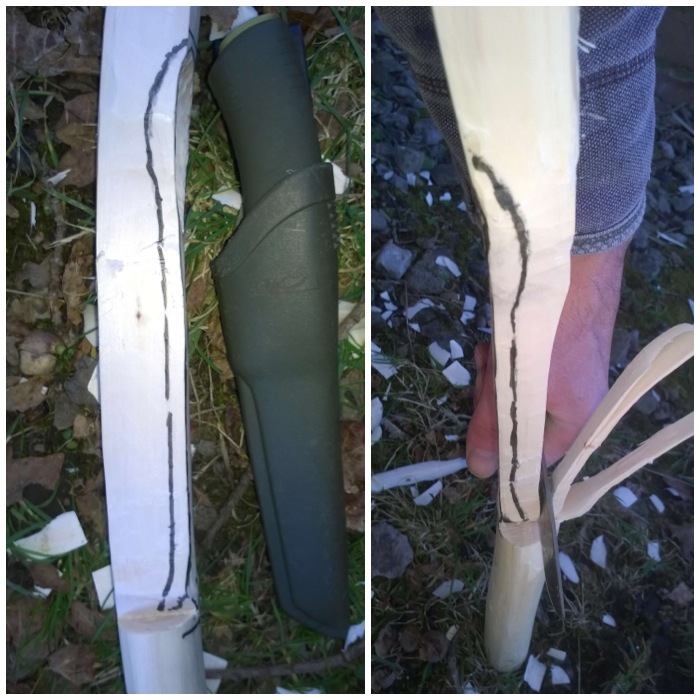 I did though stumble upon a post in the Hammock forum titled Turtlelady’s Bamboo Stand. Turtlelady’s post gave me ideas for experimenting with just one tripod and a single tree. 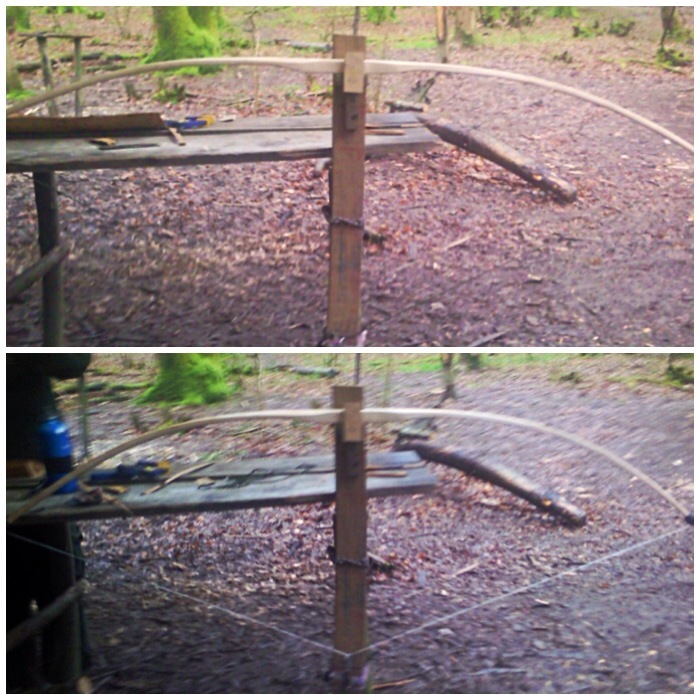 I suspended the ridgepole (two old army tent poles) between the tree and the tripod using Amsteel rope and then slung the hammock directly to the ridgepole. As the hammock was not tied directly to the tree or the tripod the ridgepole absorbed all the compression forces, meaning no ground anchors were required. 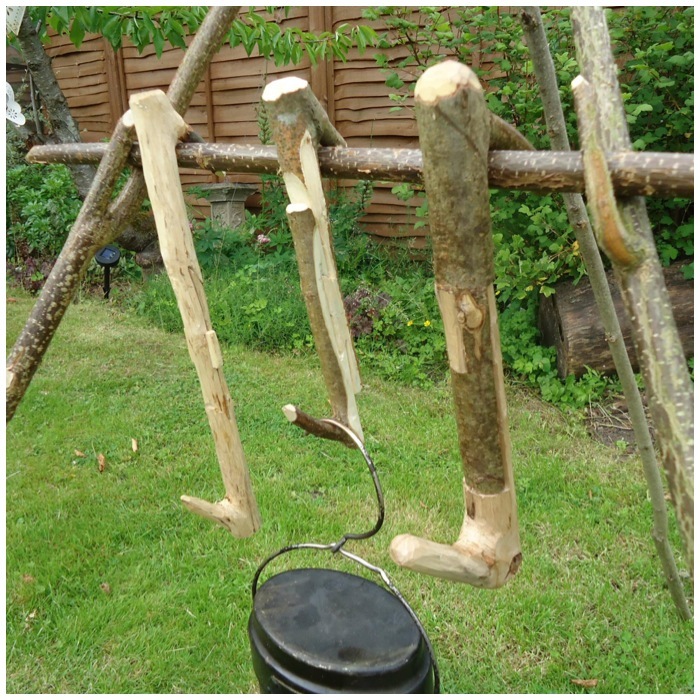 The tripod I made was from ‘Sawn Treated Softwood’. 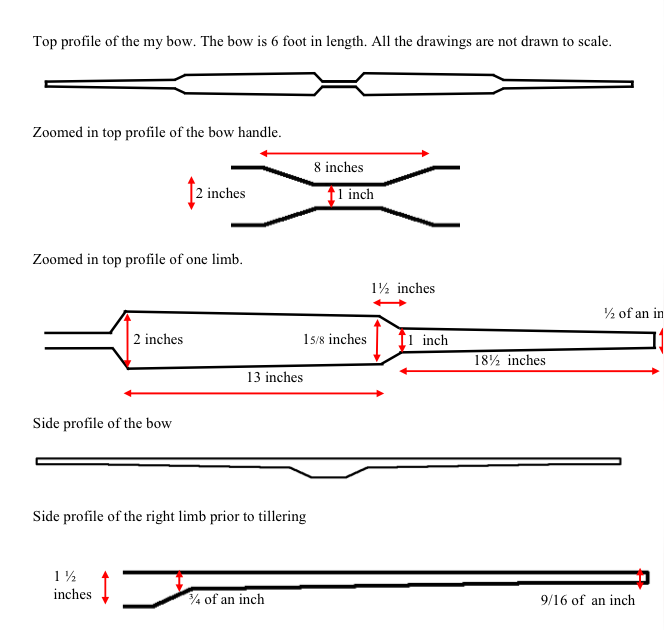 I bought a pack of 8 x 1.8m length pieces (47mm x 22mm) which cost just under £10. 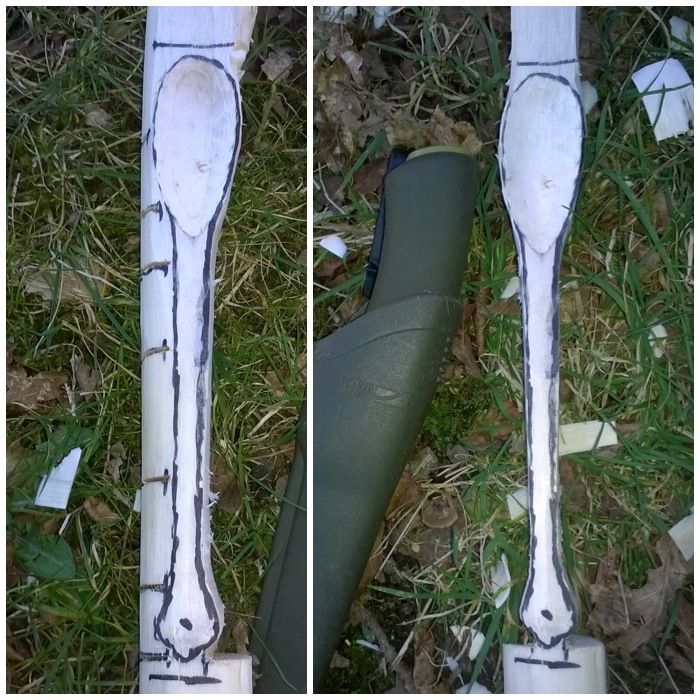 I cut the legs of the tripod to approx. 1m 70cm lengths so as to fit easily in my van. To connect the tripods I used a ‘T’ Hinge (about 45cm in length) at a cost of about £2.50. 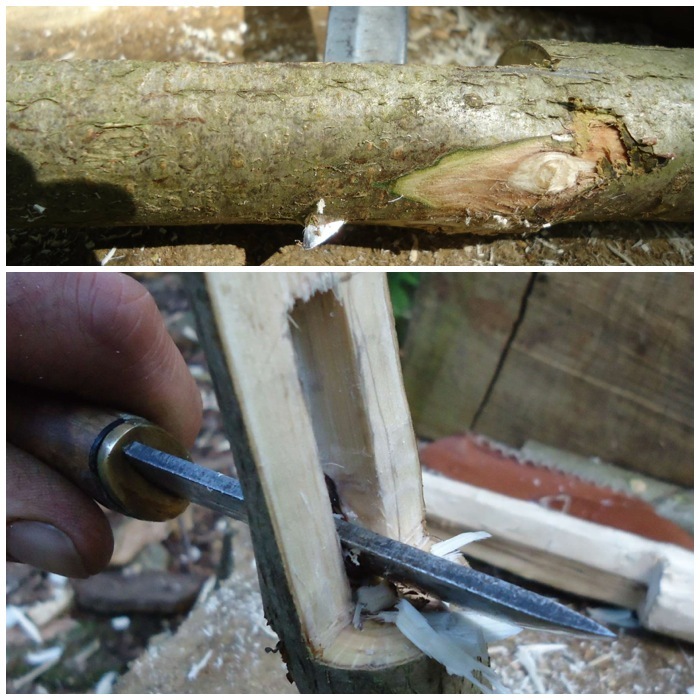 I attached the hinge to one of the legs using bolts of about 4cms (cost about £3). 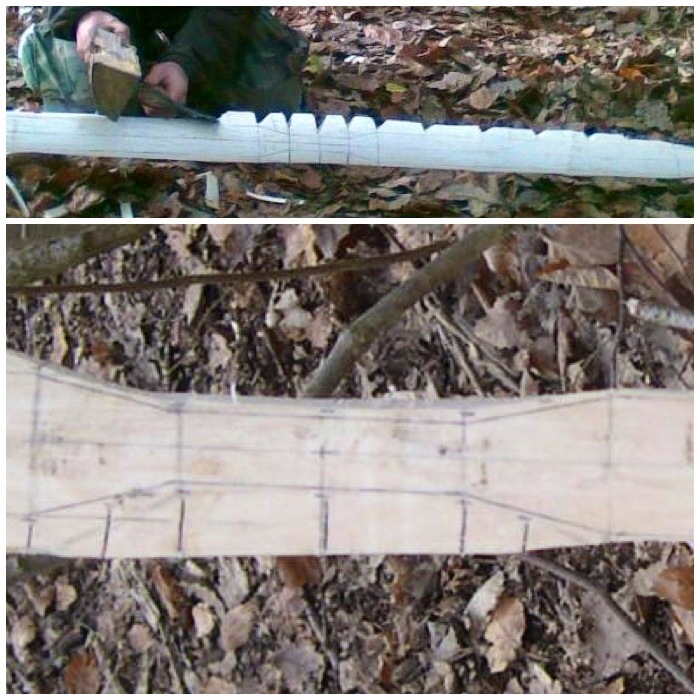 As you can see in the top right picture below I shaped the wood as best I could so that when the tripod was open the tops did not touch each other. I used Amsteel rope to connect the ridgepole to the tripod. As you can see the ridgepole is hanging off the centre tripod leg on a length of Amsteel. I bought 5 metres of Amsteel rope for this job costing me about £5. The other end of the ridge pole I hung directly from the tree (I now use a hammock strap to go round the tree and tie the Amsteel rope directly onto the strap). This tree has a handy branch coming off the side to tie directly onto, allowing the rope to hang down directly. 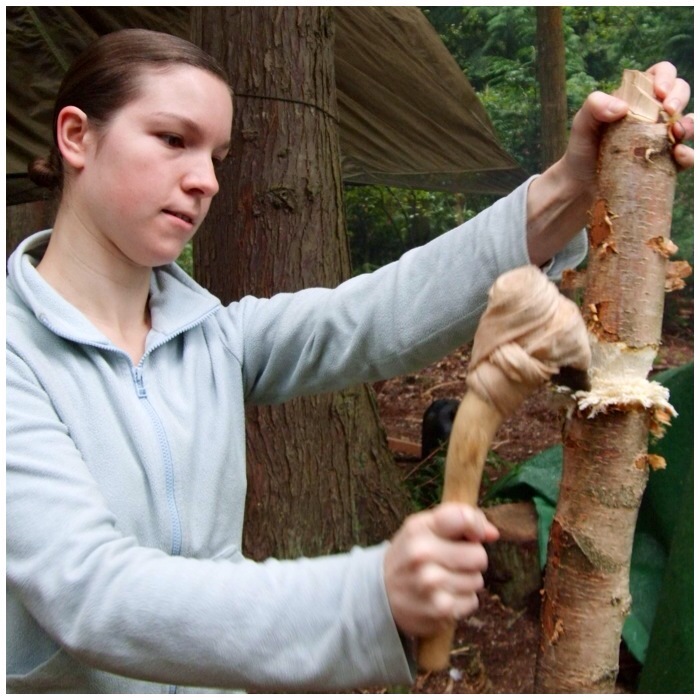 Where you have only the trunk of the tree, a strap grips the bark better than just cordage. 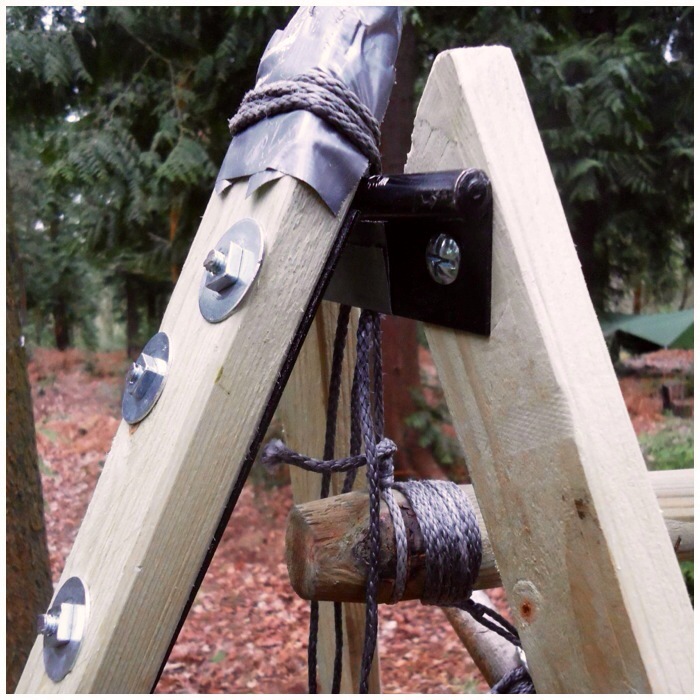 Finally I tied off some old guyline rope around the tripod legs to stop them splaying out when they were under load. After testing out the one-tree set up I made another tripod and changed the ridgepole. 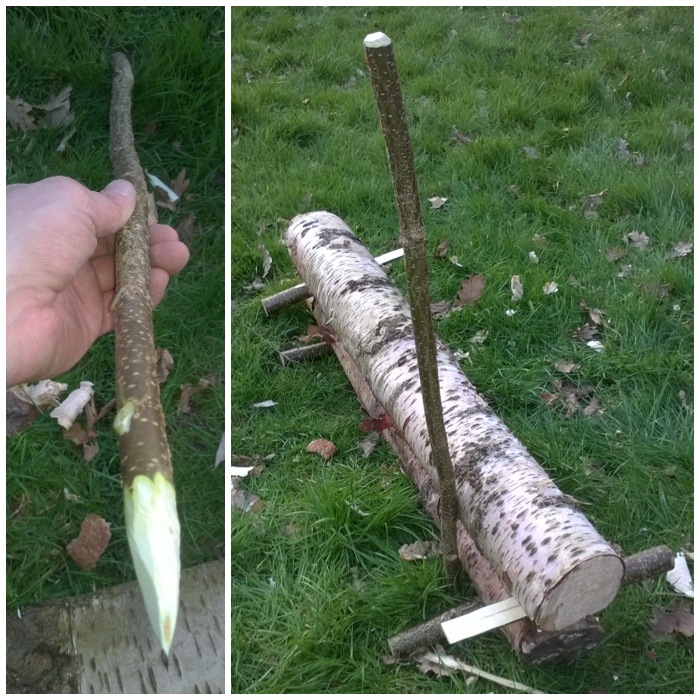 I made the second ridgepole from two large tree stakes from from a local garden centre (cost about £3.50 each). 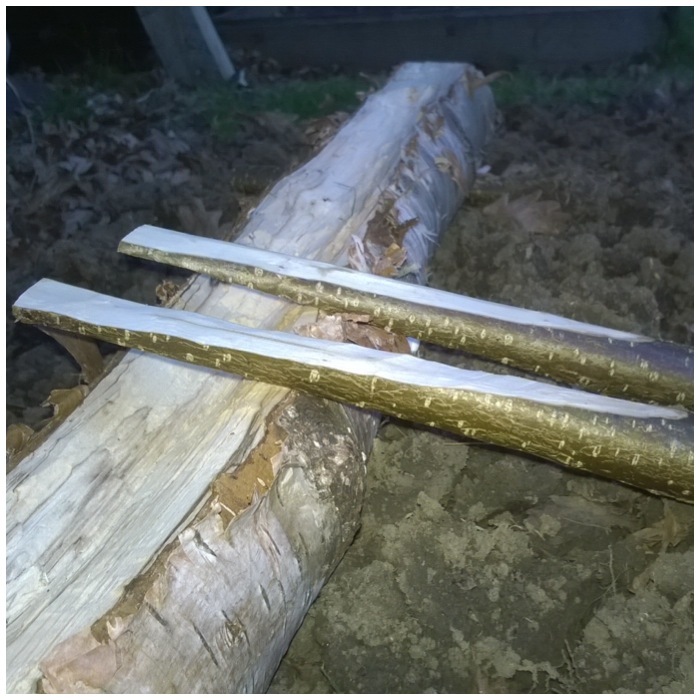 Each stake was 1.8m x 40mm but I cut each one down to 1m 74cm to get rid of the points. 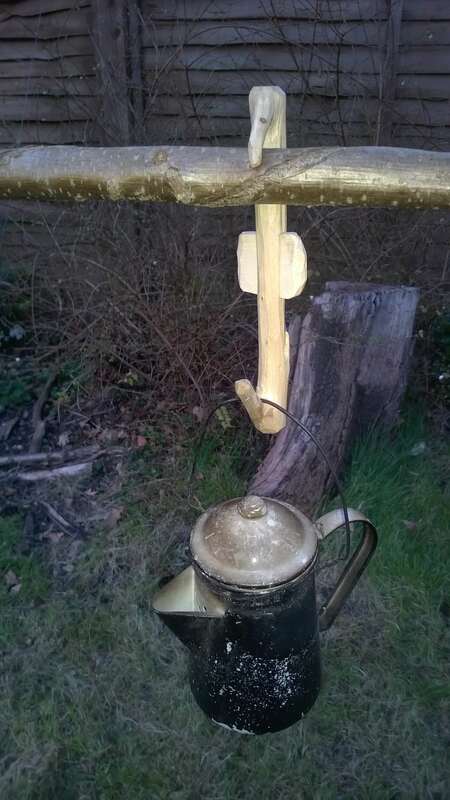 I connected the rods with an old army aluminium tent pole. 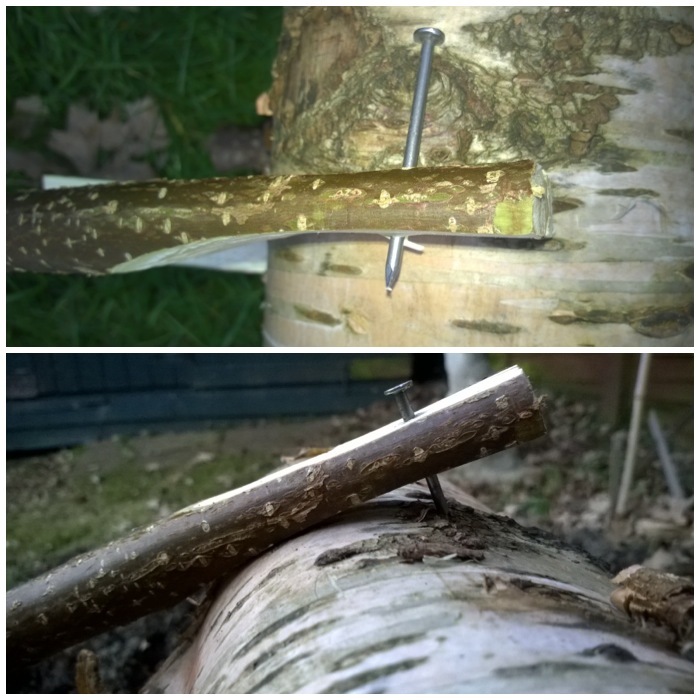 I cut the ends off the tent pole to allow it to slip easily over the tree stakes. 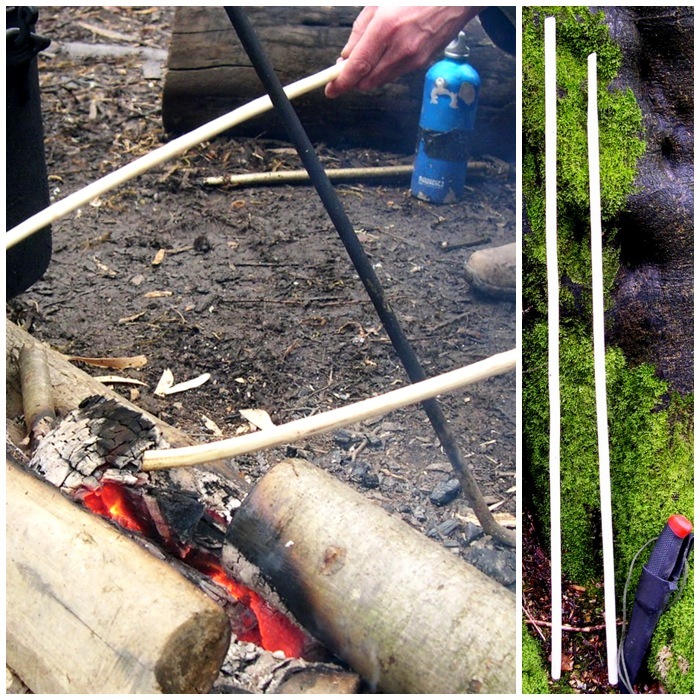 I saw these old army aluminium tent poles for sale on eBay for about £6 (a single ridgepole would never have fitted it in my van). Below you can see both tripods collapsed and ready for transport and one of them set up. 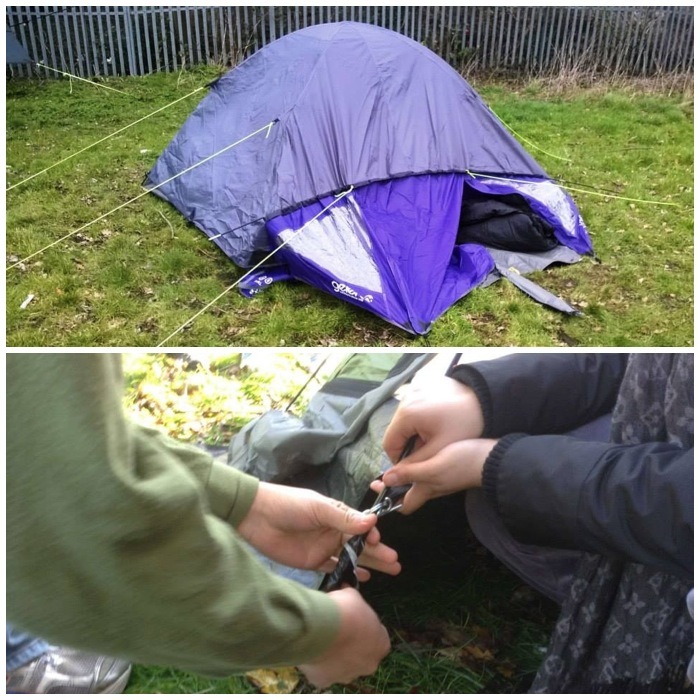 The little caps you can see in the left-hand picture are protectors for a tarp. 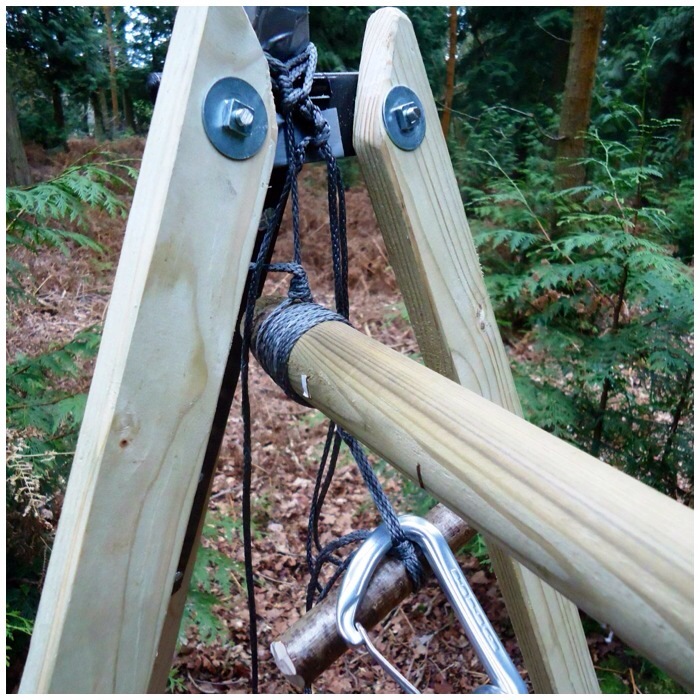 Below you can see a close up of the ‘T’ bar hinge set up and how the ridgepole is connected to the tripod. 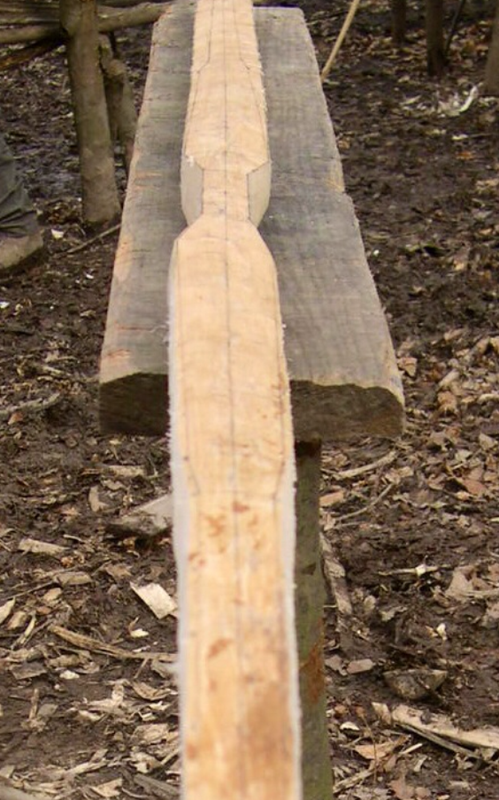 I carved 3 grooves all the way round the the ends of the ridge poles to give the Amsteel rope something to grip onto. 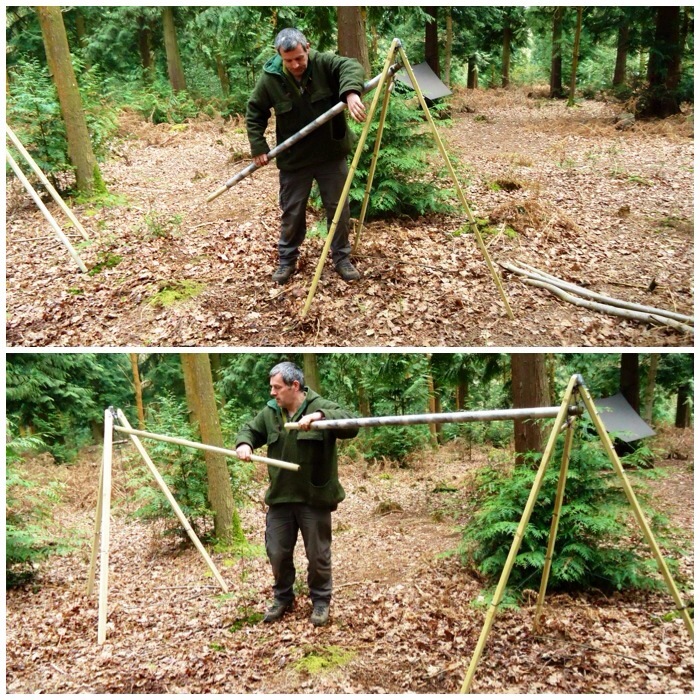 The ridgepole is attached by means of an adjustable loop that is hung from the tripod and around the first groove on the ridgepole. 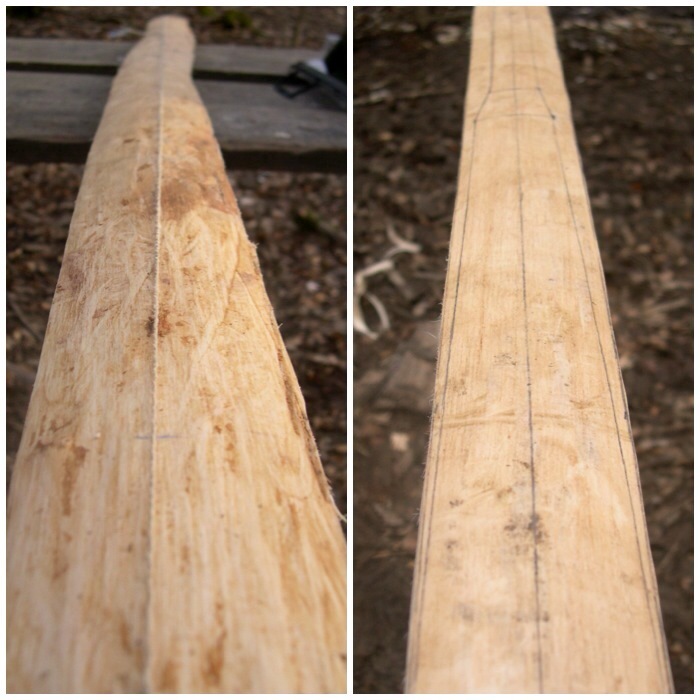 The wrapping of Amsteel you can see on the ridgepole is a common whipping that is wrapped around the area where I had carved the other two grooves. 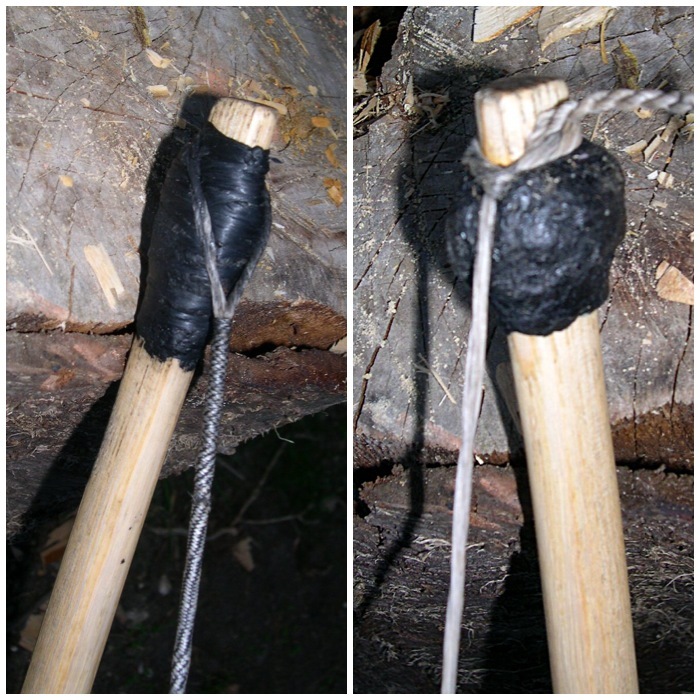 This whipping has a tail on it that can be used to create a marlinspike hitch to allow the hammock to be hung off. 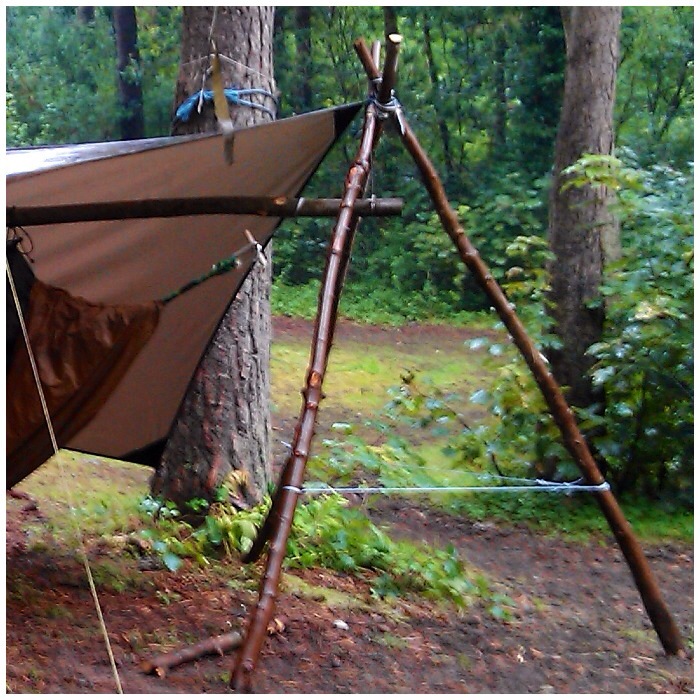 Below you can see the marlinspike hitch and the hammock clipped to it with a carabiner. This set up makes attaching the hammock very easy and the common whipping ensures that the Amsteel does not slip when I get into my hammock. 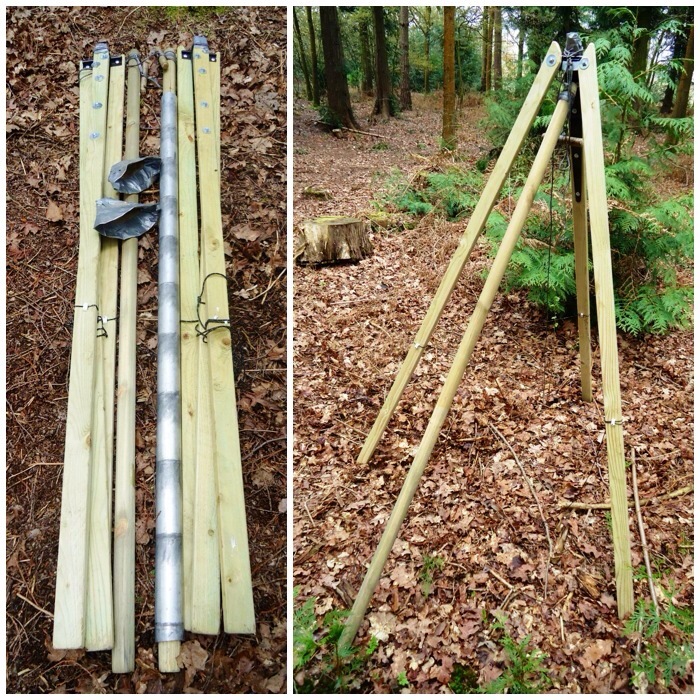 To put it all together I simply open up the tripods and place them roughly the correct distance apart from each other (the length of the two ridgepoles). 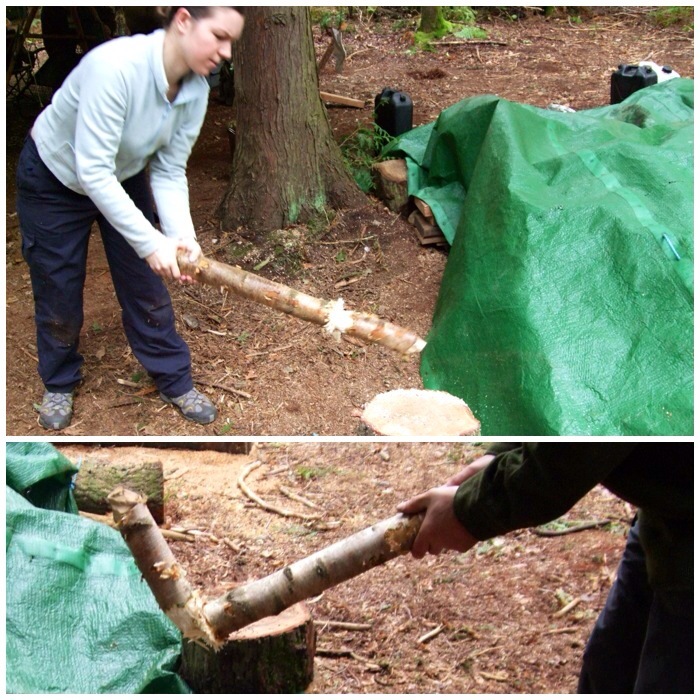 I then connect the two ridgepoles with the tent pole sleeve. I usually re-position the tripods so that the two ridge poles are touching inside the sleeve and that the Amsteel rope attaching the ridgepole to the tripod is hanging vertically. 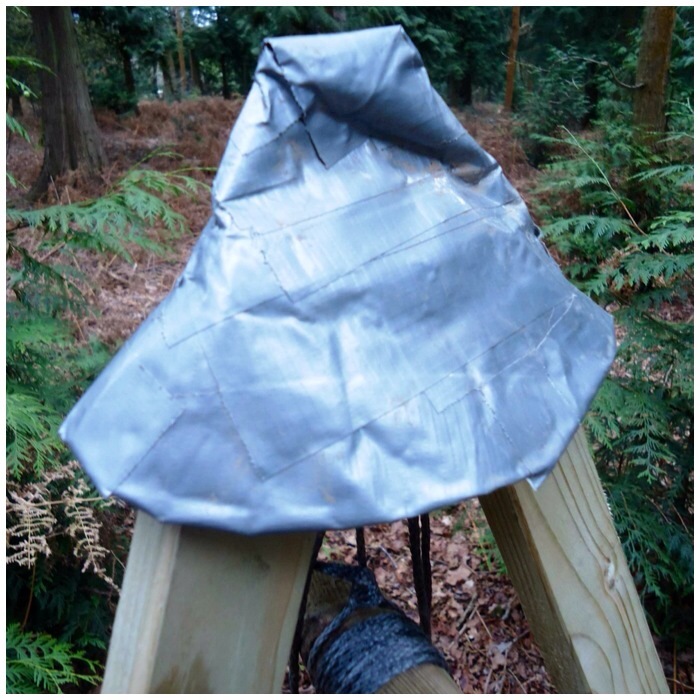 As the tripods are not that far apart the tarp will actually lie on top of them, so I made a cap for each so that the wood would not damage the material. I took an old hessian sack and cut off two of the corners, then covered these corner pieces with duct tape to make them more durable. Whenever I use a hammock, whether slung between trees or tripods, I always test it by pushing down on the material of the hammock first, then I sit in it gently before finally lying back into it. 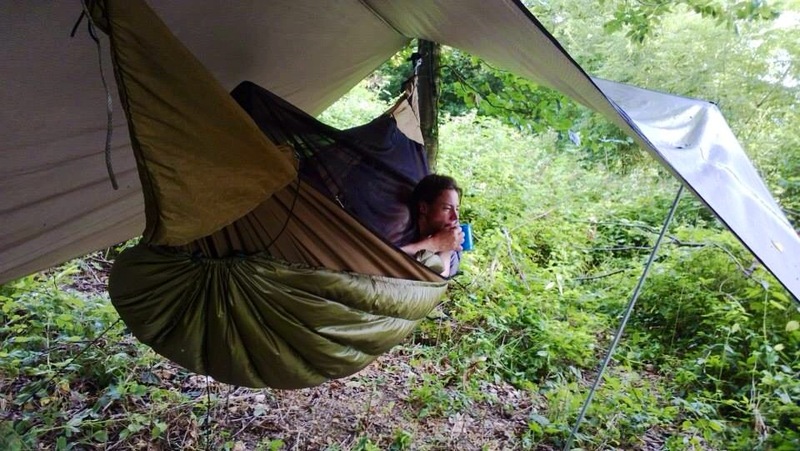 This tests all your knots, tightens them up and gives you confidence that everything is ok.
With the free-standing set up what you need to watch for is the ridge pole over-bending with the compression forces you are placing on it from lying in the hammock. 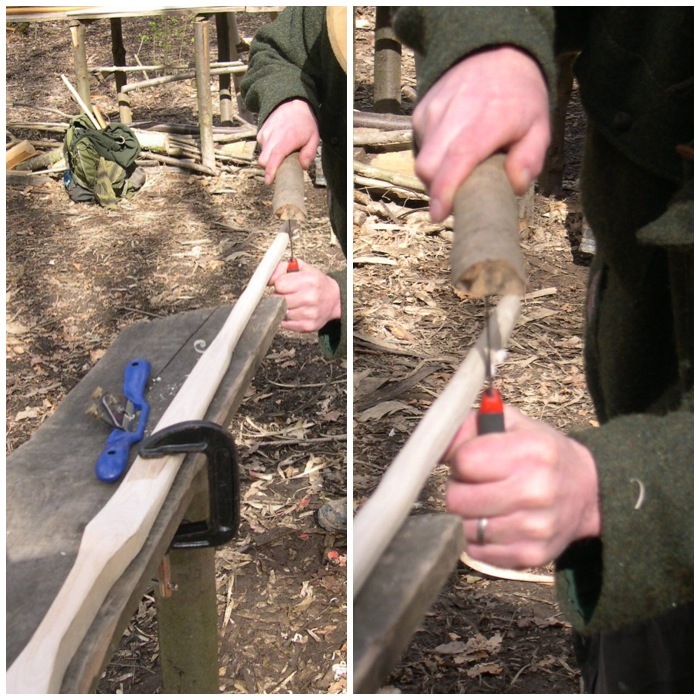 In this set up the old tent pole sleeve is so strong that there is very little bend in the ridgepole. 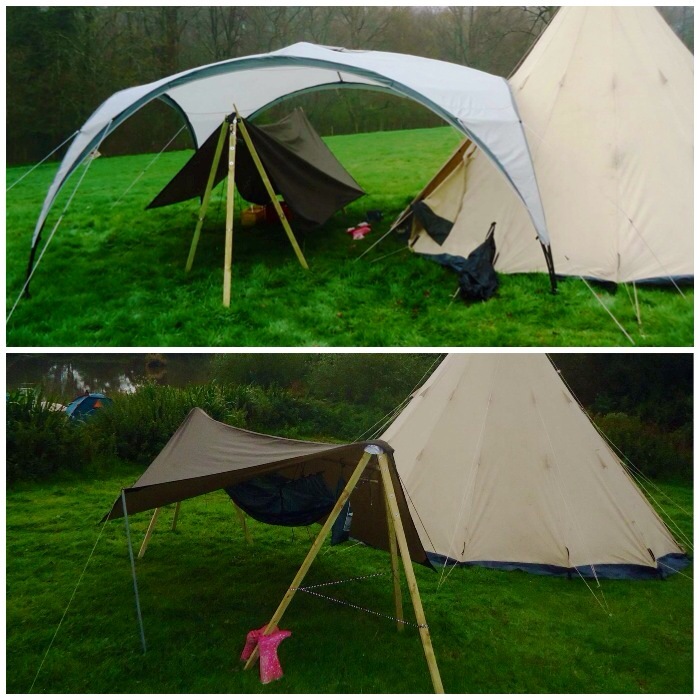 I weigh about 14 stone (including all the kit I generally wear while bushcrafting) so if it takes my weight easily I am happy for my kids to use this set up. Over a few months I used this hammock at various meets and got different people to test it out. 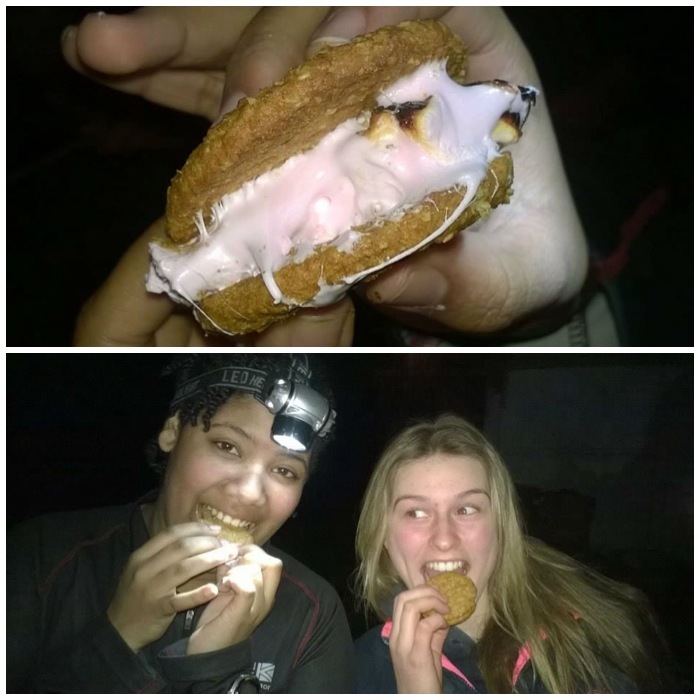 After some initial trepidation most people got on well with it. 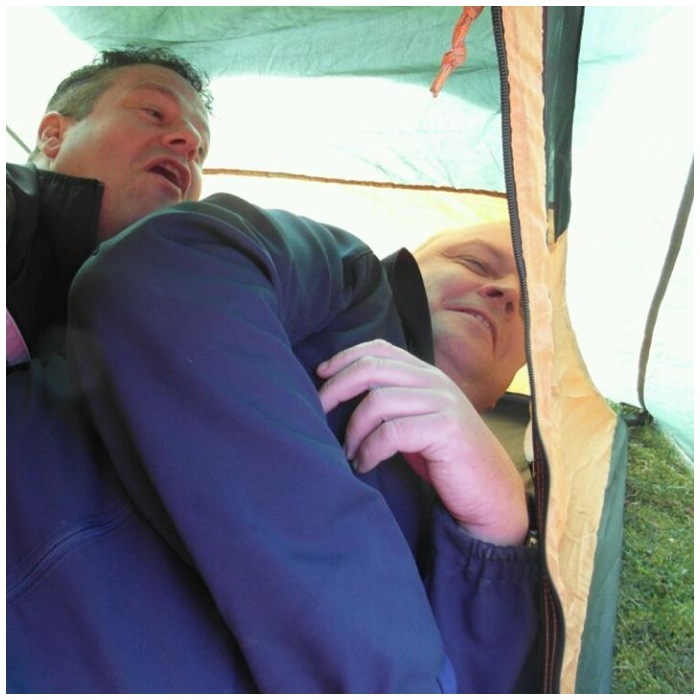 You just have to remember not to bang your head on the ridgepole when you get up. Setting the tarp up on this is quite simple as I just lay it on top of the tripod caps and peg it out. 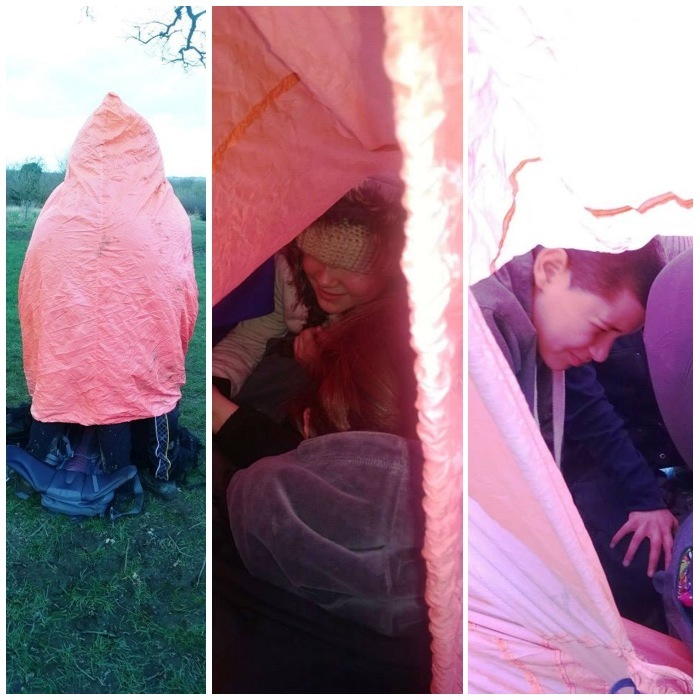 The first night I slept in the set up I put it under our group shelter as it was very windy and wet. I figured if the tarp came off in the night the big shelter would offer me some protection from the rain. I slept well that night apart from wakening a couple of times to the creaking of the ridge pole as I changed position in my sleep. I have got used to these noises now and trust the ridge pole to take my weight. Now I am happy to set this up with just the tarp for cover. 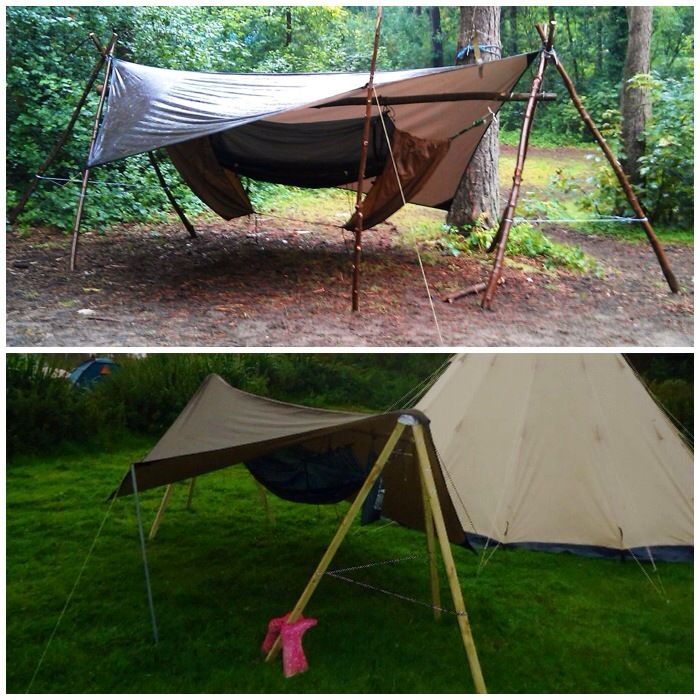 In the bottom picture I had the hammock stand set up at the Wilderness Gathering last year for my daughter to use as a nest to go and relax in during the day and for visitors to come and see the design. 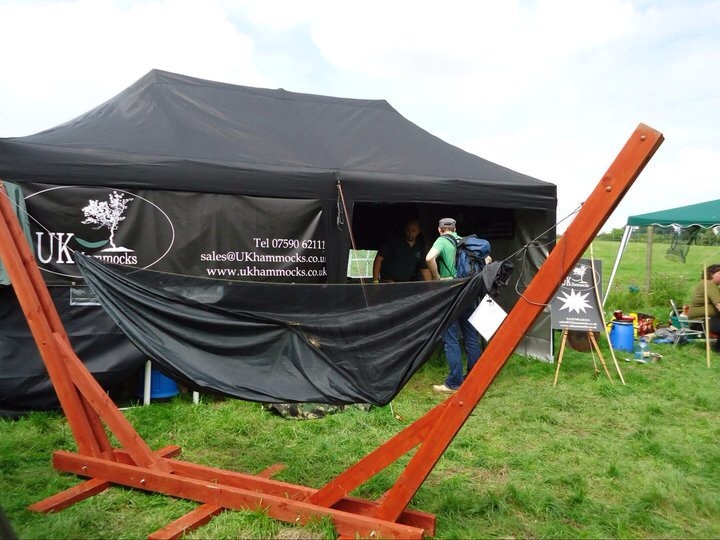 Back in 2012 I had promised some of the guys at the BCUK Bushmoot I’d bring the stand along for them to look at. In all the usual confusion of preparing and setting off for the Moot I forgot to put the stand into my van. 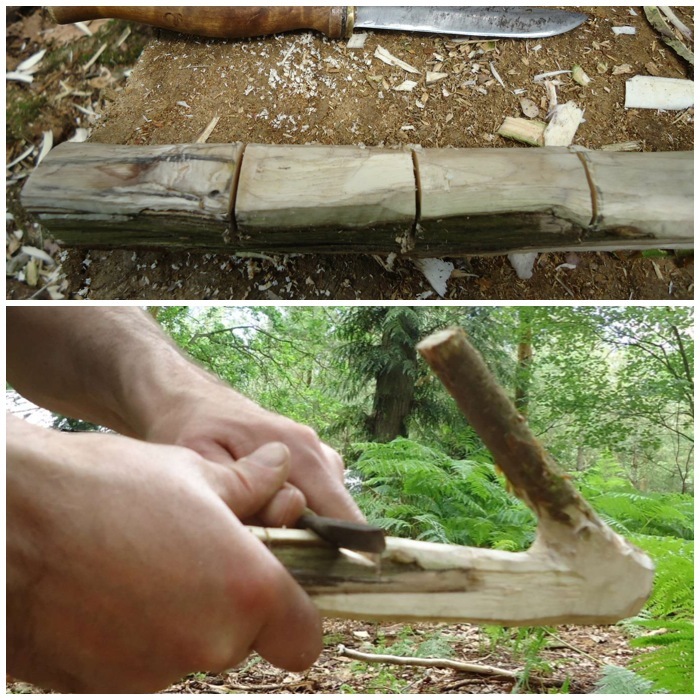 Undeterred, I decided to try and make a similar stand using sycamore poles, of which there are plenty on the site at Merthyr Mawr, so I set off to gather the wood I would need: this is when my friend Spikey spotted that I was up to something and asked if he could help. 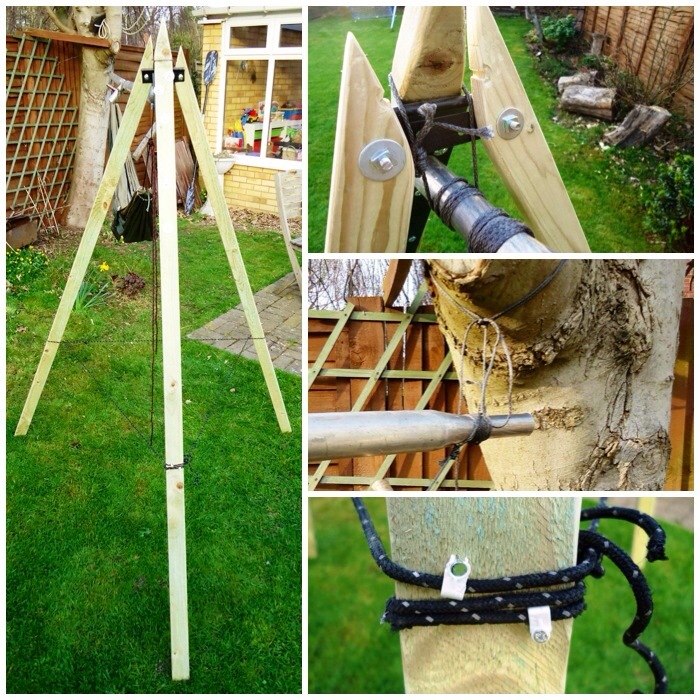 After I explained the concept Spikey helped me cut the poles to make up two tripods. We lashed the tripods with Amsteel rope and made little adjustable loop danglers to hang from each tripod for a ridgepole. 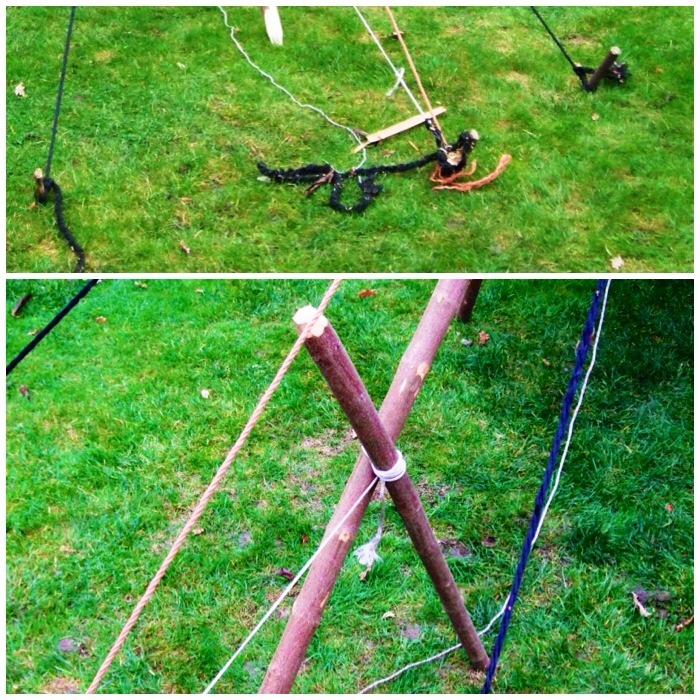 Also each tripod had rope tied around each leg to stop them from splaying out when put under load. We tested each tripod by both doing pull ups together on each one. Our combined weight is about 28 stone so we were quite happy each tripod would be up to the job. 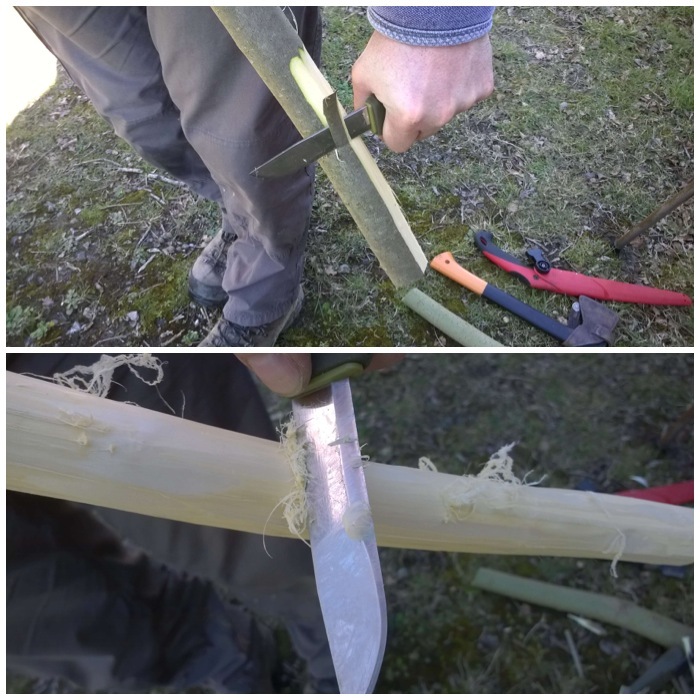 I did not have a handy old army tent pole to act as a sleeve for the ridgepole this time so I had to find a length of sycamore that was long enough (about 3.5 metres) and strong enough not to bend with the compression forces. I wanted a piece that was fairly uniform in girth along its length and as straight as possible. Spikey and I spent quite a few hours trying to find this perfect pole but when we found a couple that seemed to be ideal they both bent horribly when a load was applied. I did not want to put a massively thick ridgepole above my head and was getting quite frustrated at this point. 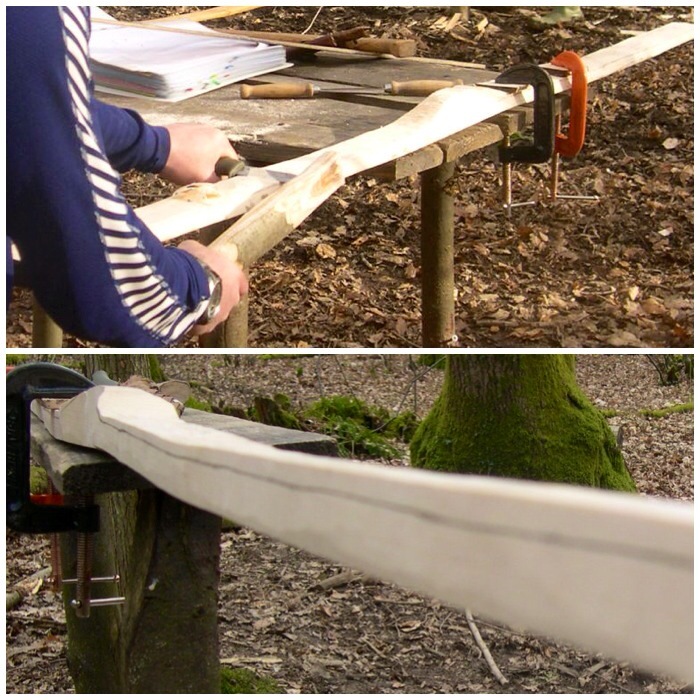 It was at this point Spikey had his Eureka moment: ‘Why not try and find a piece of sycamore that’s oval shaped instead of round?’ I could see what he meant – an oval pole would have two sides with fairly flat surfaces and two sides with sharply curved surfaces. These sharp curves would take far more load without bending than the flat surfaces, so off we went to find this magical ridgepole. 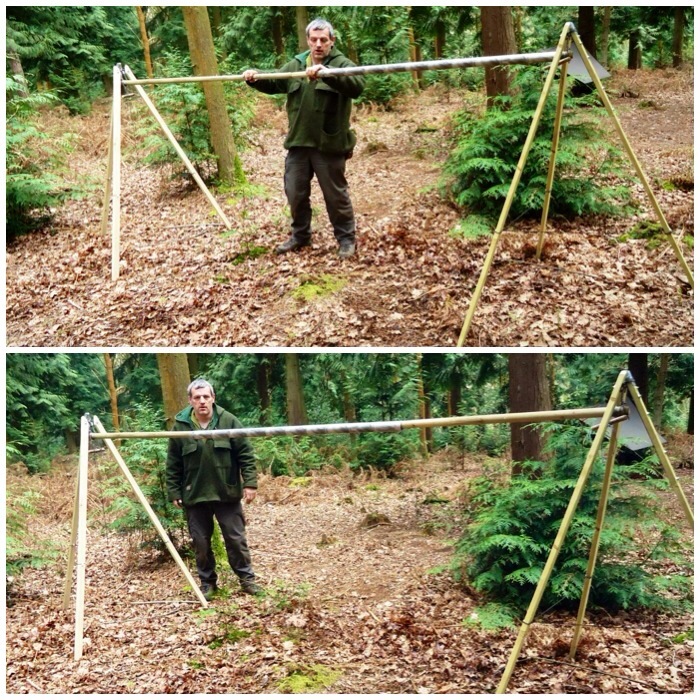 As you can see below we found it, and set it up so that the ridgepole hung beneath each tripod. I attached more Amsteel with some simple whipping to each end of the ridgepole for the hammock to hang off and slung my tarp over it all. 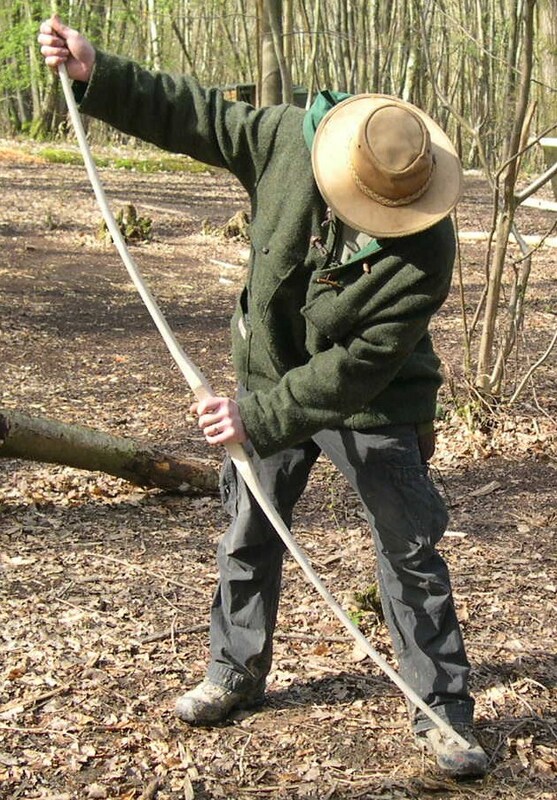 The ridgepole hardly bent as the sharply curved sides of the pole were very rigid. I got lots of different people to try this set up out and it took the weight of everyone who tried it out easily. I slept for 5 nights in this set up and had a great sleep every time. I like the fact now that if I am stuck for somewhere to sleep in my hammocks (if for example there are no lovely big trees around) I can now set up a system that will still keep me well clear of the ground. 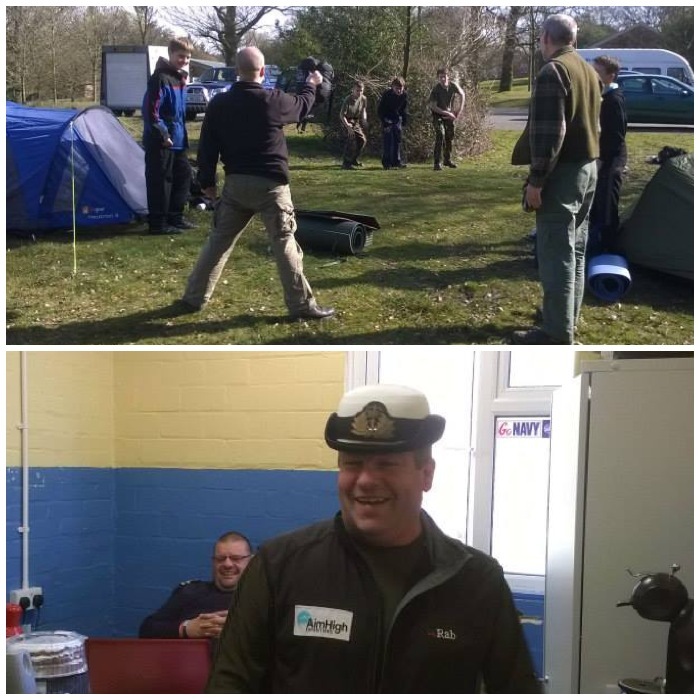 The London Area Sea Cadet Adventure Training has run over the last few years a couple of Level 3 Certificate in Basic Expedition Leadership (BEL) courses for our instructors. This is a nationally recognised qualification and we as a team have worked very hard with the trainees to get them trained up and assessed. 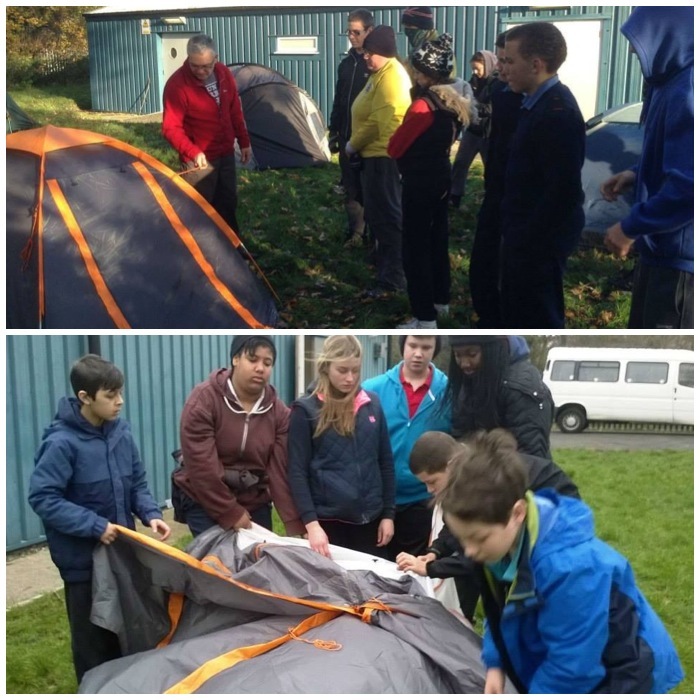 Our training team in the London area has grown quite a lot now with more and more camps taking place. 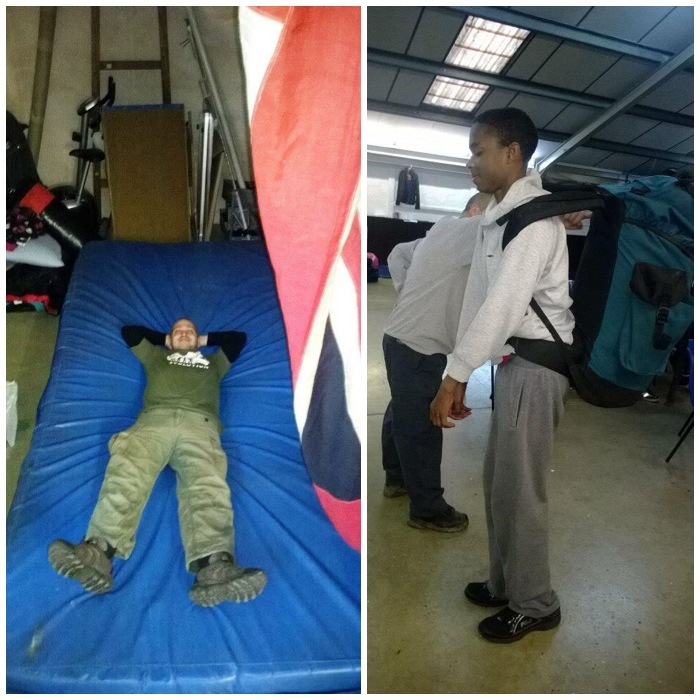 The downside to this was that as more and more cadets were being trained up there was a point when they hit 16 years old there was little in the way of camping qualifications we could offer them. 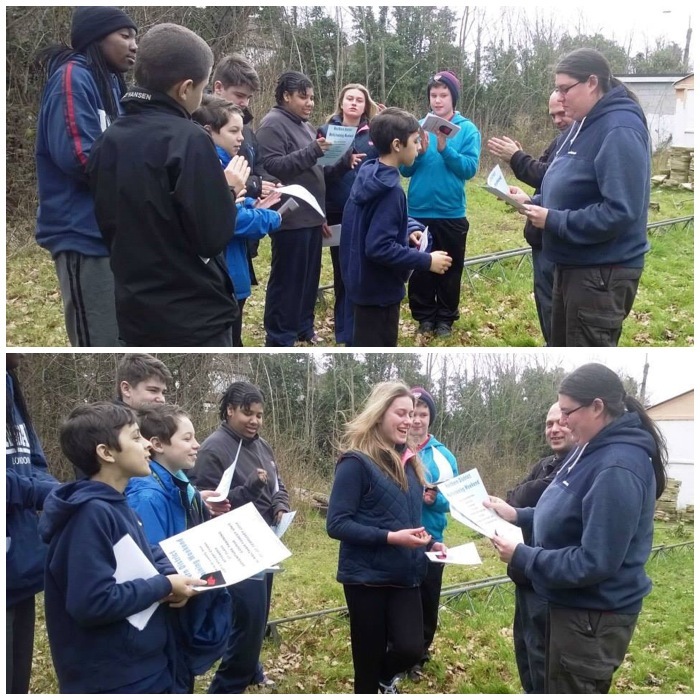 My boss Perry Symes has worked hard to bring in a brand new qualification for these 16 and 17 year old cadets – the Level 2 Award in Assisting in Basic Expedition Leadership (BEAL). 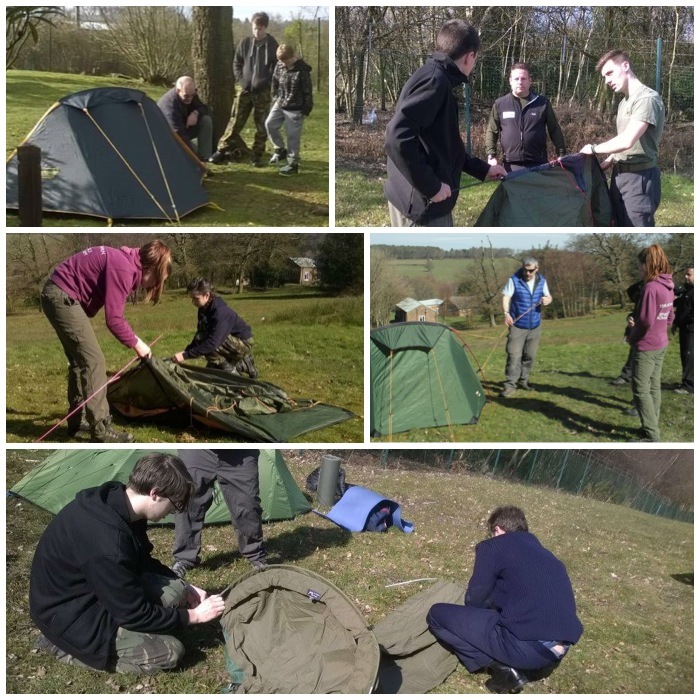 The course comprises at least two training weekends, a couple of weekends where the cadets assist on other camping courses, and an assessment weekend. 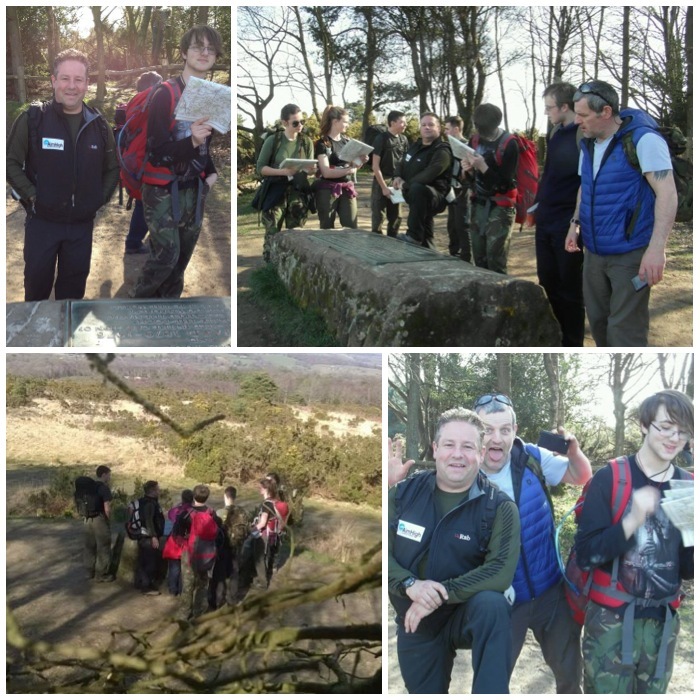 The first training weekend this year took place in (for once) a rather sunny Ashdown Forest. 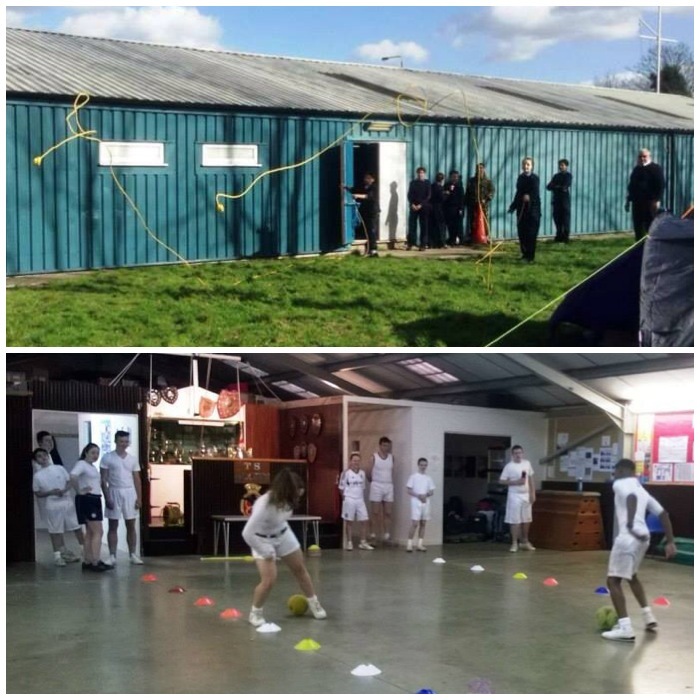 Most of the training takes place outside but as we were also using Crowborough Army Camp we did have the use of a classroom as well. 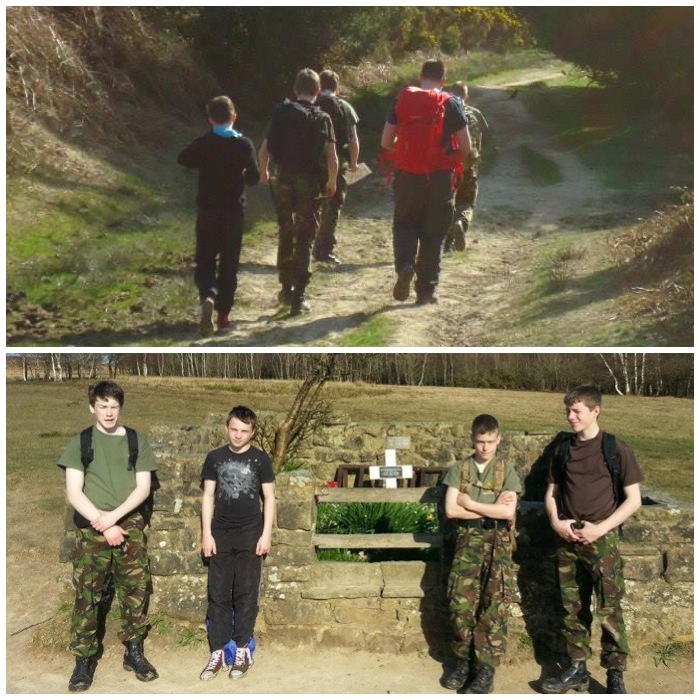 We had six cadets over the age of 16 on the course but could have had another six if they had not applied too late. 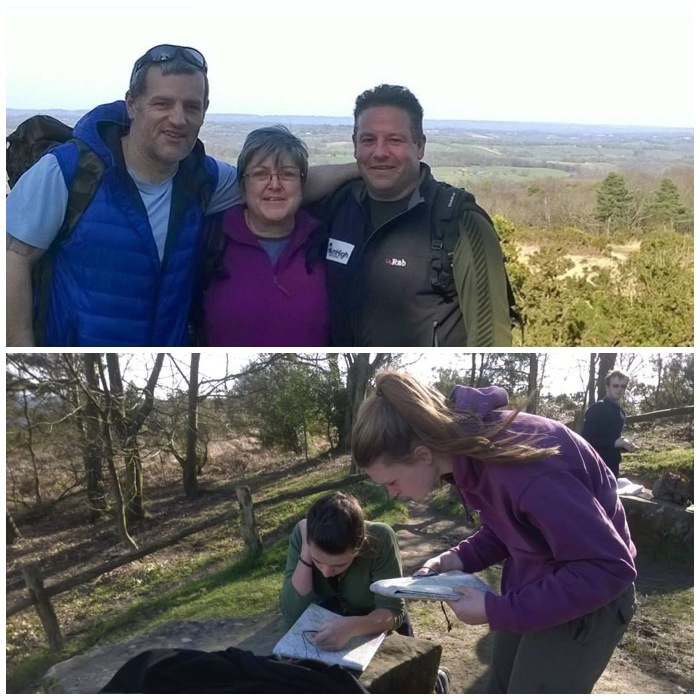 The course instructors were Perry Symes, John Kelly, Liz Rowan and myself. John and Liz passed the BEL a couple of years ago so they came on the course to gain valuable experience. 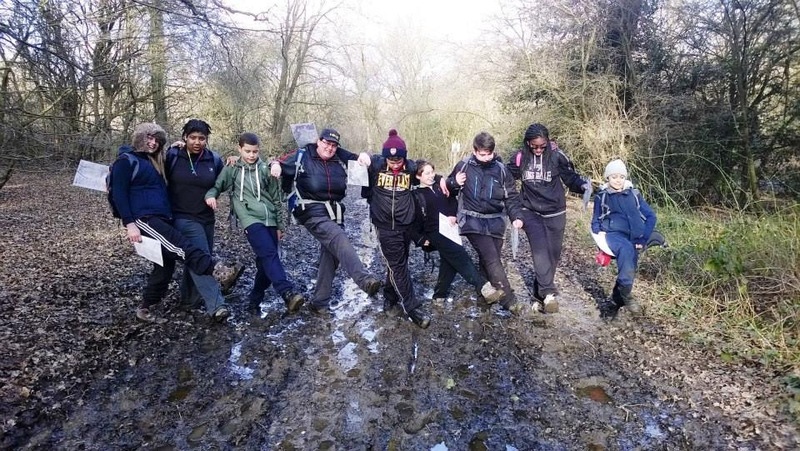 John in particular is working towards his Walking Group Leaders award so running this course will give him valuable experience. 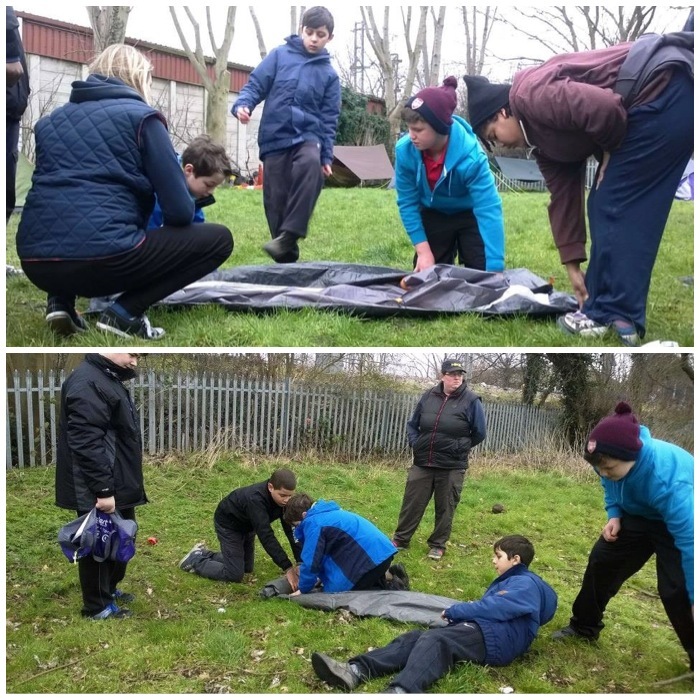 We also had another course running alongside this one for the younger cadets covering all the subjects for their Basic Campcraft badge. 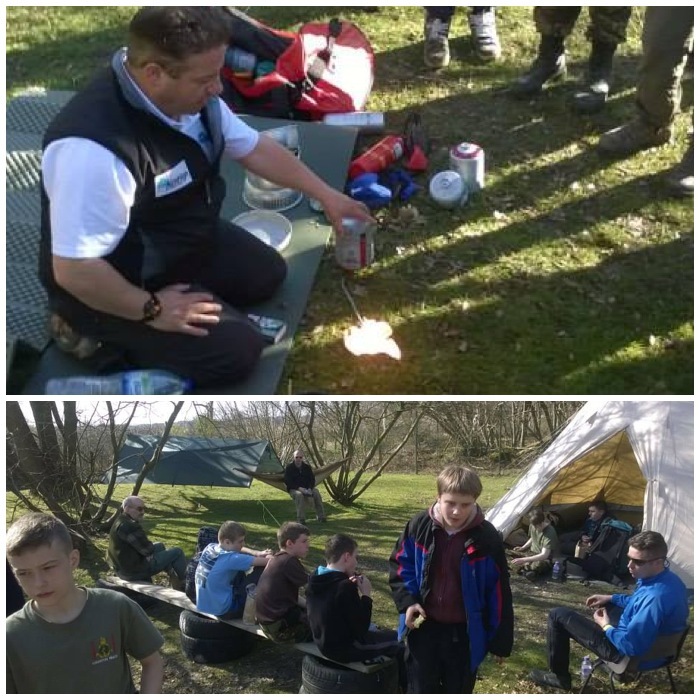 This course was run by Dave Lewis, Charlie Brookes, Lloyd Martin and Dean Barnett. 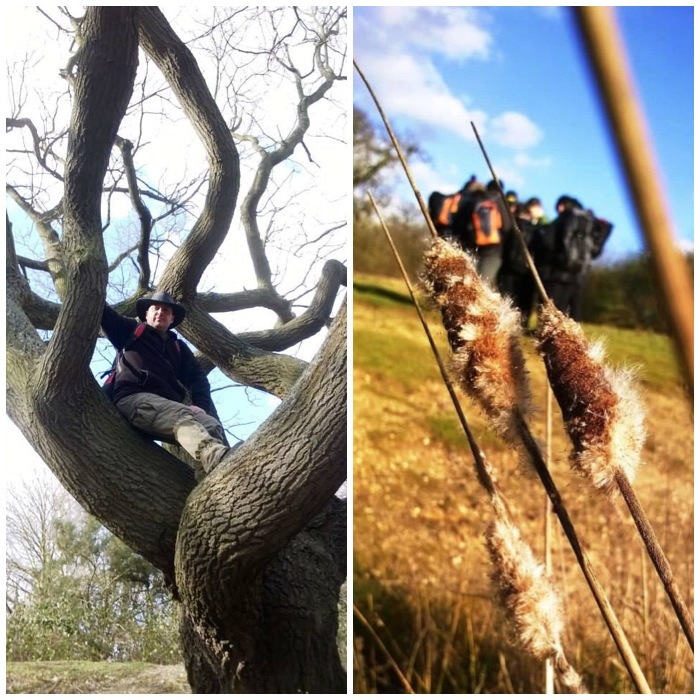 Lloyd has passed his BEL course recently as well so it was good to see him in action and Dean is just starting out in his training to becoming an Adventure Leader. 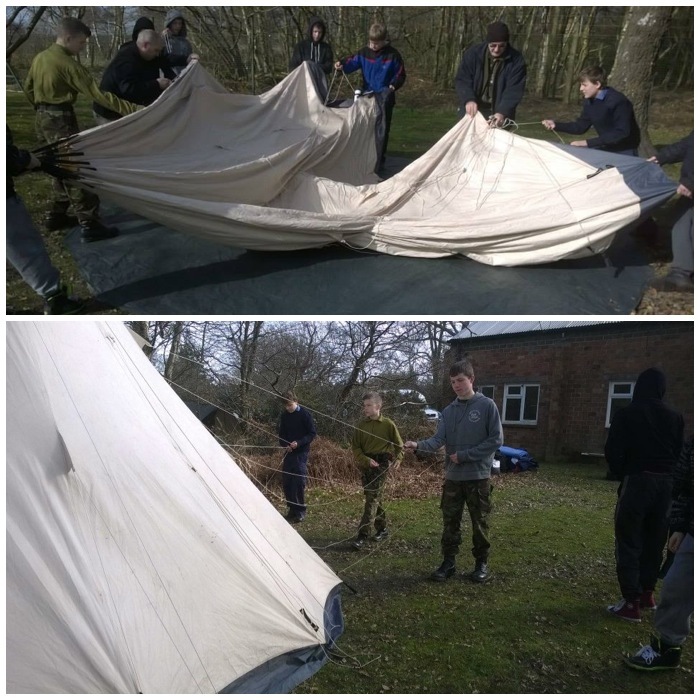 While the BEAL students were doing some class work, Dave and Charlie had the younger cadets put up my tipi. 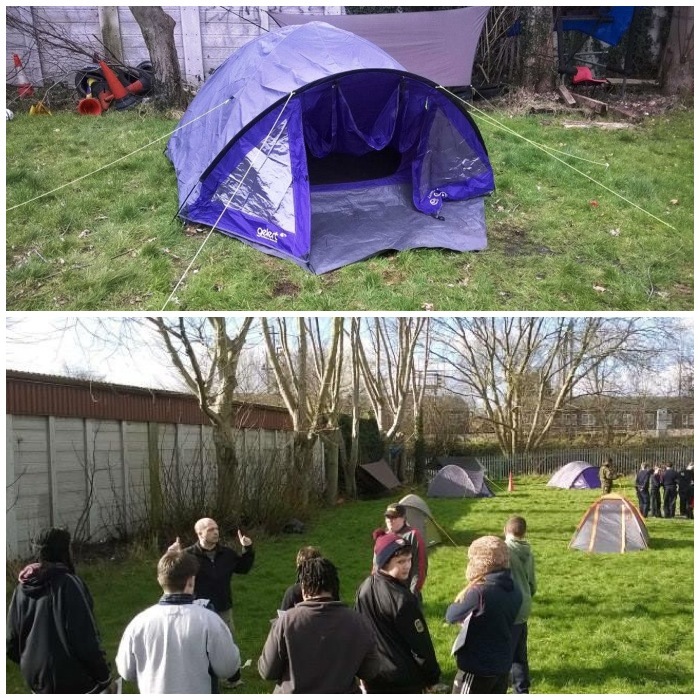 They used this over the weekend as a group shelter and temporary classroom, and some of the cadets slept overnight in it. 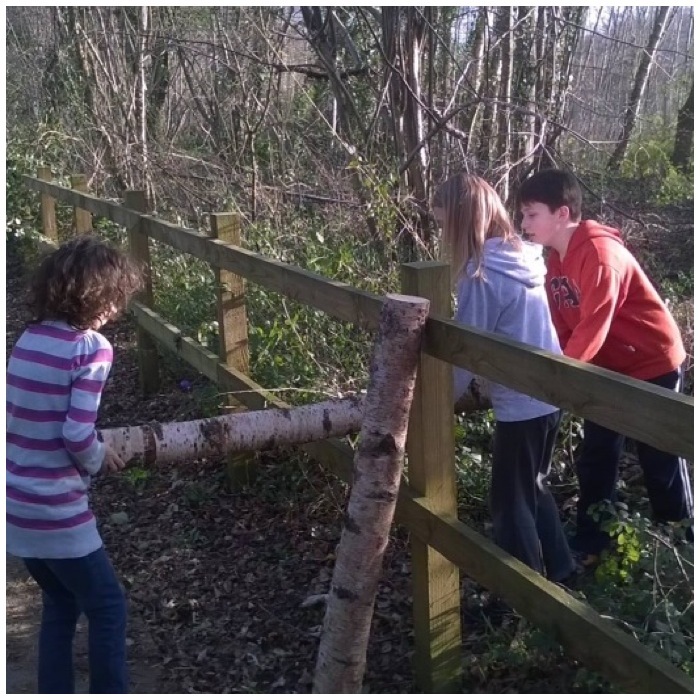 In between all the classes we do try and have a bit of fun wherever possible. Both teams set out in the afternoon on the Saturday to focus on navigation. 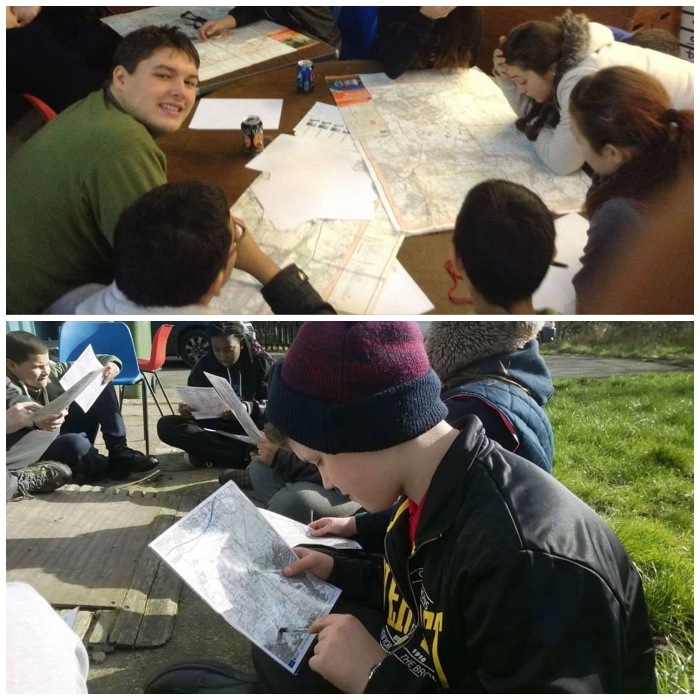 The young ones at this stage get an introduction to using a map and working as a team in the outdoors. 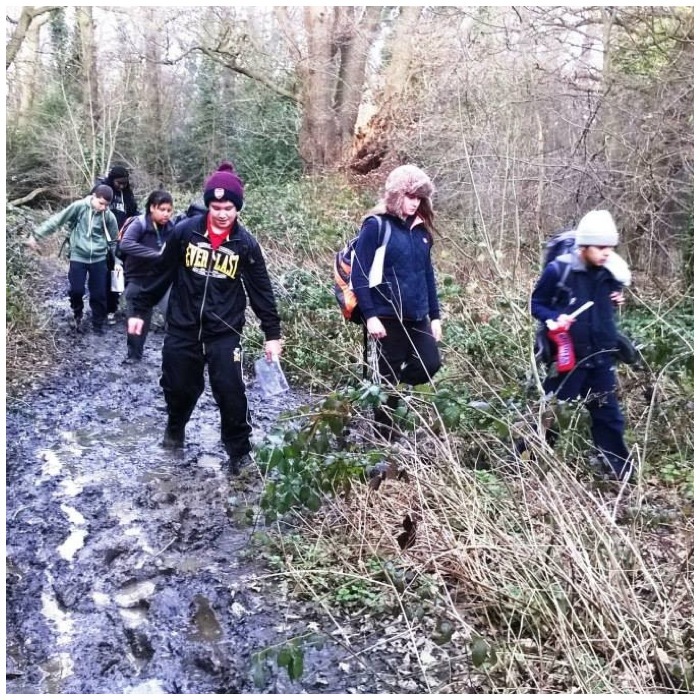 The BEAL students had already shown us they could use a map and compass in the morning so we set them to work in pairs with some challenging places to find. On our travels we came across the memorial plaque to A.A. Milne. There are fantastic view from this spot so it is great for more macro work with the compass. 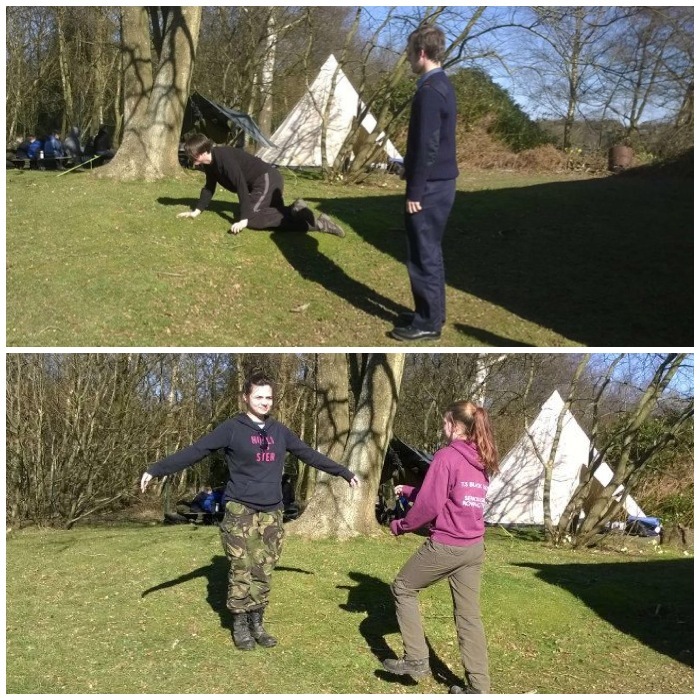 We got the cadets to take ‘back bearings’ on known locations they could see to identify exactly where they were and also to use their compasses and maps to try and identify far-off unknown features they could see. What we aim to do with this course is to train the BEAL students up to a standard that can be assessed for a nationally recognised qualification so that one day they can take over from us. In the meantime I am very happy to continue teaching outdoors skills but recognise that one day others will need to take our places. 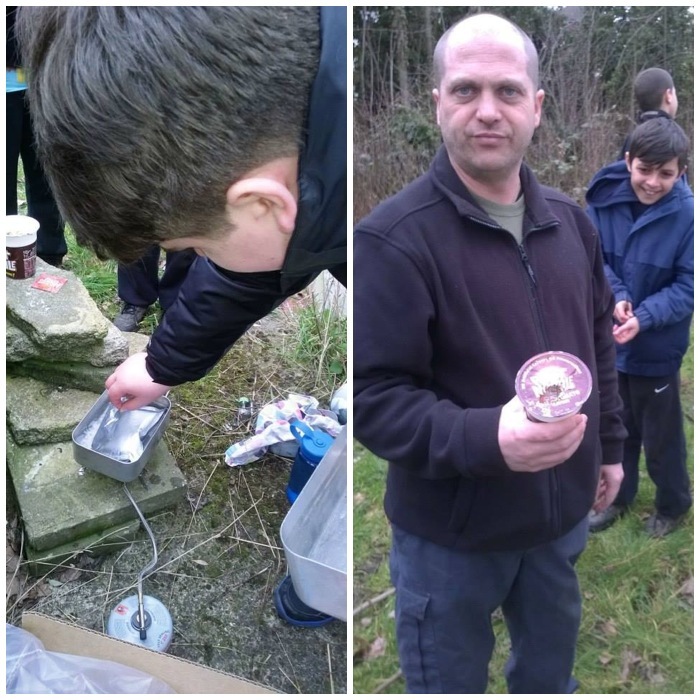 While we were doing compass work the younger cadets had found the Airman’s grave. This is not an actual grave but a memorial site to the crew of a Wellington bomber that crashed here on the 31st of July 1941 returning from a mission over Germany. Later that evening after all the classes were finished, Charlie, Liz and myself took the younger cadets off for an evening’s walk. I insist that the cadets do not use torches to show them how quickly their eyes adjust to the dark. 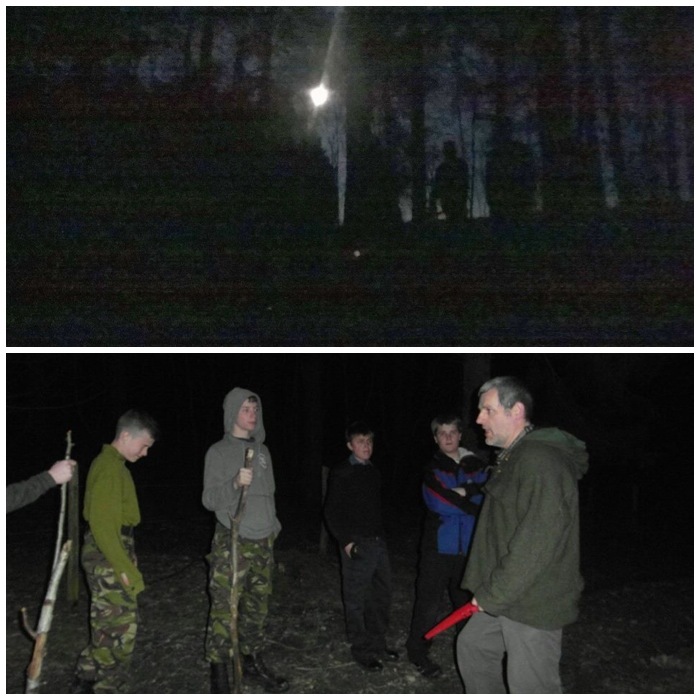 Most of these cadets had never walked in the woods at night, let alone without torches. Thankfully we had a good moon that night with a clear view of the skies. 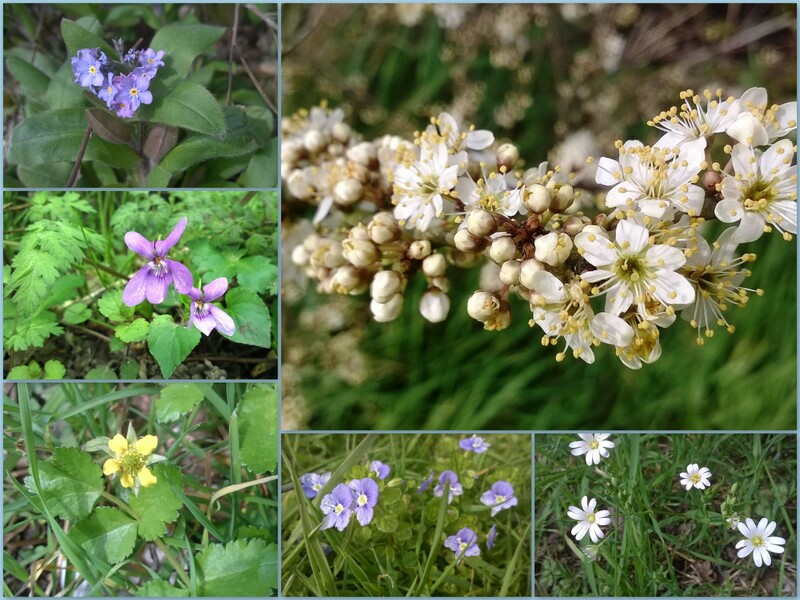 I took them down to an area of the military camp that is heavily wooded but is the site of some old World War 1 training trenches. In no time the cadets were running all over the place having a great time and had totally forgotten that they were nervous about being in the dark. 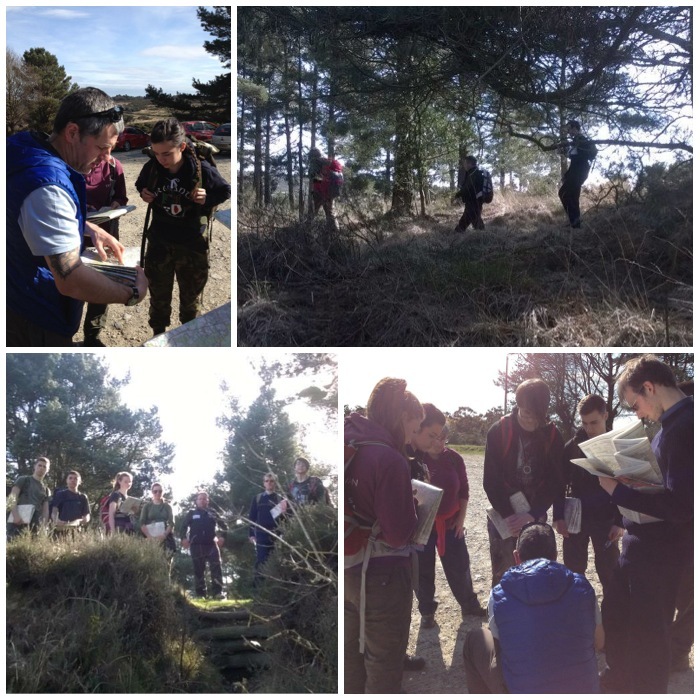 We took them through various types of woodland and heathland and also met the Royal Marine Cadet instructors out training. 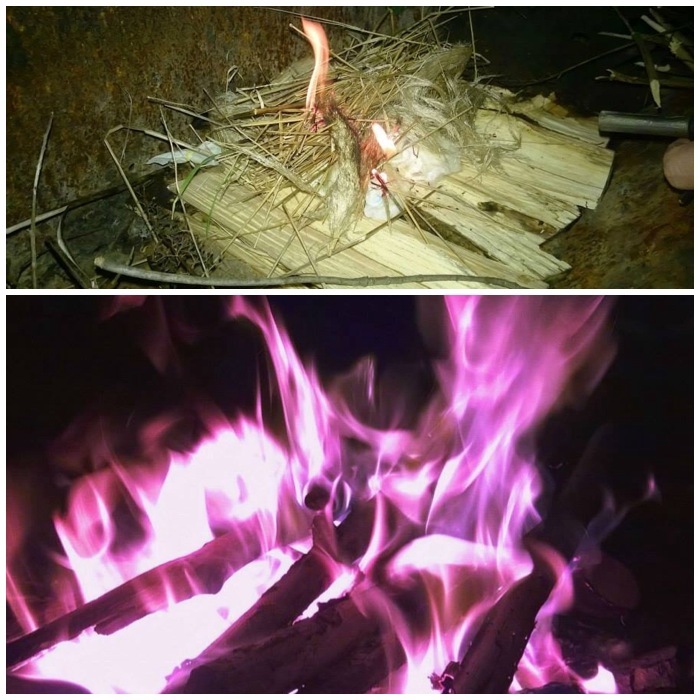 Just before we got back to camp we got the torches out and cut up some dead standing wood for a fire to toast some marshmallows. On the way back after this we managed to get a bit of star gazing in as well. 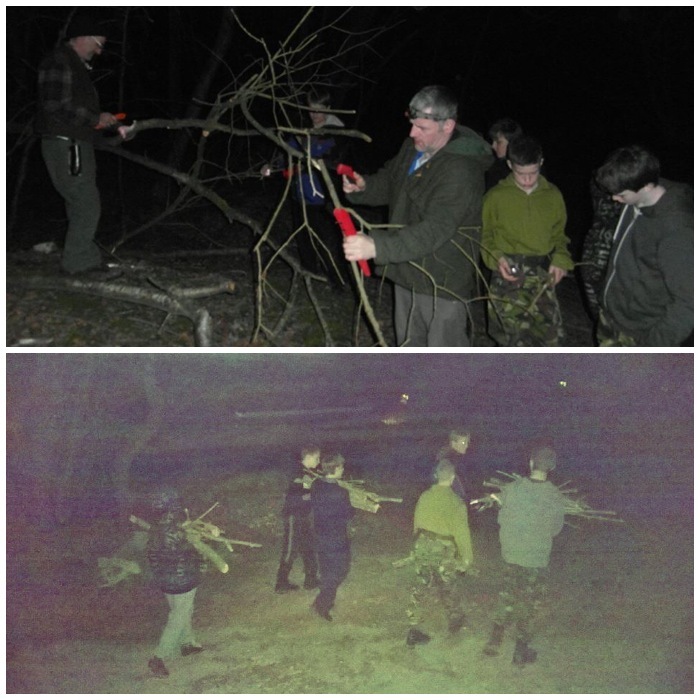 One of my usual nightly chores is to carve some marshmallow sticks for the cadets to use. 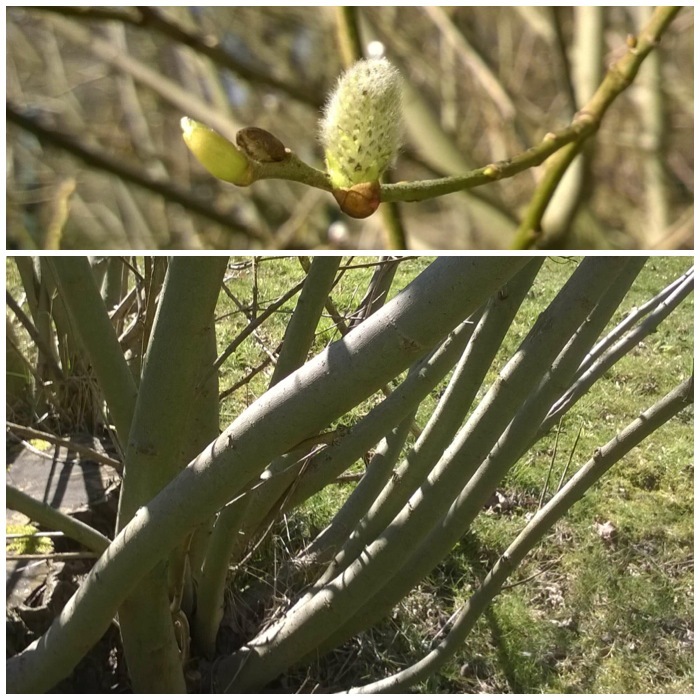 Thankfully though we have some good willow shoots nearby. While I was doing this Charlie was teaching Dean how to light a fire properly and maintain it. I got this little video of it all in between carving the sticks. After the fire got going it was time for a photography shoot to get some fire faces. 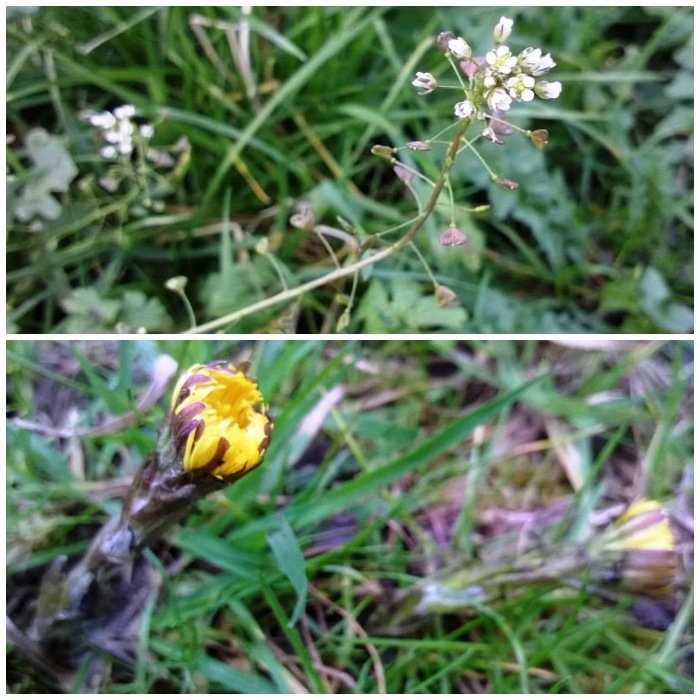 You can see a small one on the left in the bottom picture. 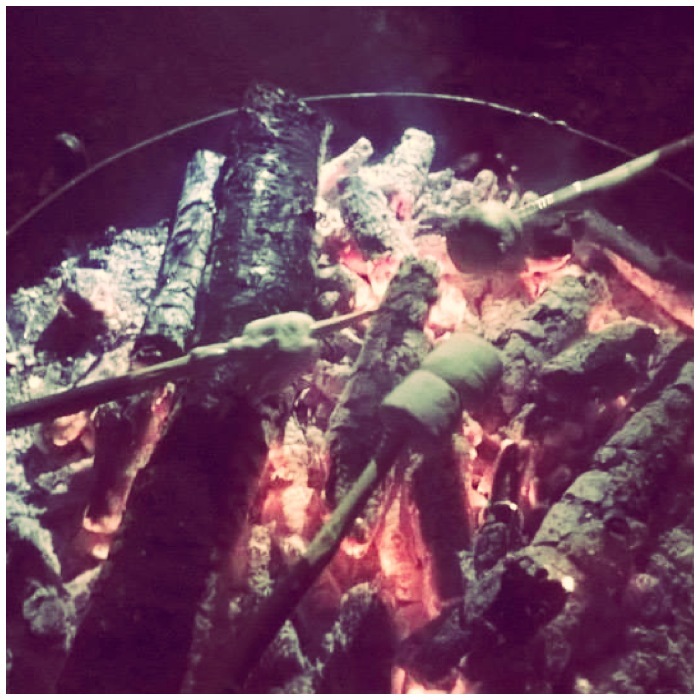 Then it was onto the serious job of teaching the art of toasting a marshmallow. 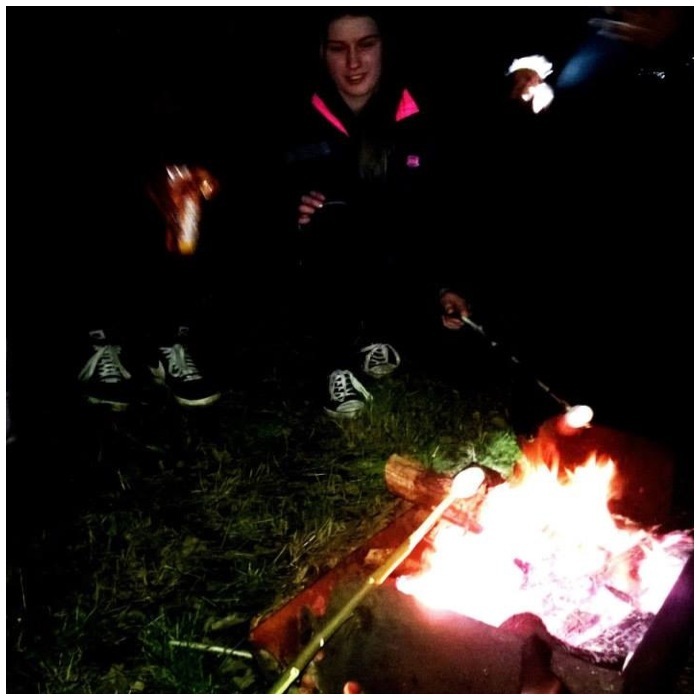 It still amazes me to find so many children in their teens who come on these courses and have never had the simple pleasure of toasting a marshmallow over an open fire. 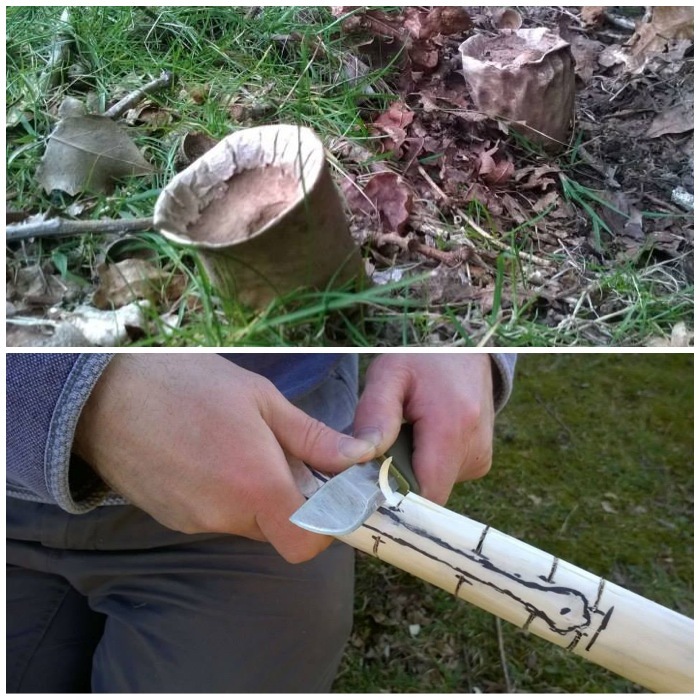 Next morning in between classes I managed to get some time in spotting some unusual fungi (cheers Liz for finding these) and a bit of spoon carving. 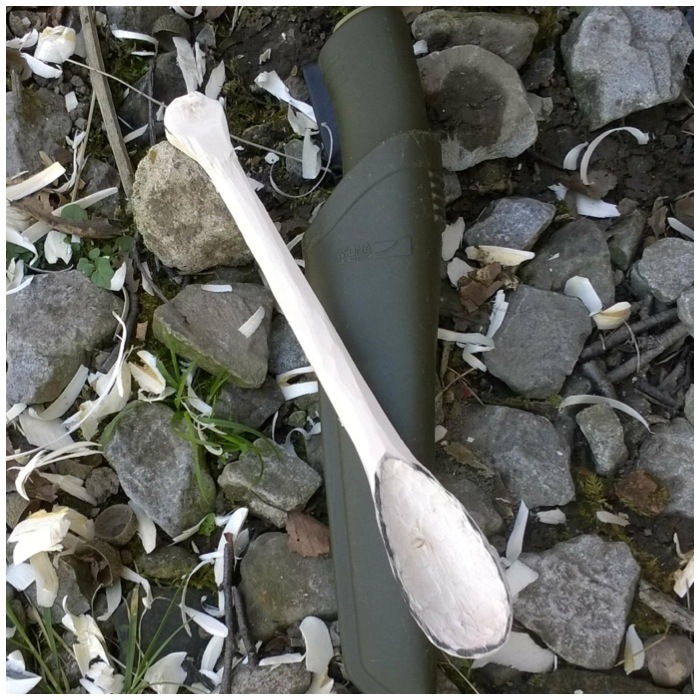 I have a tutorial on carving this spoon here – How To…. 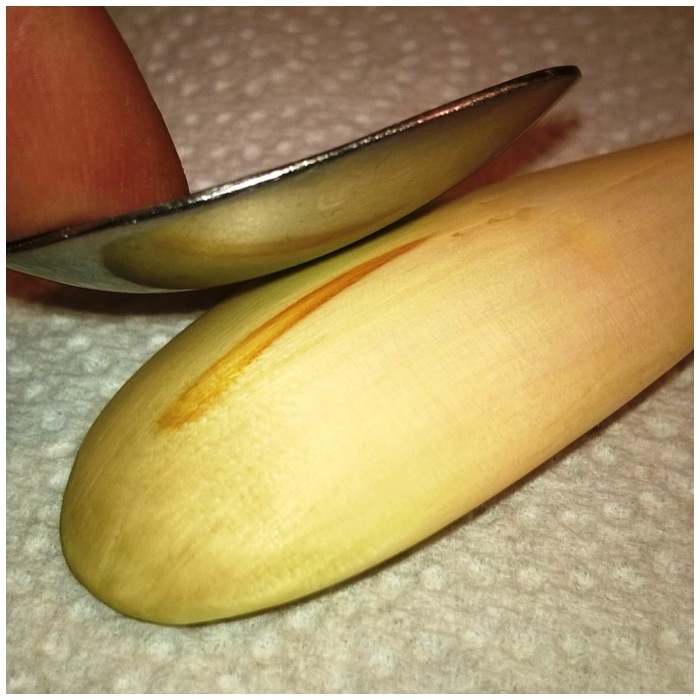 Carve a Simple Spoon: the double-handle technique. It turned out that running these two classes at the same time worked quite well. 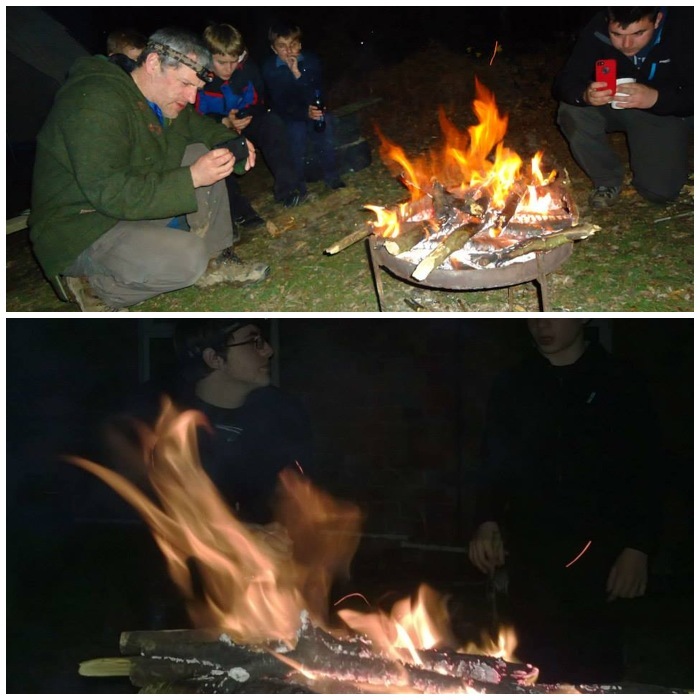 The younger cadets had to learn all about camping like using stoves and the BEAL students had to re-learn the same subjects so that they could prepare themselves for teaching the cadets themselves in the near future. 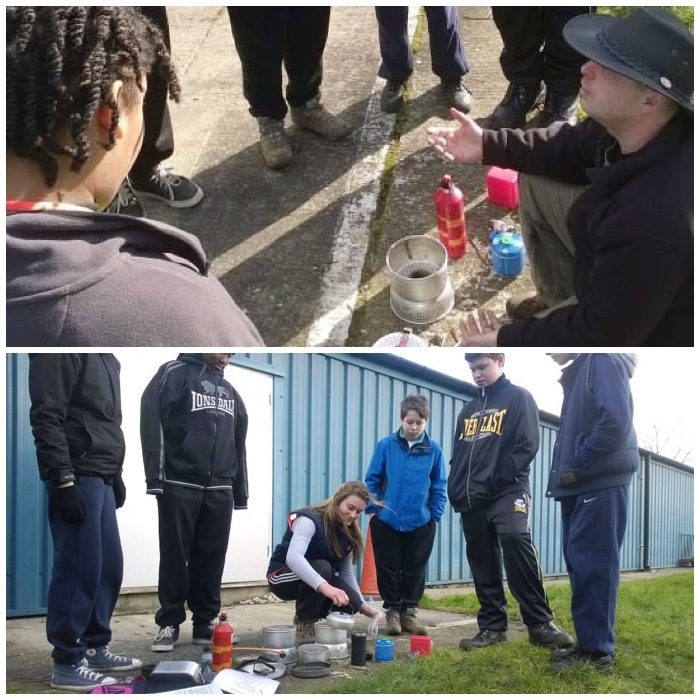 In the top picture Perry is showing the cadets how that if a gas bottle is shaken too much it may flare up and become dangerous. 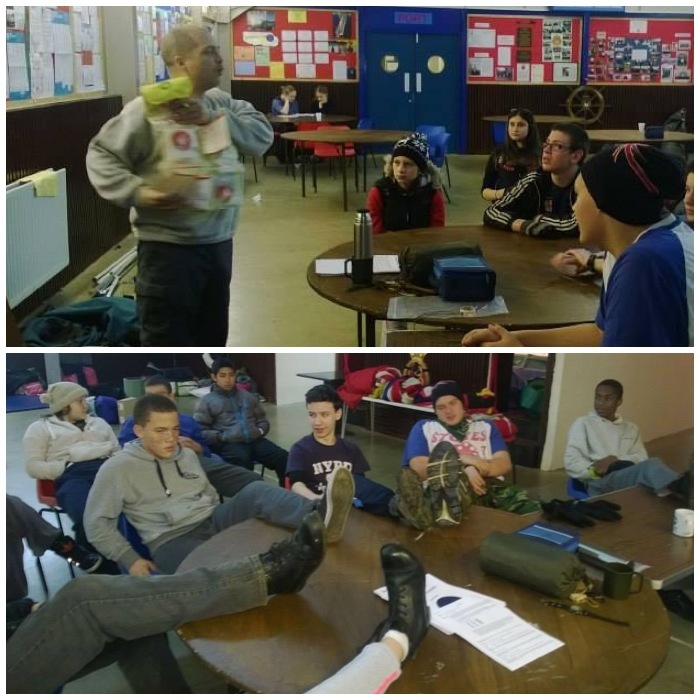 While Perry got on with the class with all the cadets and other instructors Dave took a well earned break and I got my sleeping bags out for an airing. Part of the course is designed to get the BEAL students to come up with different ways to get the learning across. Here they are using Charades to explain the Country Code. They felt a bit embarrassed at first but soon got into it. That was the end of a very successful weekend. 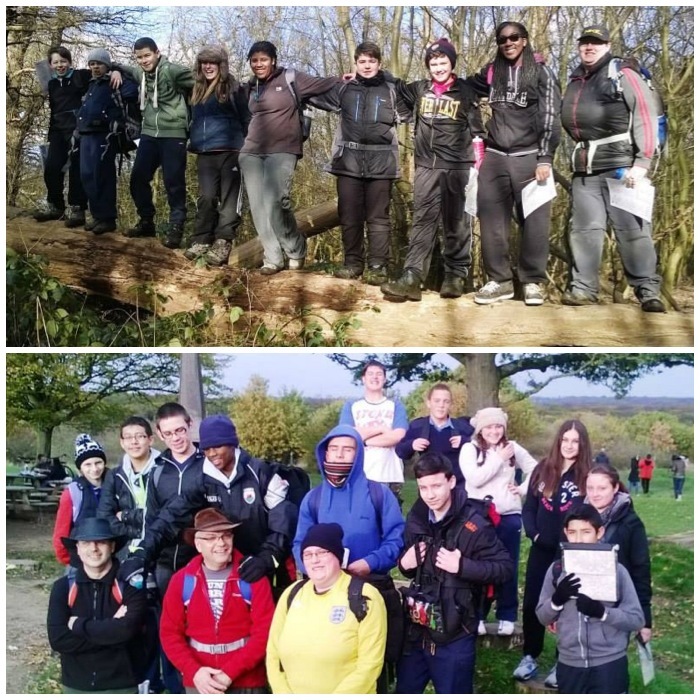 All the BEAL students went off with areas of navigation to work on and a date for another course which they would help to run. 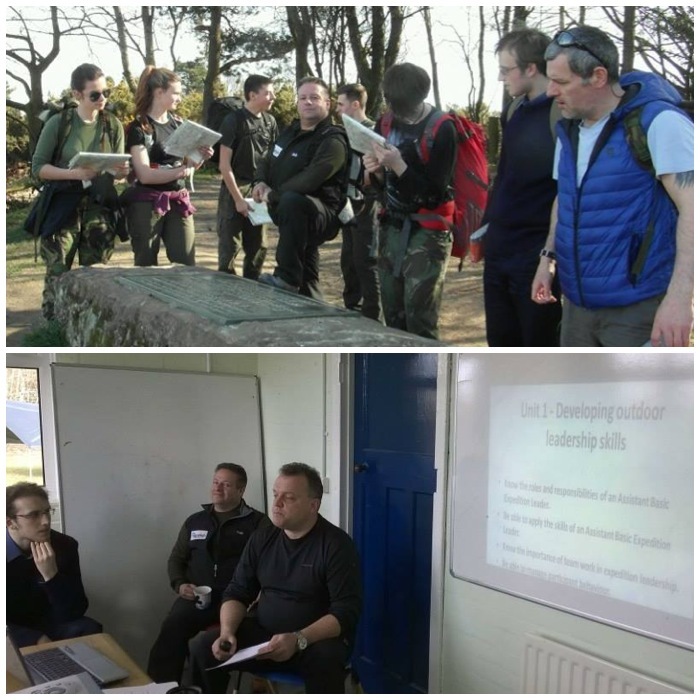 Some of the new instructors gained some valuable experience and I got a lovely sunny weekend in Crowborough – not often I can say that in March. 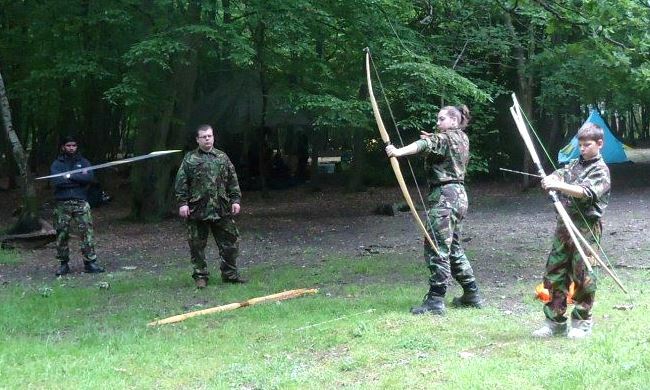 I am looking forward to the second training weekend later in the year for this course. This How To…. 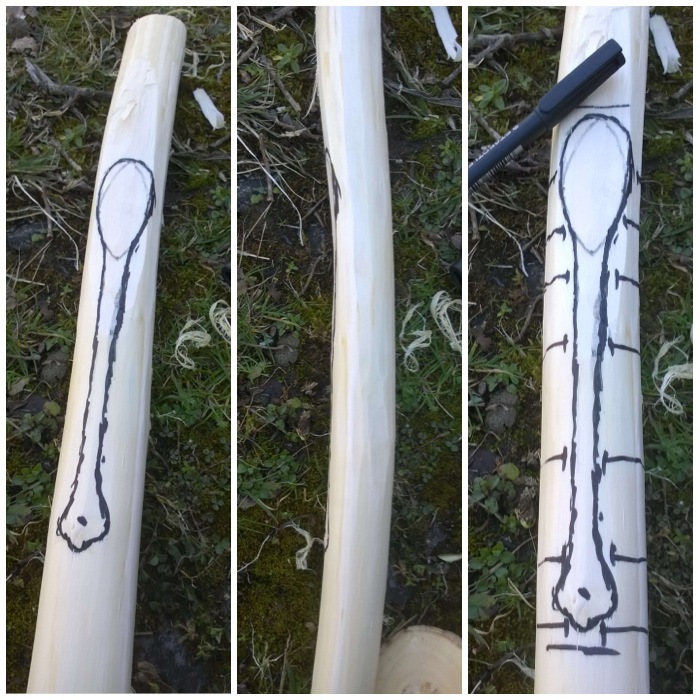 illustrates some simple steps to carve a small spoon you can easily make when you are out and about. 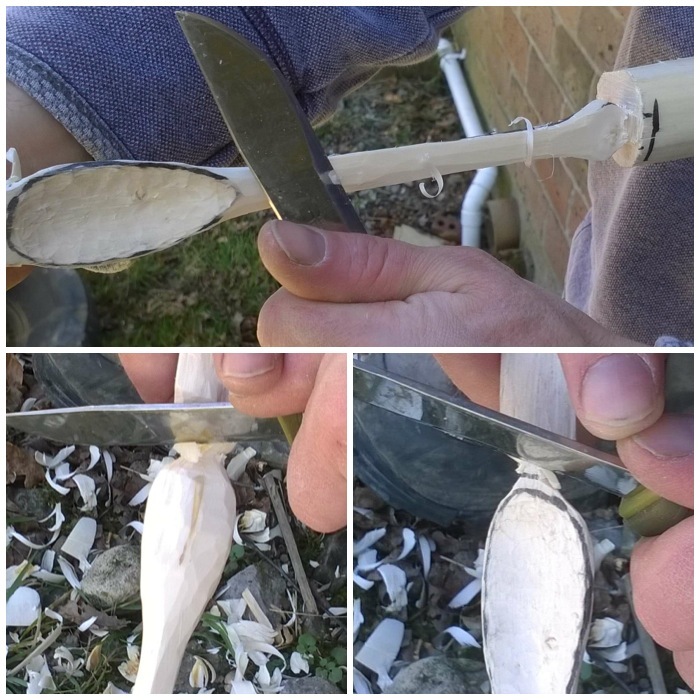 I was training on campcraft in Crowborough (Ashdown Forest in the UK) recently and in between classes decided to carve this simple spoon. 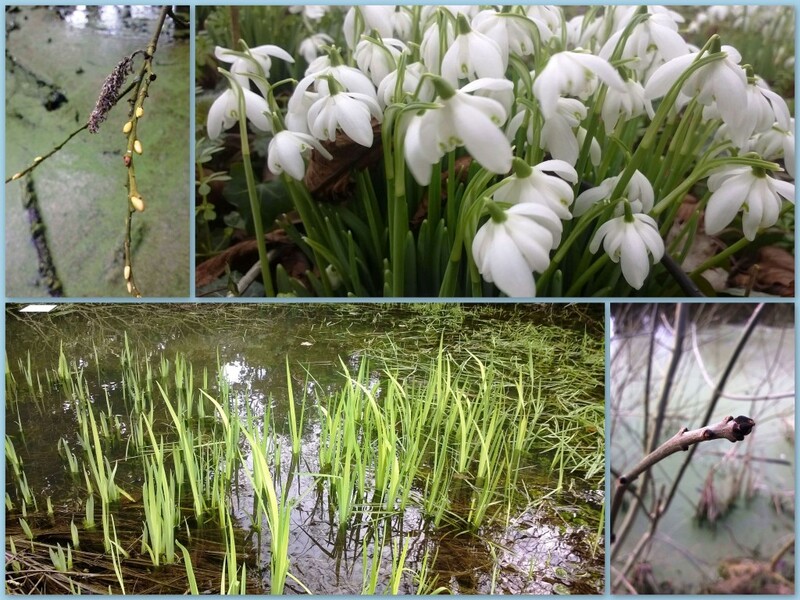 A nearby willow tree had been felled a few years ago and lots of shoots had re-grown from the stump. I selected a shoot and sawed it off near its base. 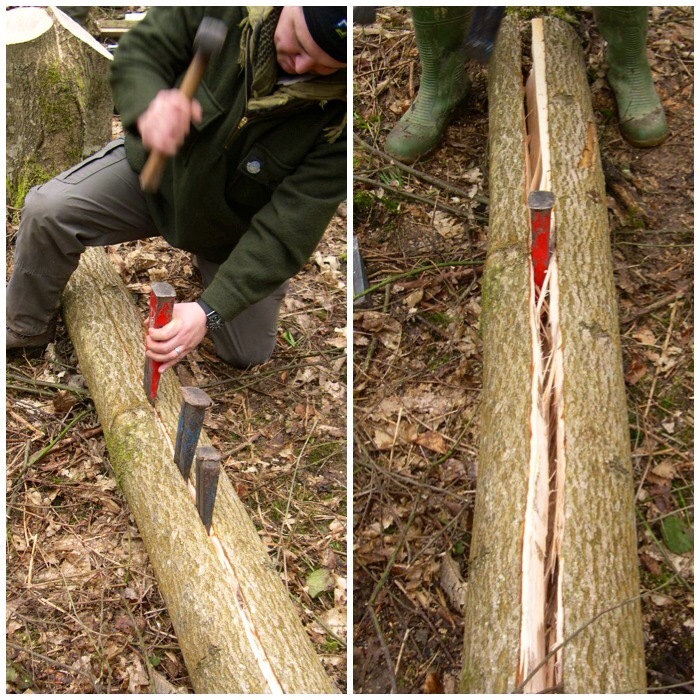 Cutting the limb cleanly at the base will allow the tree to heal itself quickly and send out a replacement shoot the following year. I selected the limb because of its curves, which help in making a strong spoon. 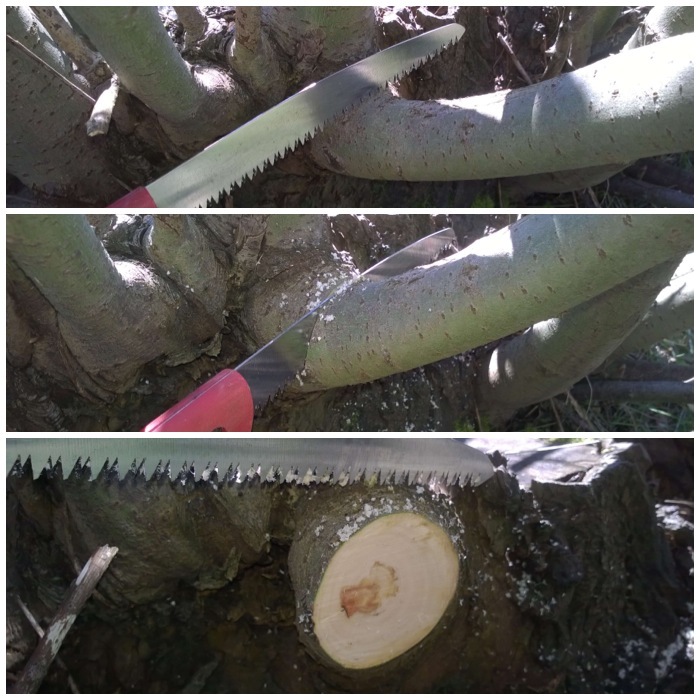 I trimmed the limb in a safe position and used the live limbs as a vice to do the final sawing. 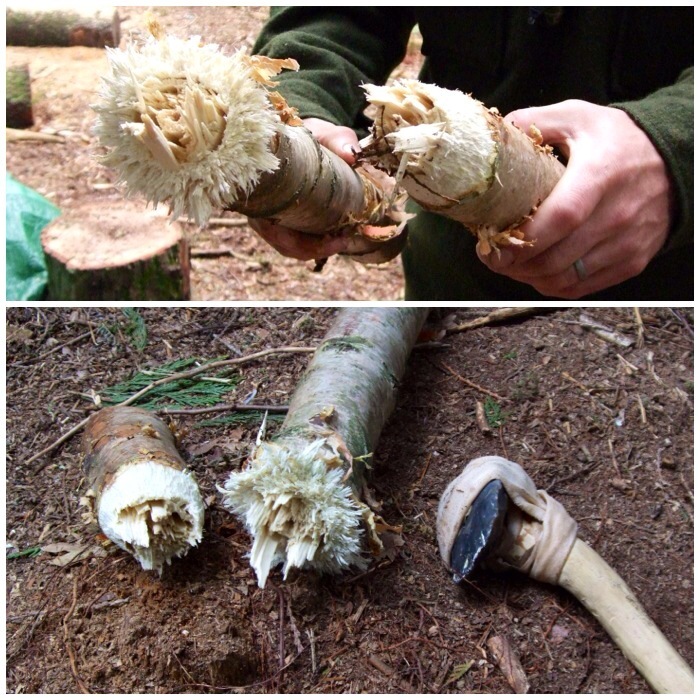 I took two pieces to make a couple of spoons and then trimmed off a couple of the smaller shoots from the top. 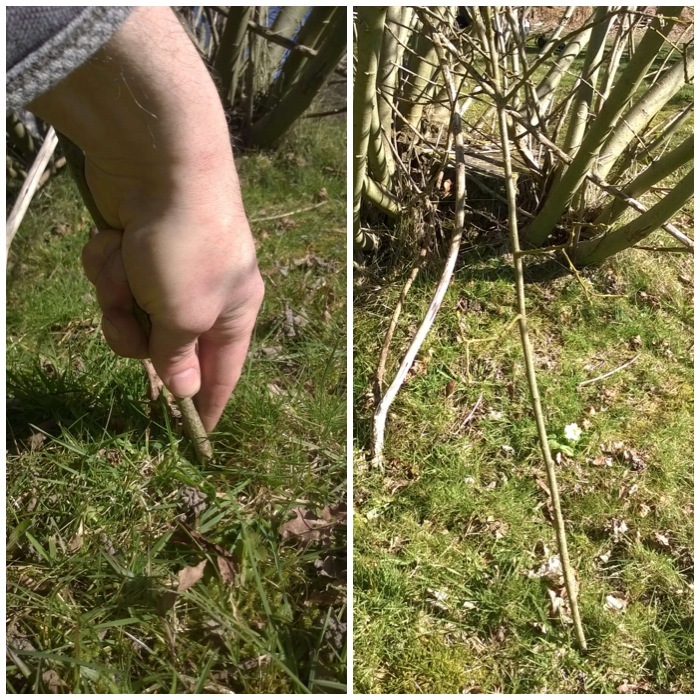 These smaller pieces I re-planted around the base of the tree by pushing them into the ground, as willow has the ability to re-grow from these shoots. The next job was to strip off the outer and inner barks. 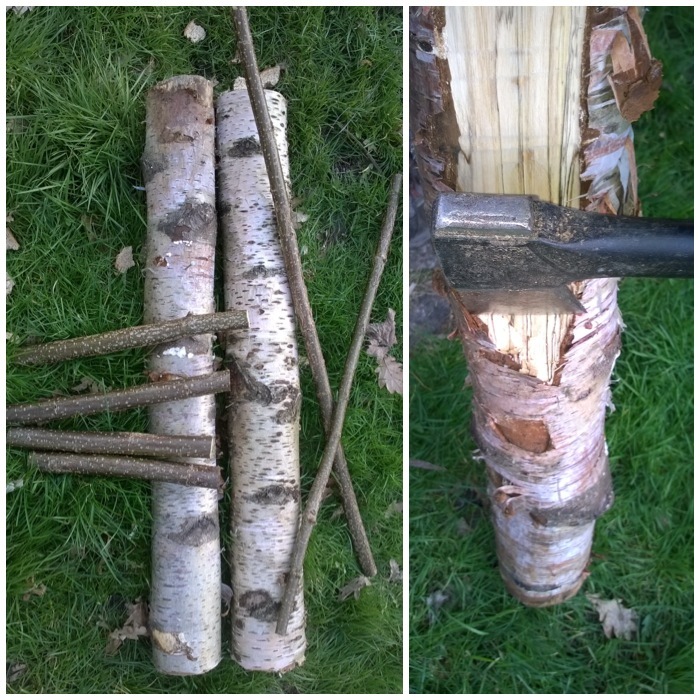 I tried to strip the bark off in one piece but as the sap had not yet risen it was very difficult to do. 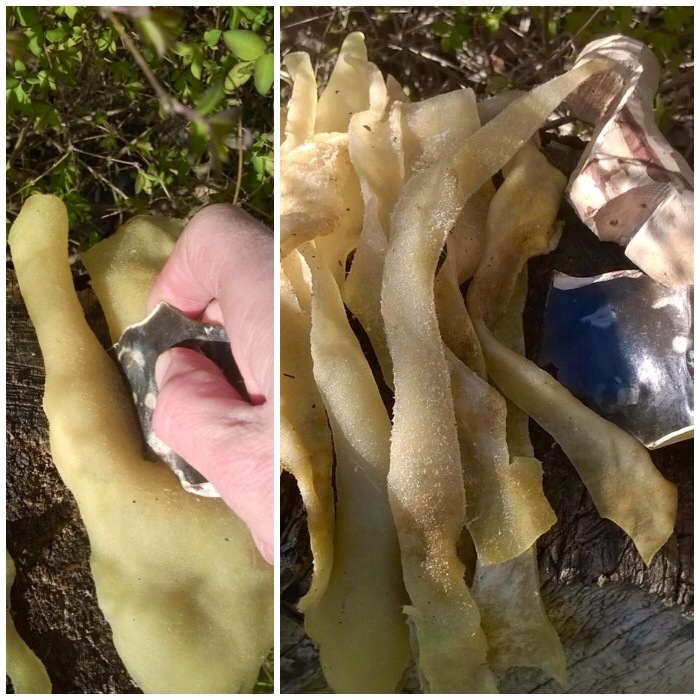 If the bark had peeled off easily I could have made some nice cordage from it. 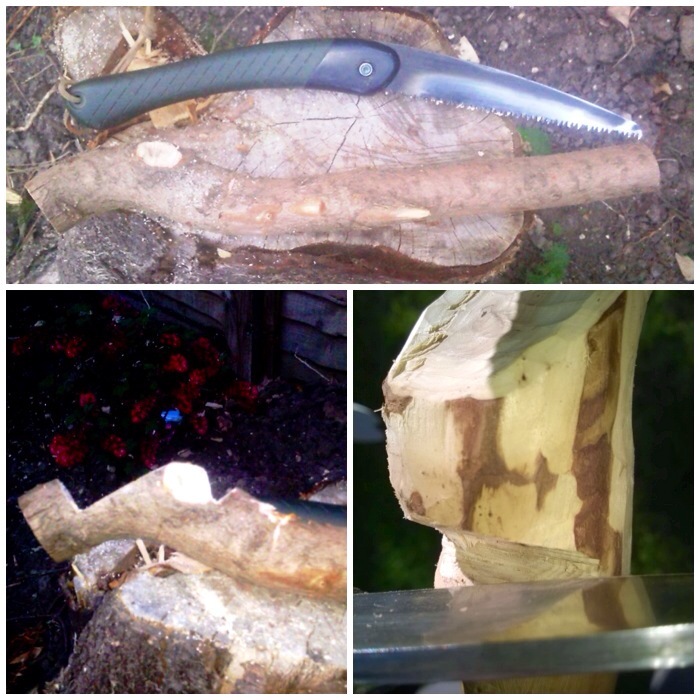 I used the back of my knife to scrape off the remnants of the inner bark to get right down to the wood. 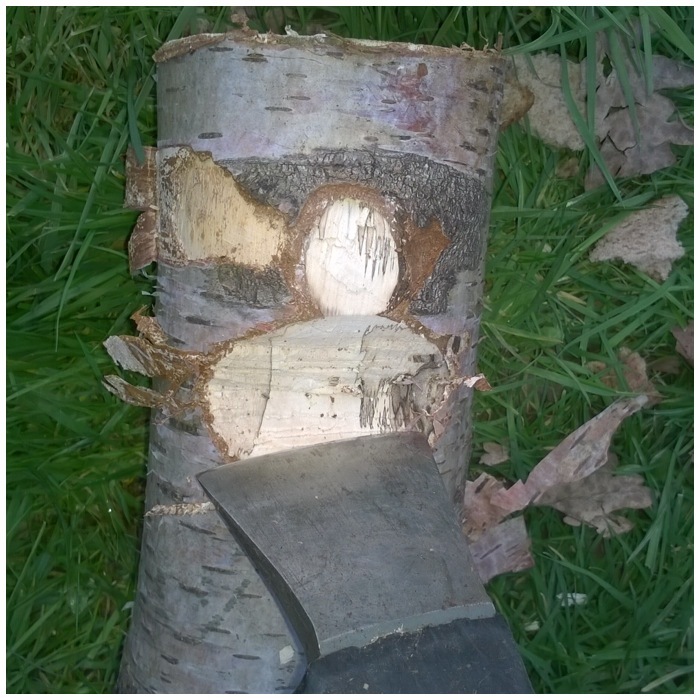 This inner bark does clog up on the back of the blade so you have to continually scrape it off. 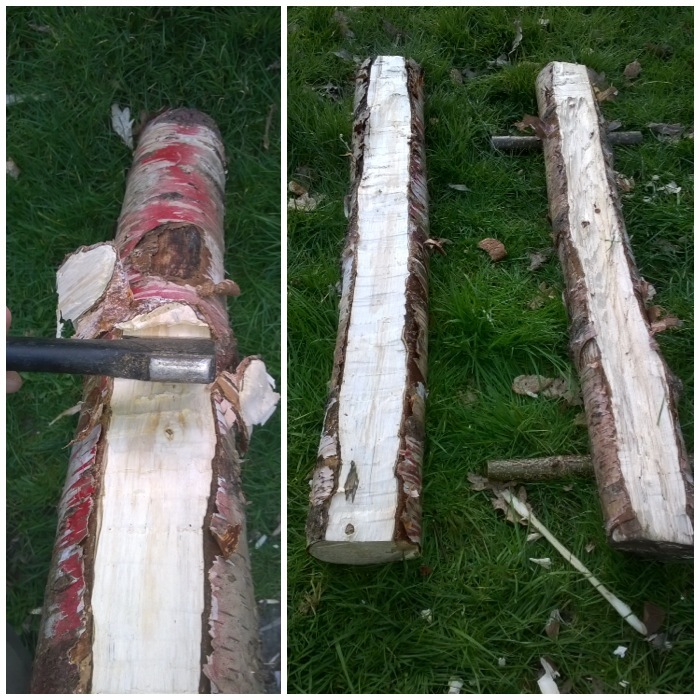 The whole process of stripping the bark took about 5 minutes. 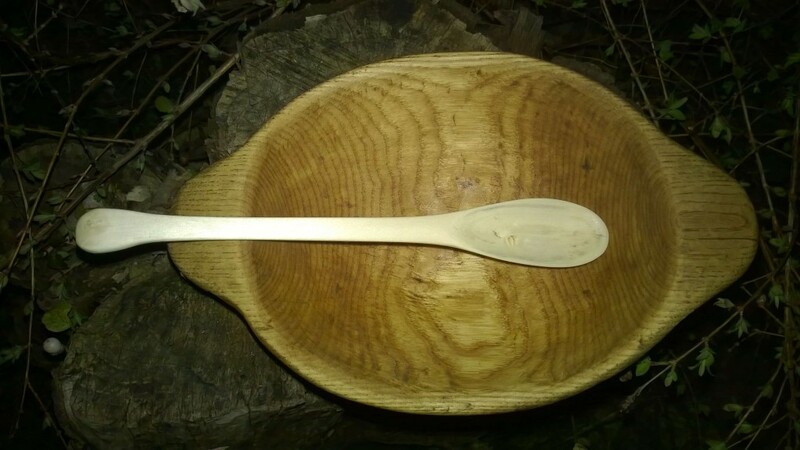 I flattened out the area of wood that would make the bowl of the spoon to give myself a little bit more area to work with. I like to carve the bowl of the spoon first. 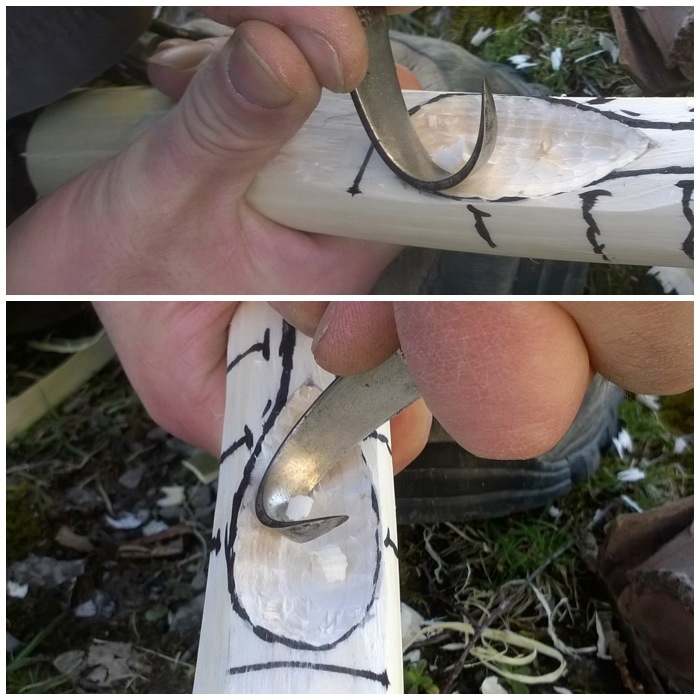 To do this job I usually use a palm gouge (on the left) and a crook knife (on the right). I use the palm gouge first, tracking around the edge of the bowl to cut out the waste. 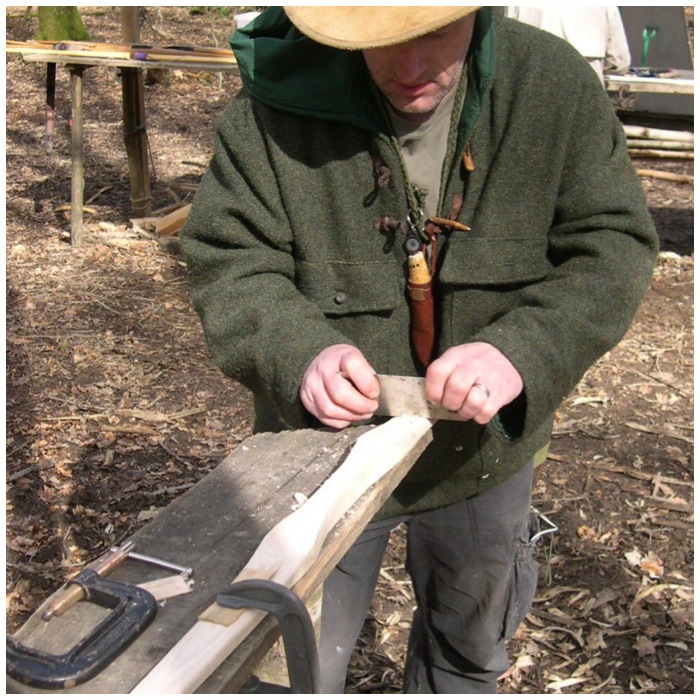 Having the two handles in the wood means I can use the same hand to do this (I am left-handed). They also allow me to keep my other hand well away from the sharp edge of the gouge. 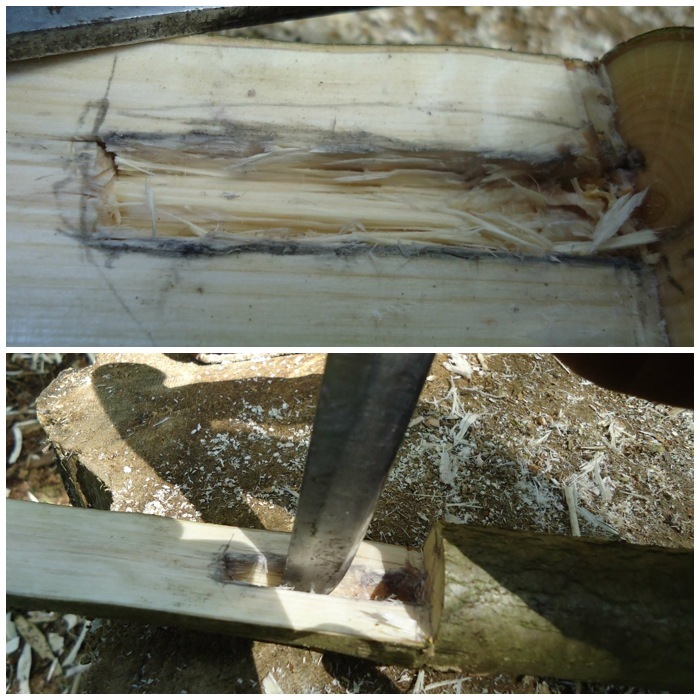 The gouge makes short work of the waste wood but it does not leave a smooth surface. To smooth the bowl out a bit more I usually switch to the crook knife. I find that the crook knife helps to accentuate the curve of the bowl more than the gouge does. 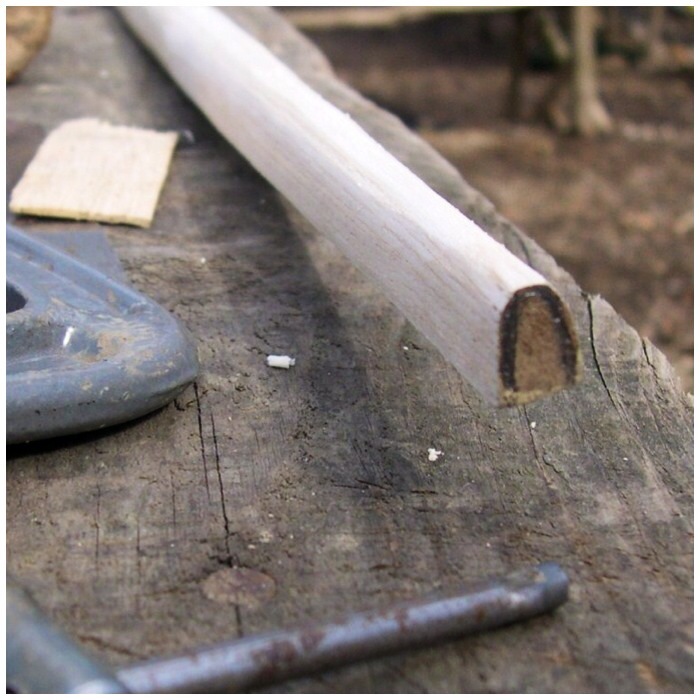 With both tools I always try and cut across the grain of the wood but this is not always possible near the ends so I need to be extra careful there not to lose wood on the edges. After the bowl is roughed out I saw all the stop cuts. 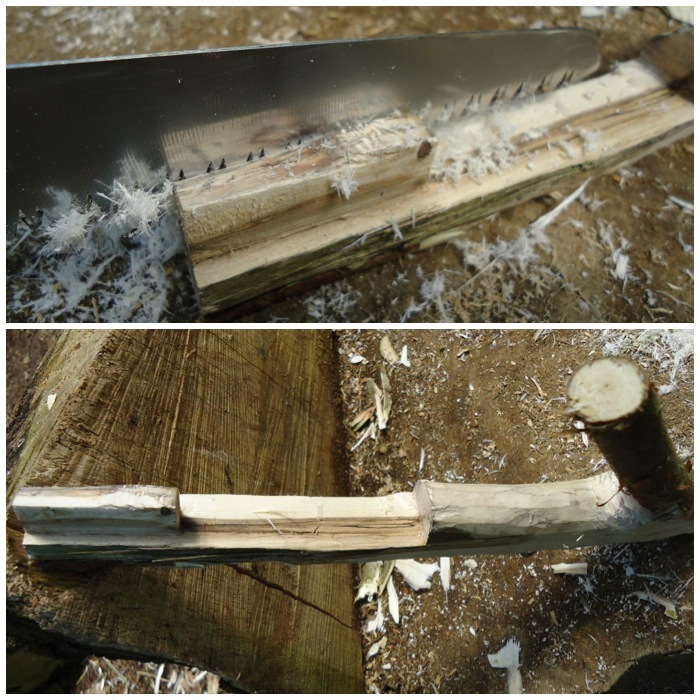 These stop cuts help to stop splits occurring in the wood as I carve the rest of the waste wood away. 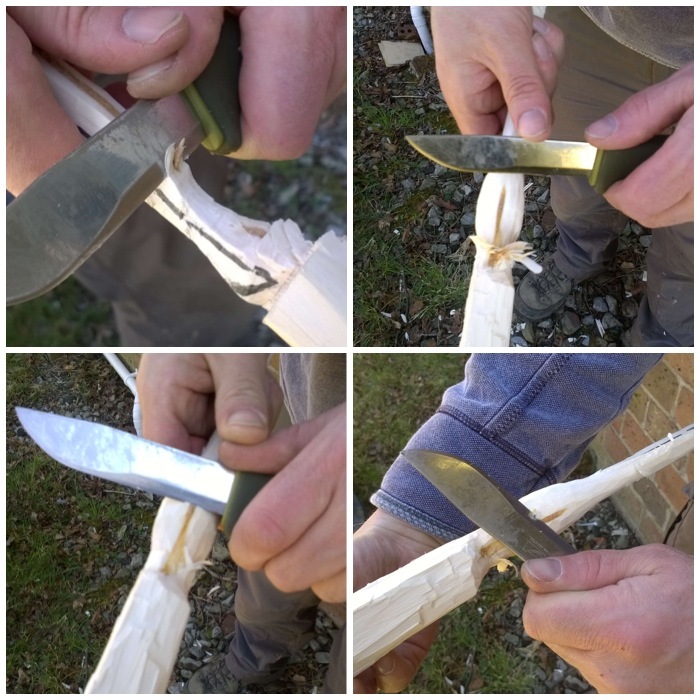 Stop cuts are particularly important when carving around the bowl; they act like small breaking points for the knife edge, stopping splits occurring. 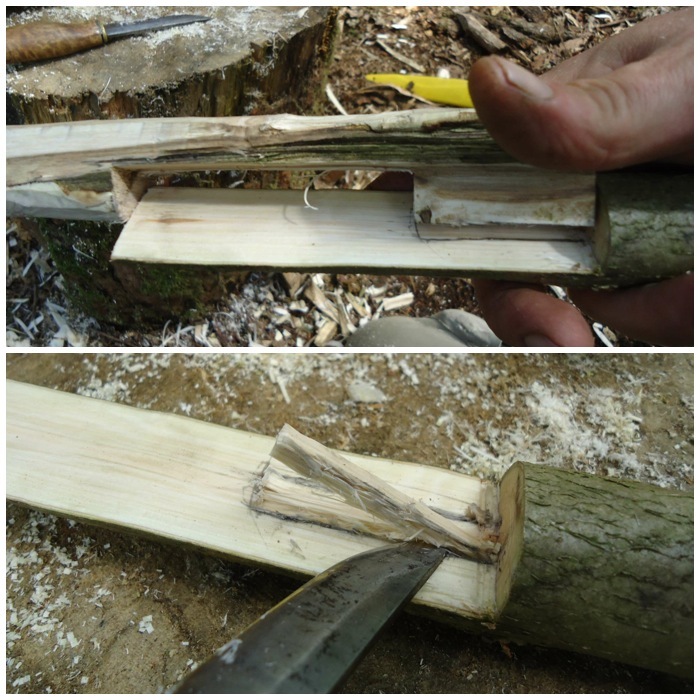 I take my time at this stage and make small cuts to remove each piece of waste wood between the stop cuts. 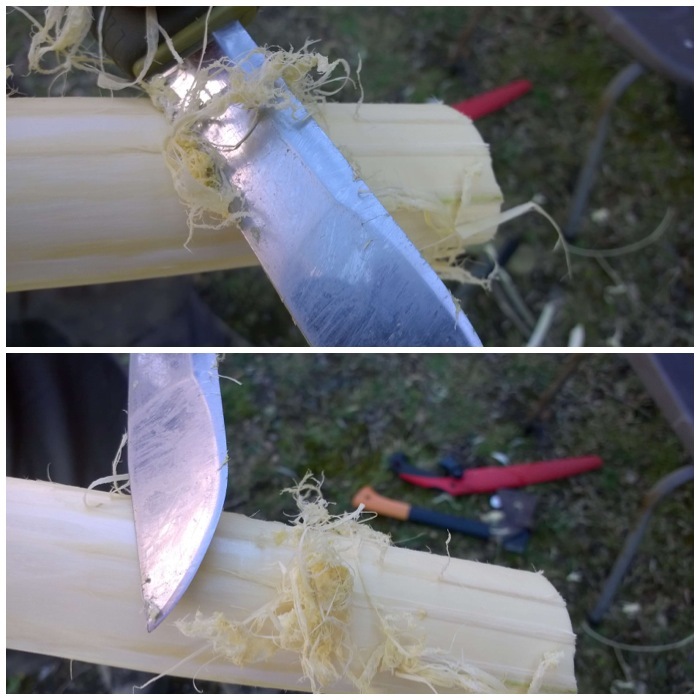 In these two pictures I am using my thumbs on the back of the blade to apply pressure. You can push either with both thumbs on the back of the blade or with one thumb on top of the other. When I am on a straight section like the handle I tend to use the chest lever grip. This is a very controlled and powerful cut. I have my hands tight against me and use my chest muscles to push my hands apart. 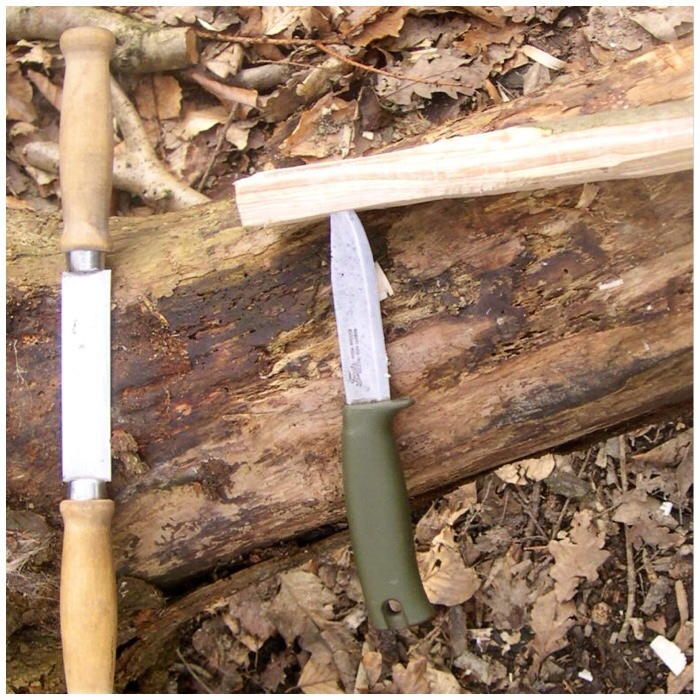 This pushes the knife edge into the wood in small, controlled but powerful cuts. Another cut that can be used here is the shoulder cut. 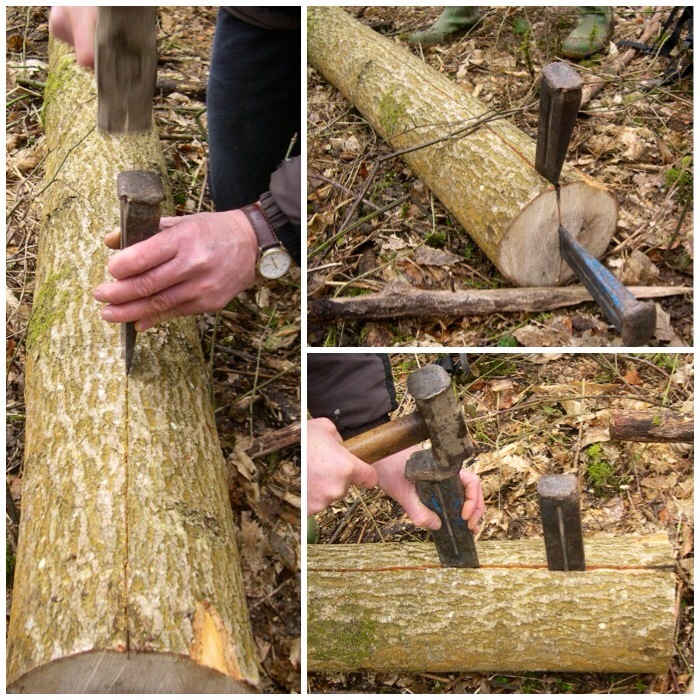 With the work piece off to your side and the bottom of it on a log or on the ground (if the handle at the bottom is long enough), keep your arm locked straight and push down with your shoulder muscles to cut into the excess wood. You can cut big or very fine pieces with this technique. 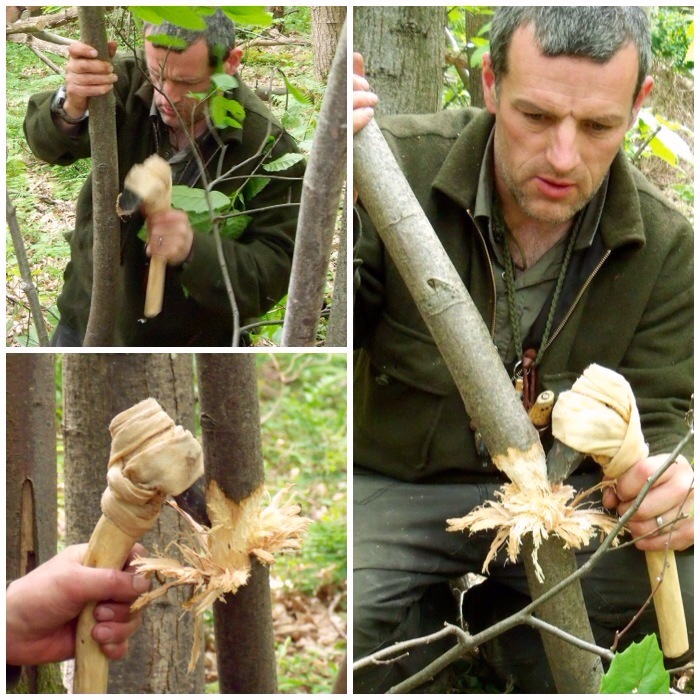 I learnt this technique from Mors Kochanski when he was over in the UK at the BCUK Bushmoot a few years ago. I pushed one end of the work piece (perfect when you have these handles on each end) and then, using the knife like a draw knife, cut slivers of wood towards me. This is one of the few cuts where the blade comes towards you. 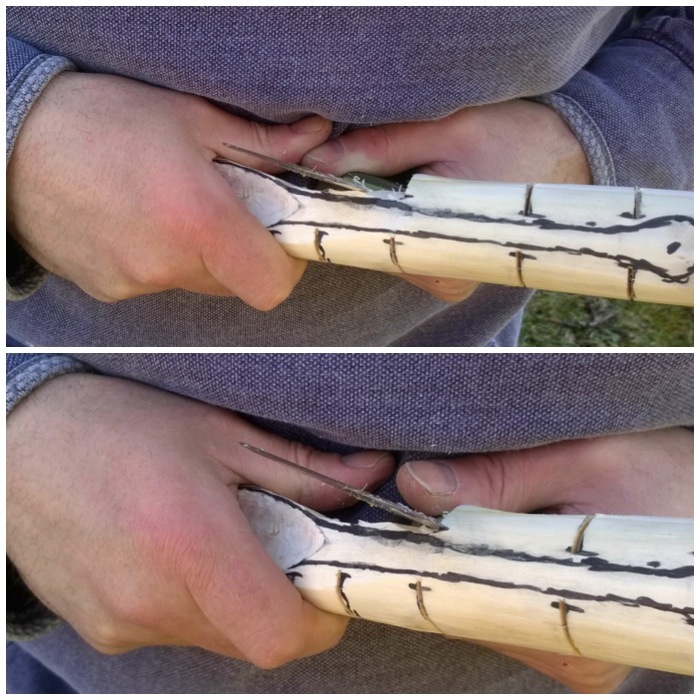 The key to this technique is to keep the arm that is holding the work piece bent and well away from the knife tip. Also the arm that is holding the knife is clamped against my side which stops any big movements. If my knife were to slip with this technique the blade would actually only move a few centimeters. 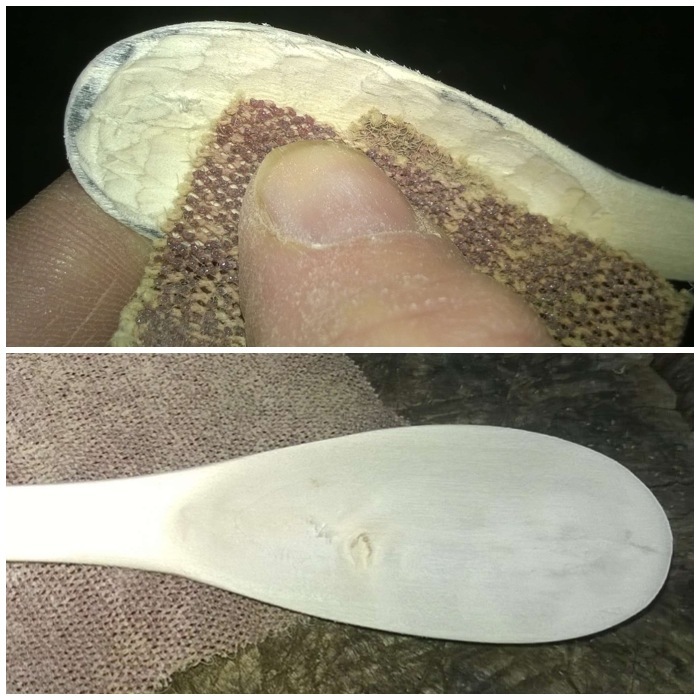 Using these techniques I quickly removed the waste wood around the spoon. 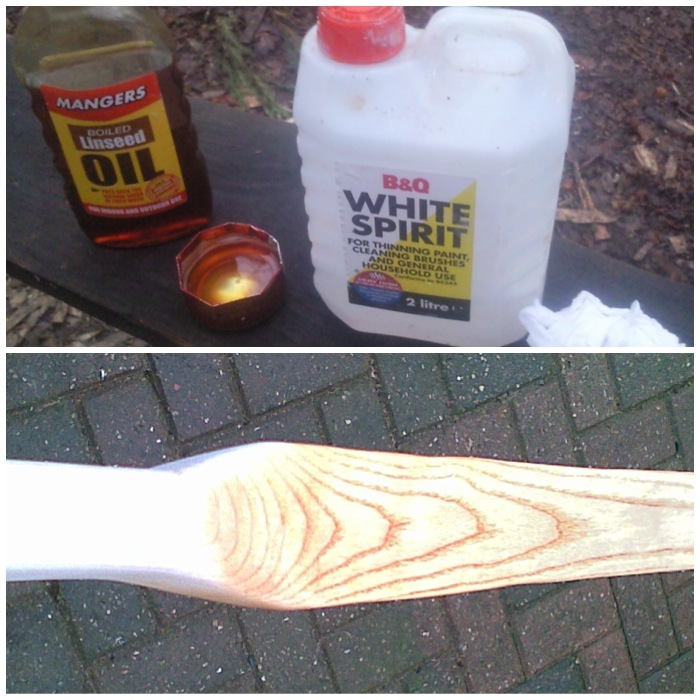 I then marked out the side of the spoon and started to remove the waste wood using the shoulder cut. I could have put stop cuts in at this stage but decided not to as there was not much curve to the spoon on this plane. Finishing the tail and the bowl requires a lot of fine work. You have to find how the grain of the wood is flowing and just chip away at it with small cuts to form your final shape. 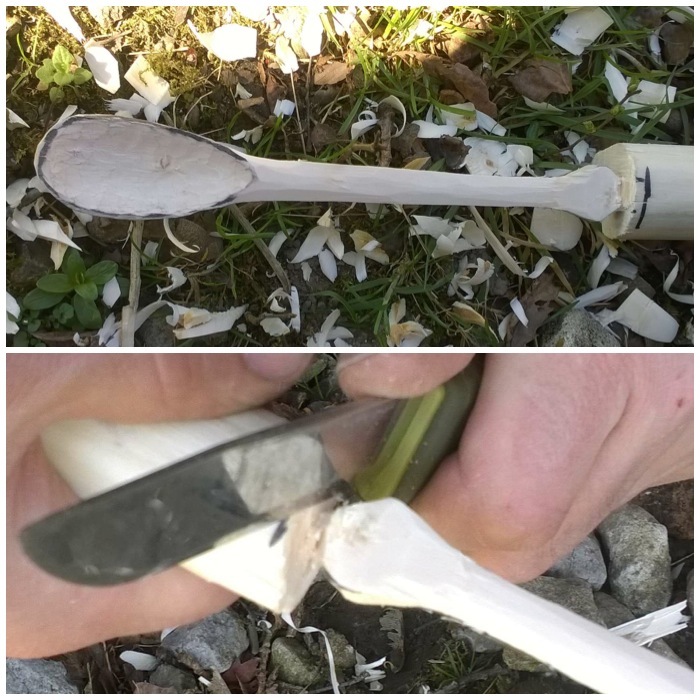 After some final work on the handle of the spoon I slowly carved around the tip of the bowl to remove one of the working handles. 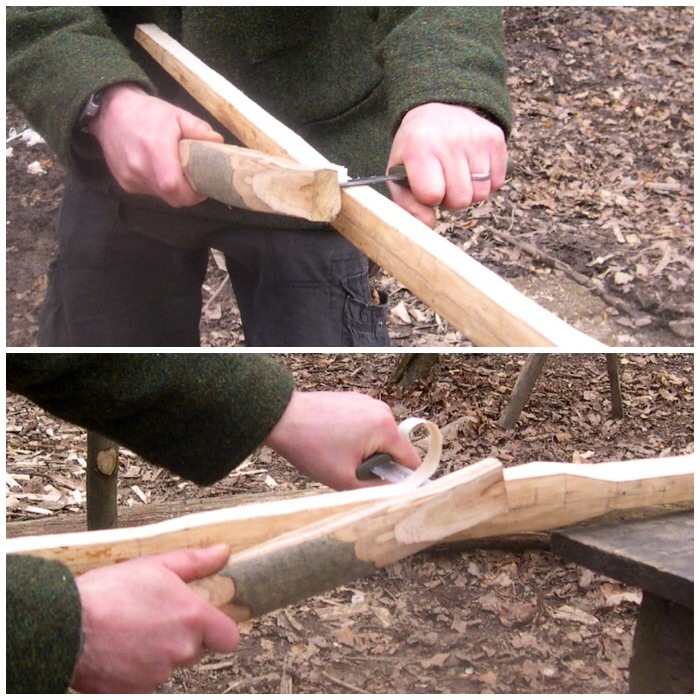 Take your time with this so that you get down to the last few fibres of wood before twisting the handle off. Any big cuts here can damage the bowl. I then repeated the whole process at the other end to remove the other working handle. The wood was green so full of moisture. Normally I would dry the wood slowly for a few weeks before sanding it down. 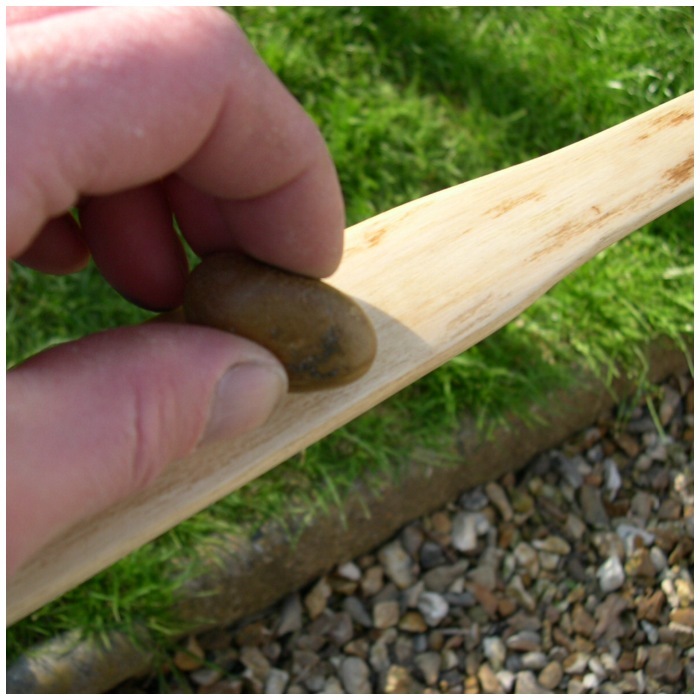 Sanding green wood can be hard work and no matter how smooth you get it you will need to repeat the process in a few days as small fibres of wood will start to rise up again, giving the spoon a furry texture. I accept that when making these spoons as I normally want to use it straight away. Ideally I should have used a piece of seasoned wood so that this would not happen but you sometimes have to use what is available. 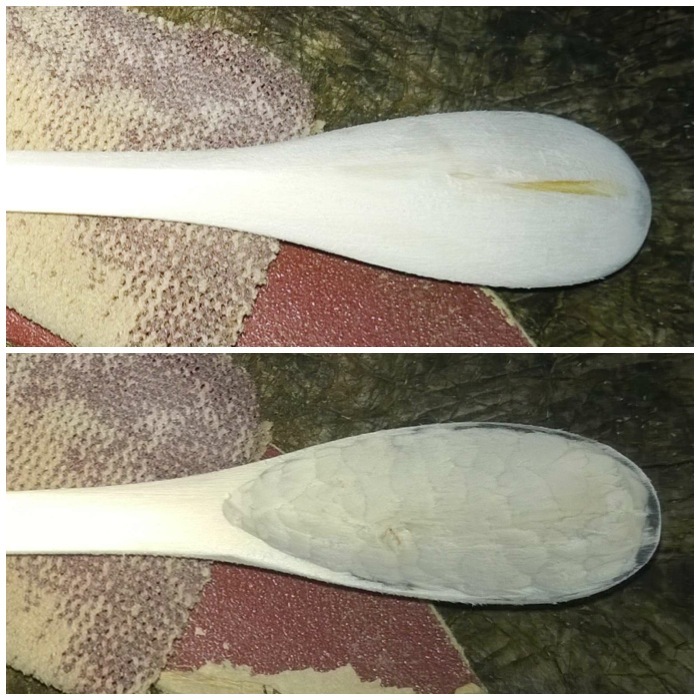 I left the spoon to dry out for a couple of days before sanding it down. I used sandpaper of different grades and luckily have some cloth sandpaper that works well when sanding the bowl out. I used the rough sandpaper first and you can see in these pictures how the fibres of the wood are being ripped out here rather than being sanded smooth. All the sandpaper is doing at this stage is flattening out the tool marks. Eventually the spoon started to take on a more smooth appearance. 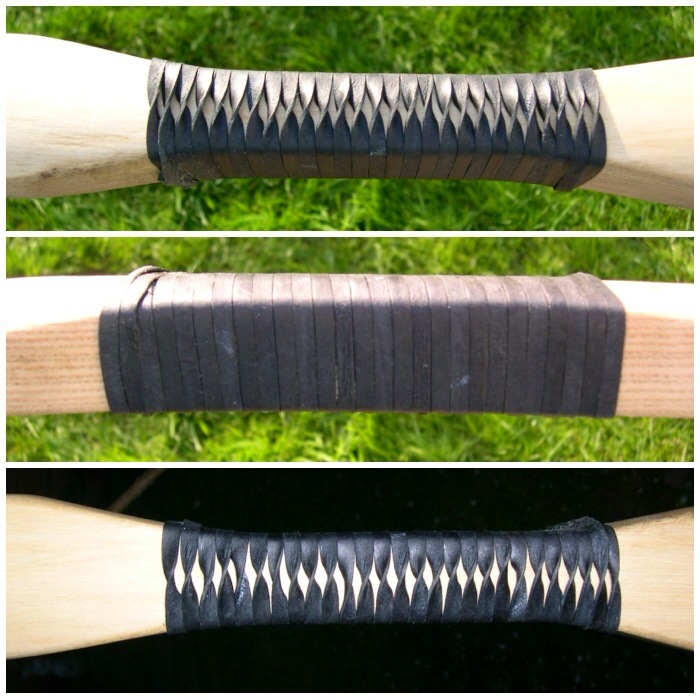 The bottom picture shows the bowl untouched but the handle is now smoother. 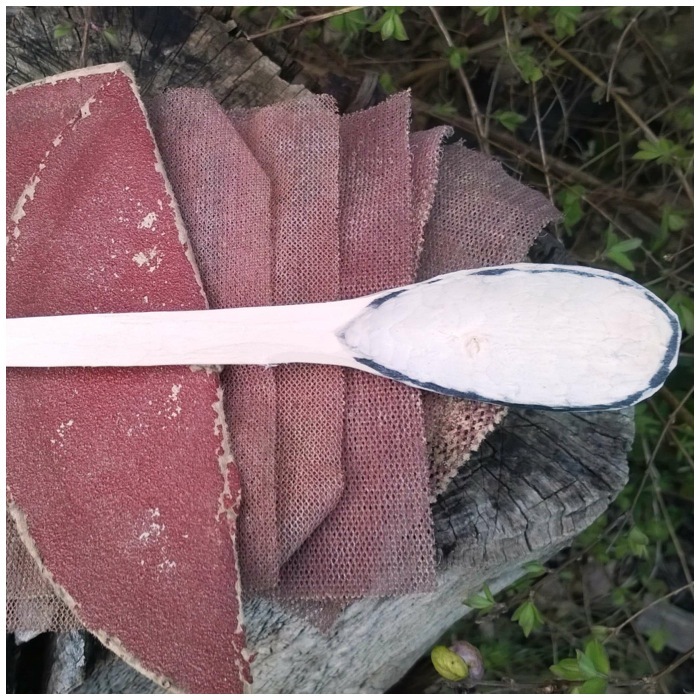 The cloth sandpaper is ideal for getting into the bowl and smoothing it out. I like this sandpaper as it does not break apart in the bowl as traditional paper-backed sandpaper tends to. 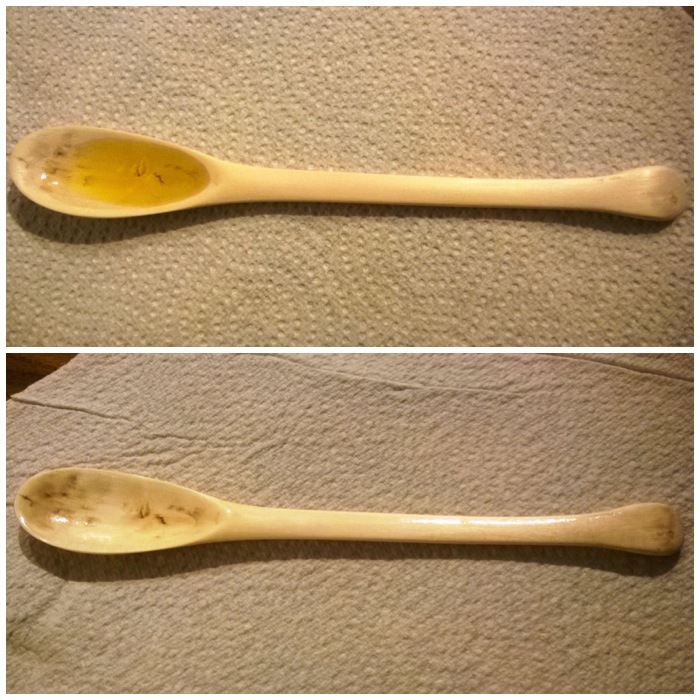 After sanding the spoon down using a mixture of grades from rough to very fine (about a half hour’s work) I added some oil to the spoon. 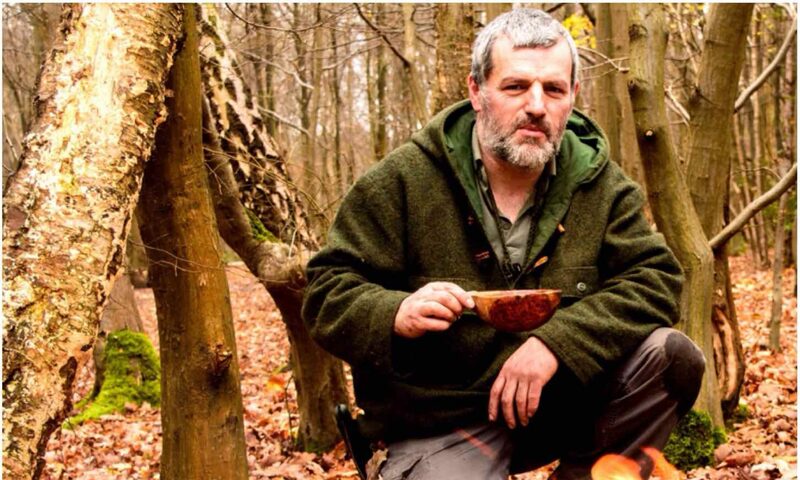 I generally use vegetable oil as that is what I usually have in my cooking kit when out in the woods. After the first coating had soaked in I applied a second coating and left the spoon to dry out. I like to add a finishing touch by boning the spoon. 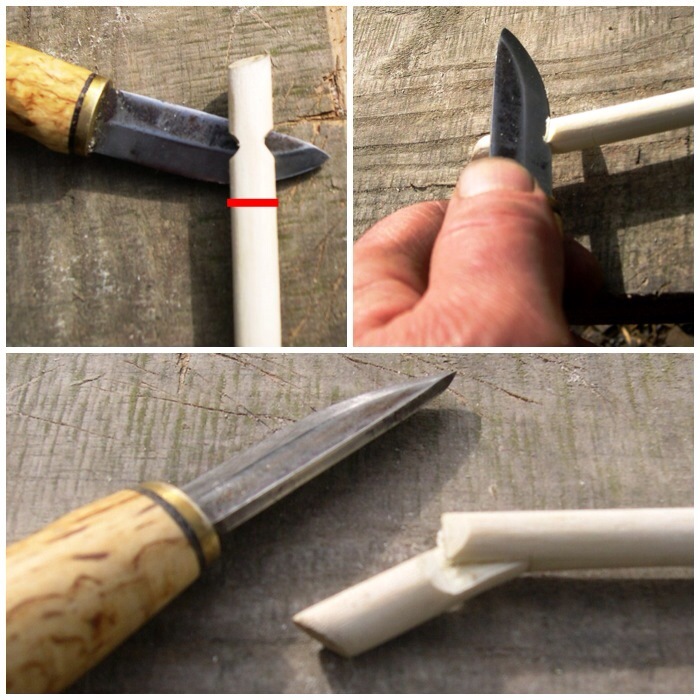 You can do this with the back of a spoon, a rounded pebble or with a rounded piece of bone. I rub the spoon with the rounded surface in a circular motion covering the whole of the surface area of the spoon. I normally do this for an hour or so as this seals the fibres of the wood down and adds a beautiful shine to the spoon. 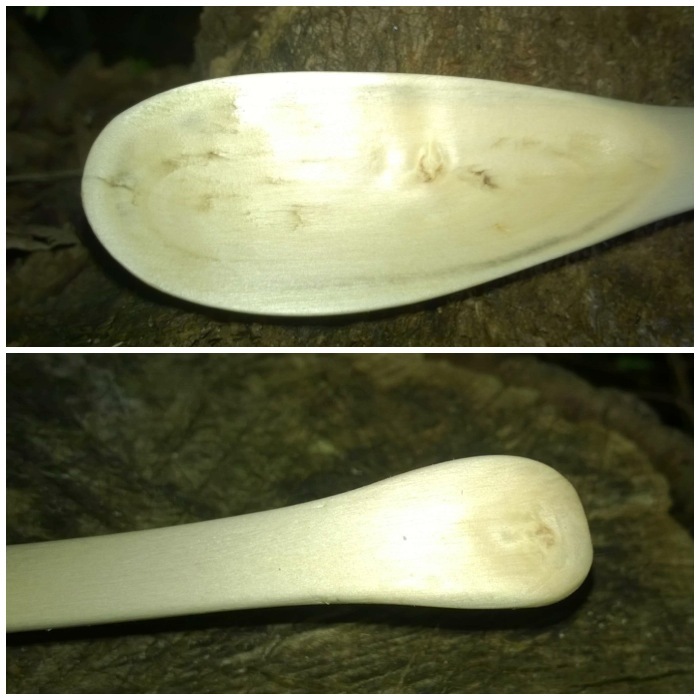 This spoon will need to be re-sanded, oiled and boned again in a few weeks as the fibres rise up as it dries out. You can see that the bowl is not perfectly smooth and there are slight imperfections in it. Hopefully these will disappear with that second sanding but for now it is a spoon I can use. 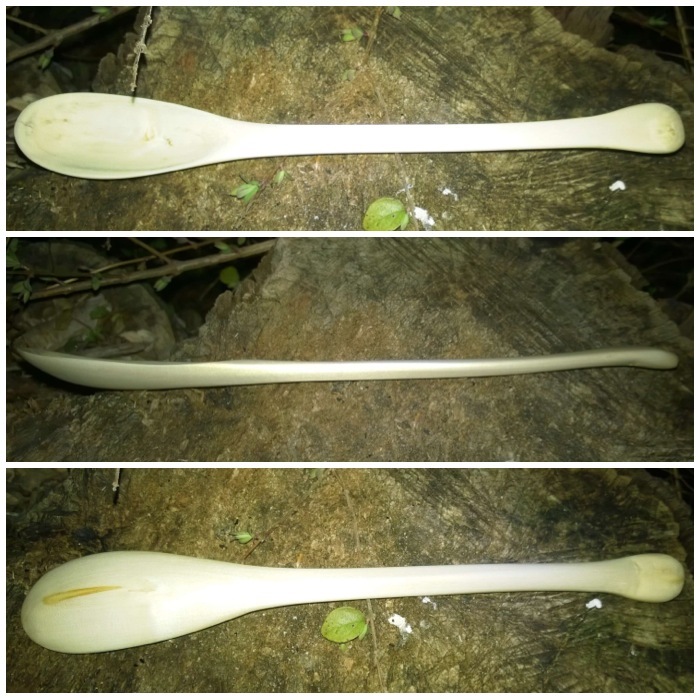 The different profiles of the spoon. 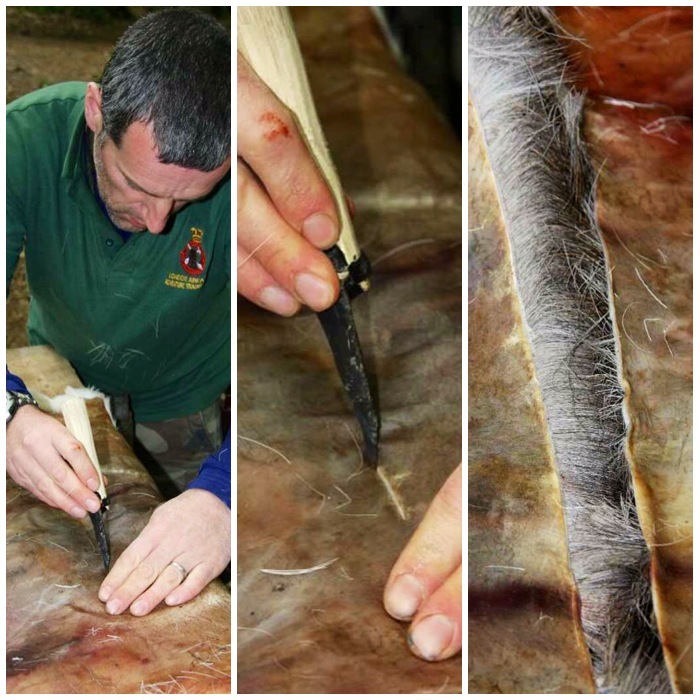 Have a go and try out some of these different cutting techniques. I put this How To…. 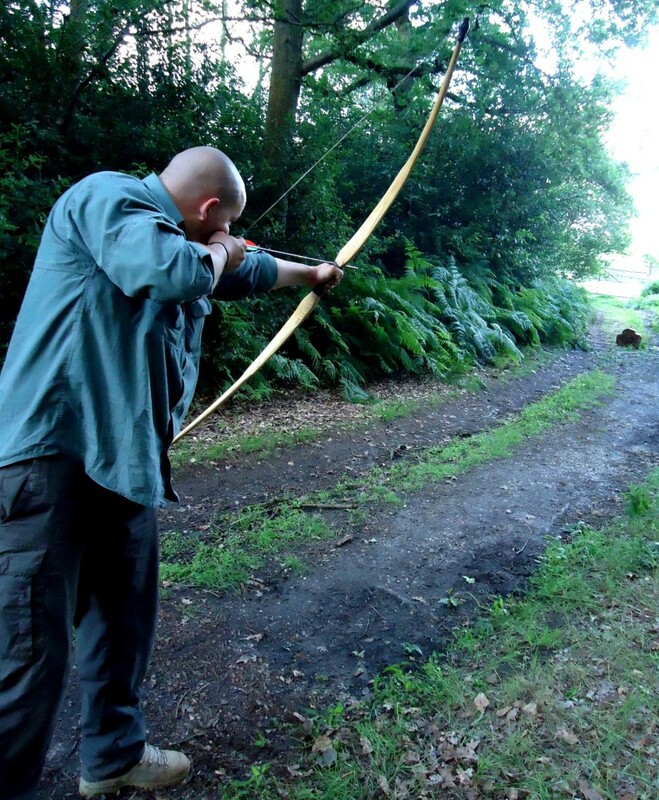 together to show how to construct a couple of primitive arrows. 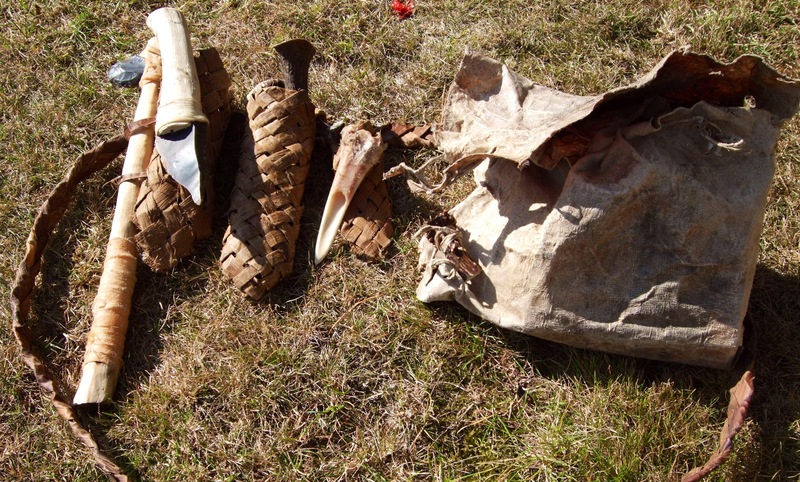 I used mainly primitive tools with the exception of a few modern touches: the occasional use of a steel knife, adding false sinew when I ran out of real sinew, some sandpaper, a copper-tipped flaker and bleached feathers. 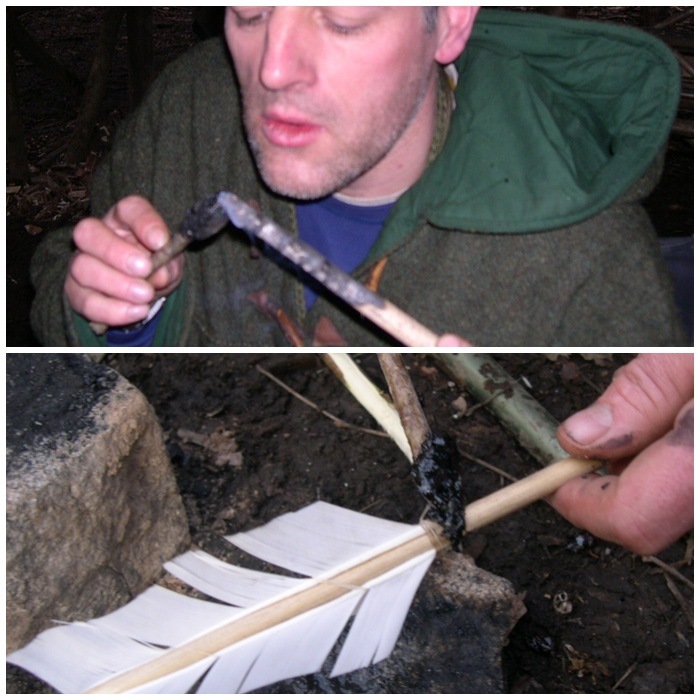 I made these arrows while on the Woodcraft School Primitive Technology course in 2009. 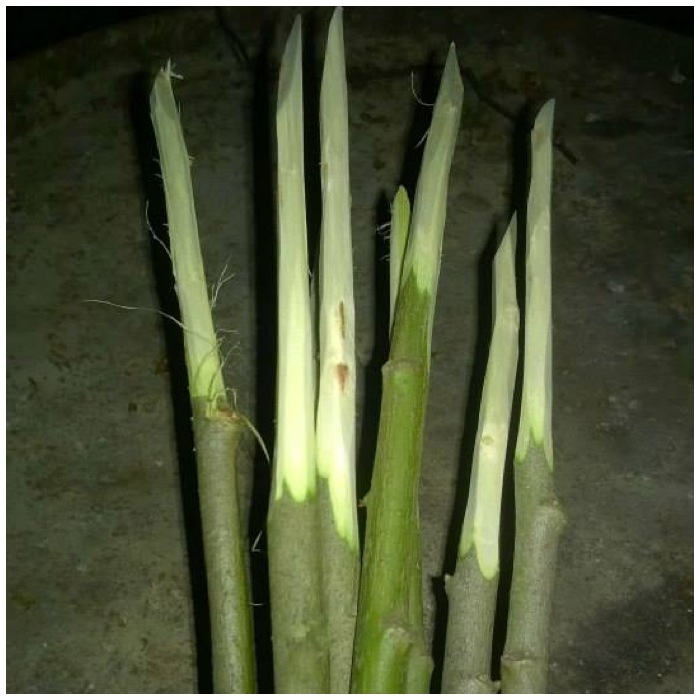 John Rhyder the course instructor supplied us with pre-cut branches from a spindle (Euonynus europaeus) tree, which has traditionally been used for the manufacture of arrows as it is a hard wood and takes a point well. 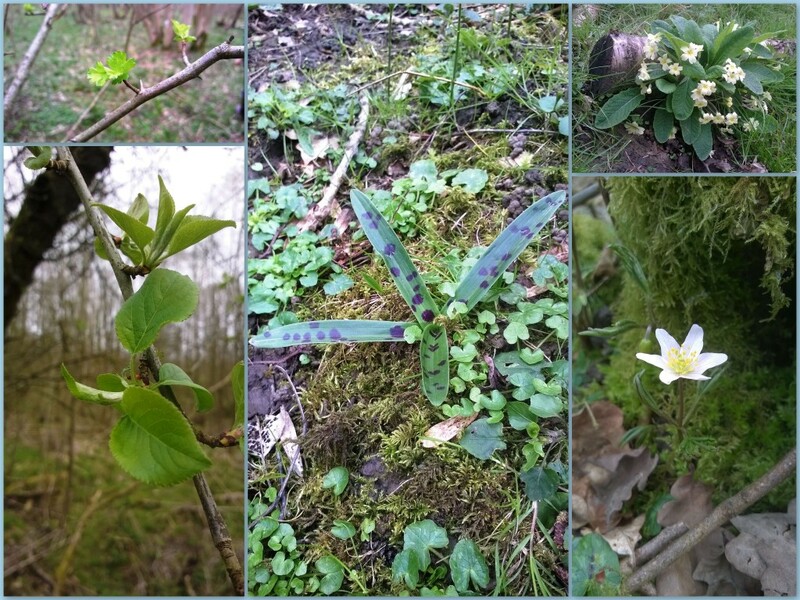 Another option that was available to us was hazel (Corylus avillana) as there was some on site. 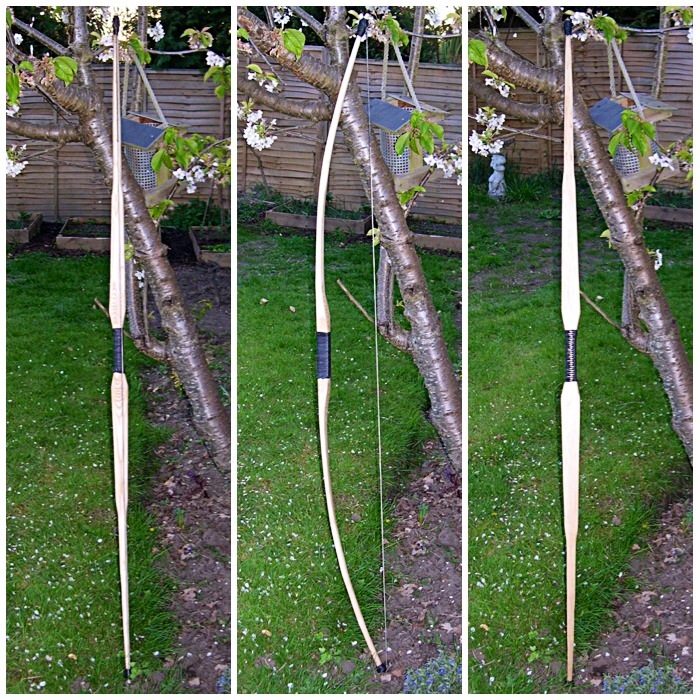 I chose to use spindle as I had never used it before to make arrows. 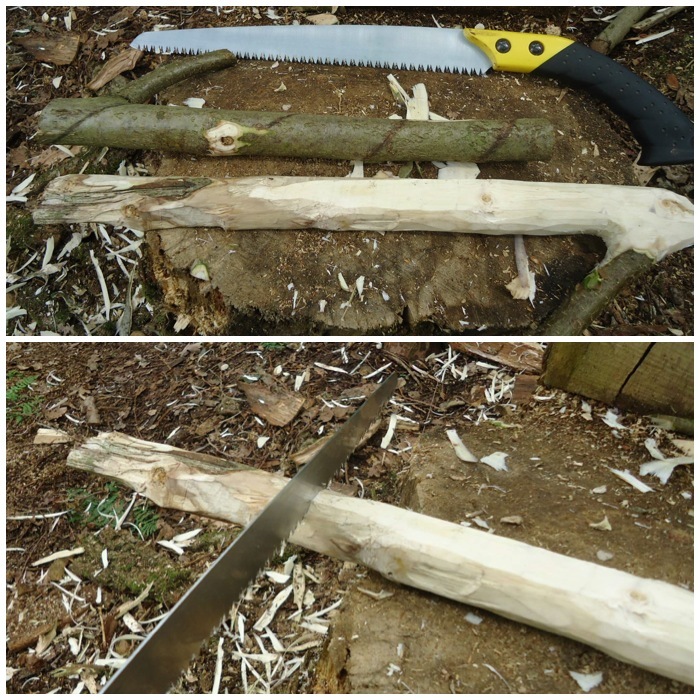 I used the back of my knife to scrape the bark off the wood but this would traditionally have been done with a piece of sharp flint or other such stone. 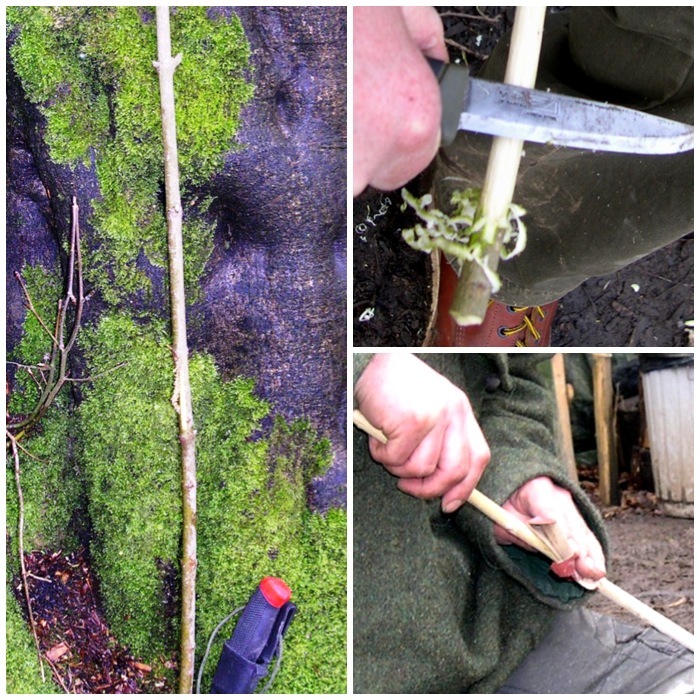 For safety I kept the knife still and pulled the green stick backwards, scraping bark off with the back of the blade. 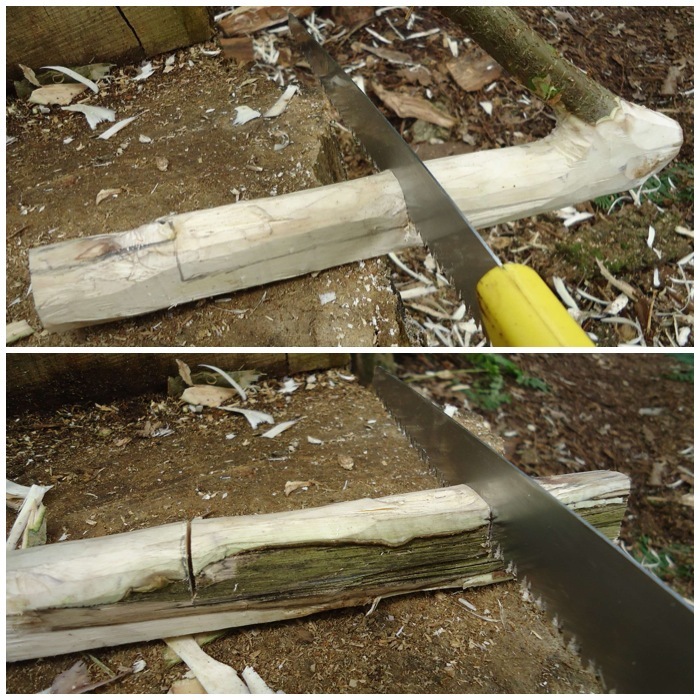 I like this method as the blade stays still making it very safe. 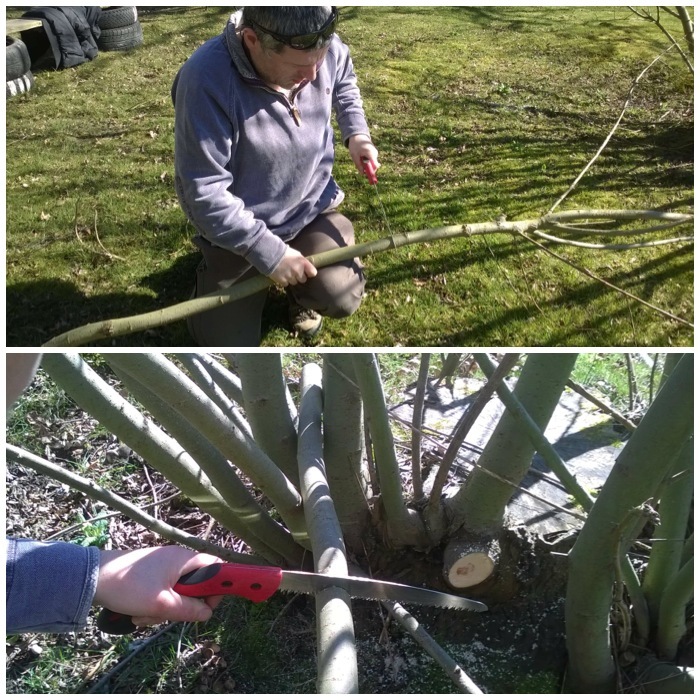 I then roughly sanded each of the branches with sandpaper. This could have been completed traditionally with either a handful of sand or a soft rock such as sandstone. 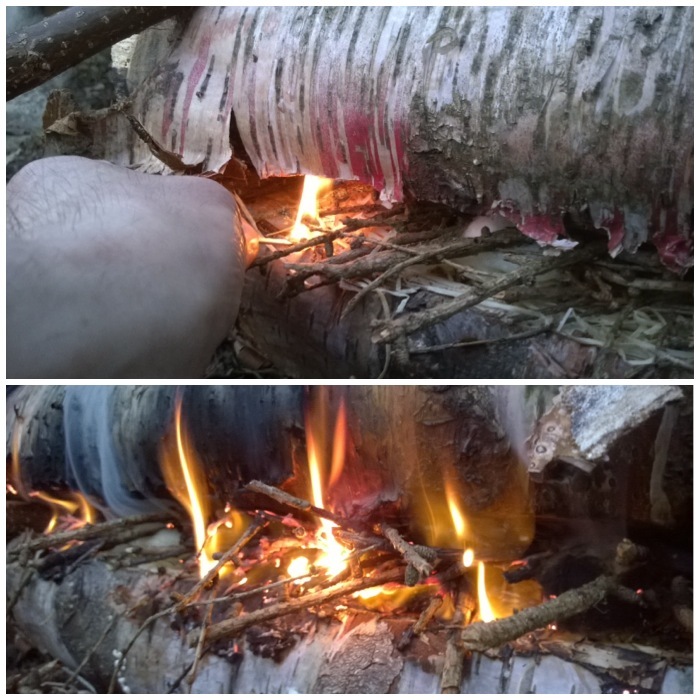 I then heated the branches over an open fire. 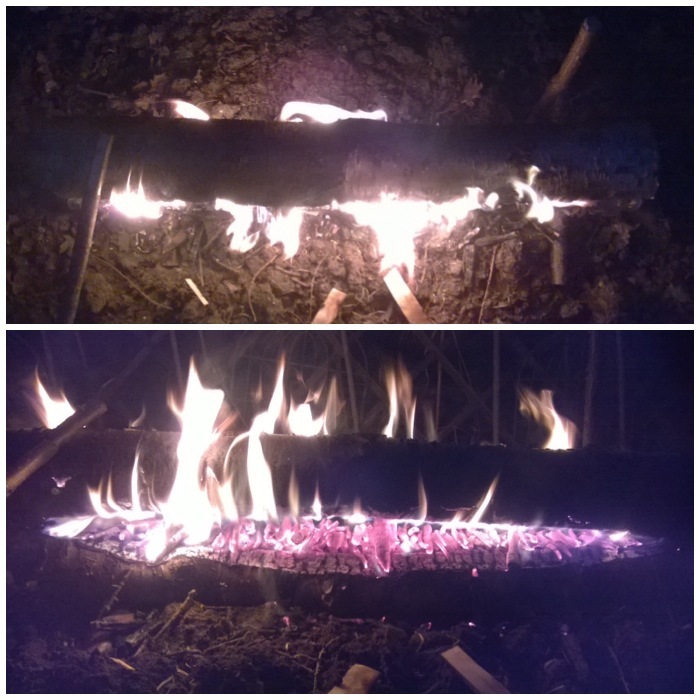 I was careful not to scorch the wood as this changes its properties and makes it brittle. 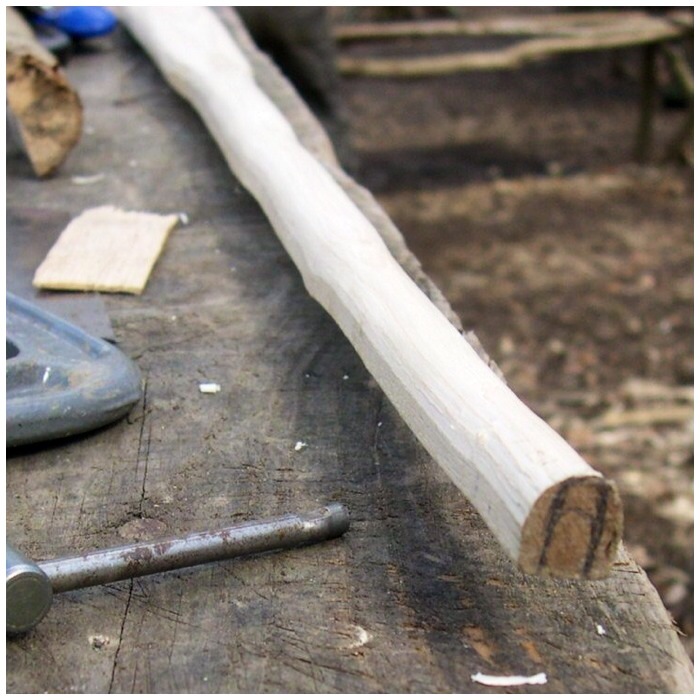 The trick is to slowly turn the branch in a circular fashion, heating evenly all around the section of wood that needs straightened. 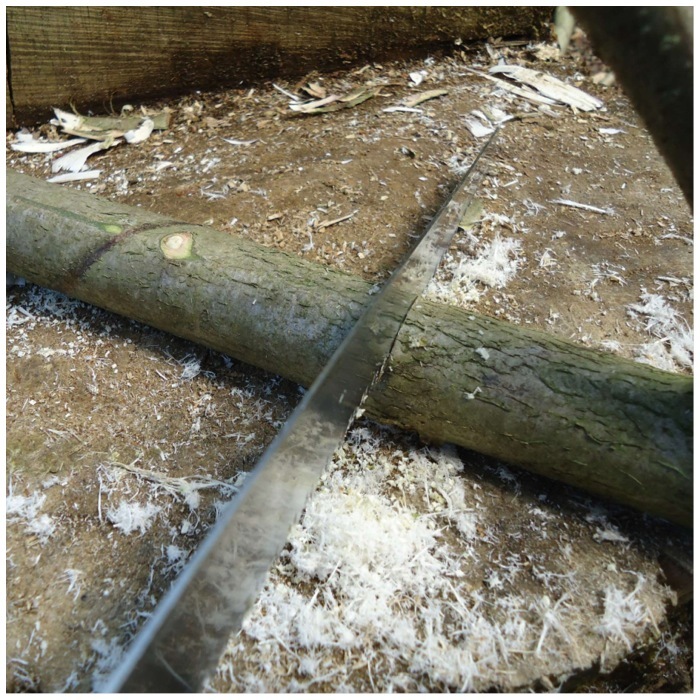 This in effect creates steam in the wood as the sap heats up and so allows you to slowly straighten the arrow (this method works best on green wood). 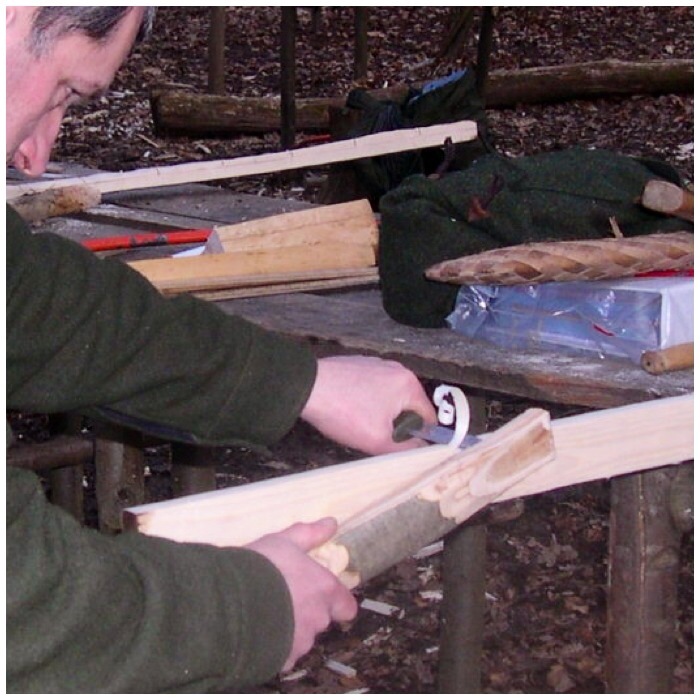 To straighten the bumps in the wood you need to hold it in position (as straight as possible) until it cools and sets into its new shape. 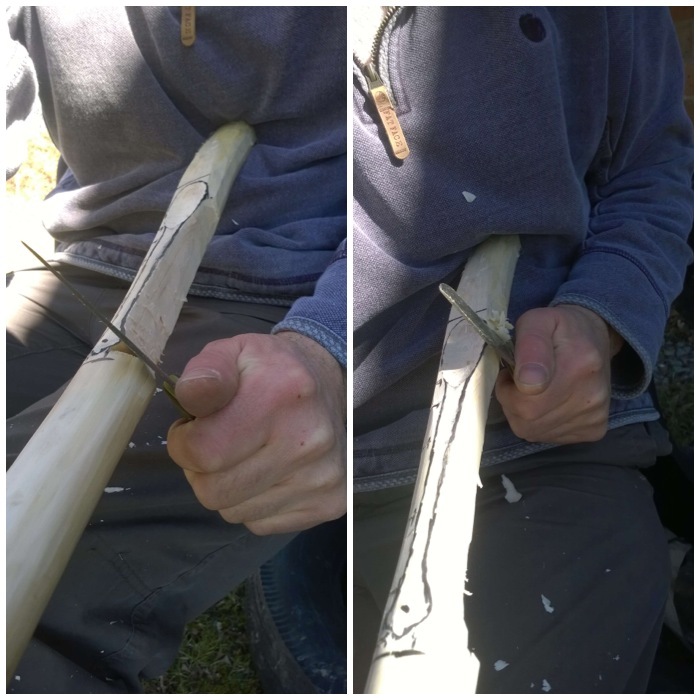 Next I needed to make the nock for the string. 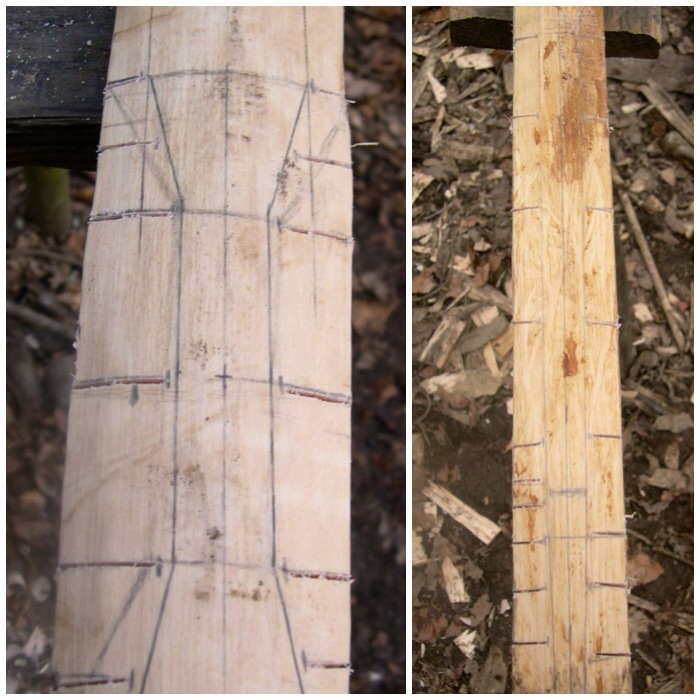 I cut two small grooves (opposite each other) at the thin end of each shaft. Then about a centimeter down the shaft (showed here in red) I rolled the knife edge to mark a thin line at 90 degrees to the first grooves (too fine to see in the picture). 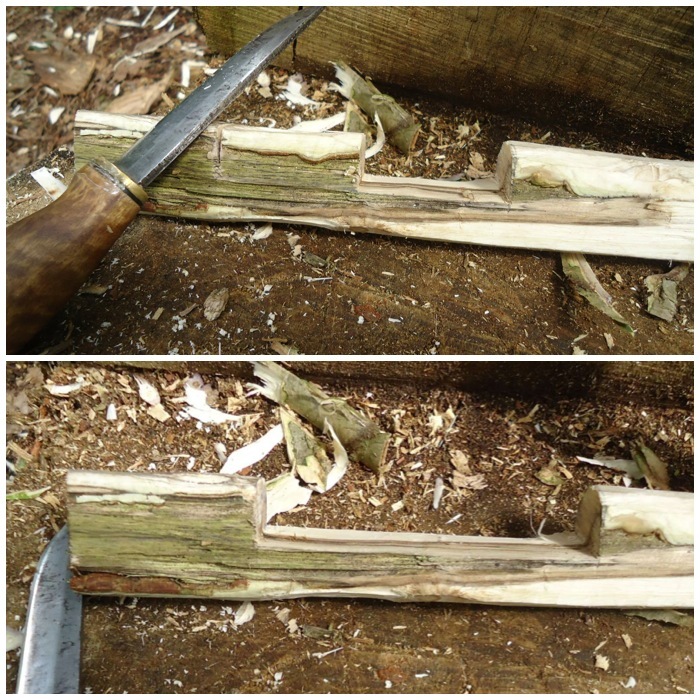 I then placed the edge of the knife into one of the larger grooves to split the wood down to the lower line. 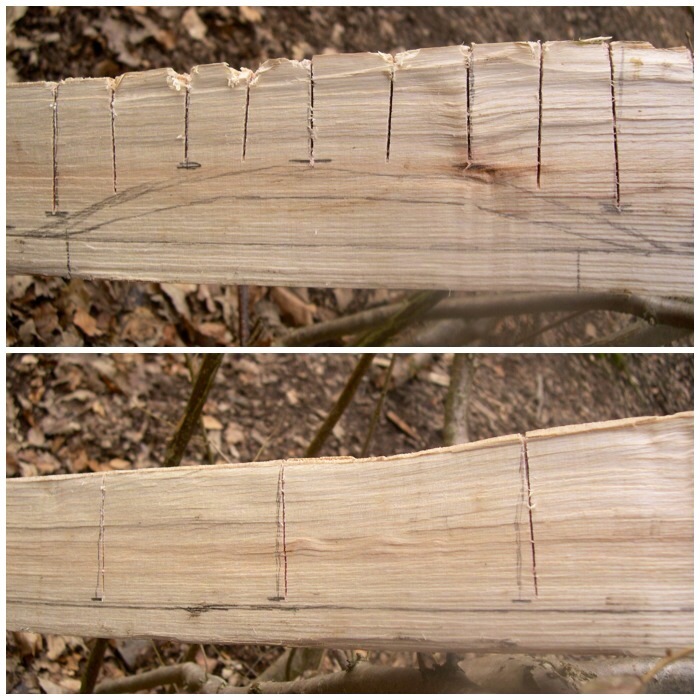 The small cut in the wood at the lower line helps stop the split running off too far. 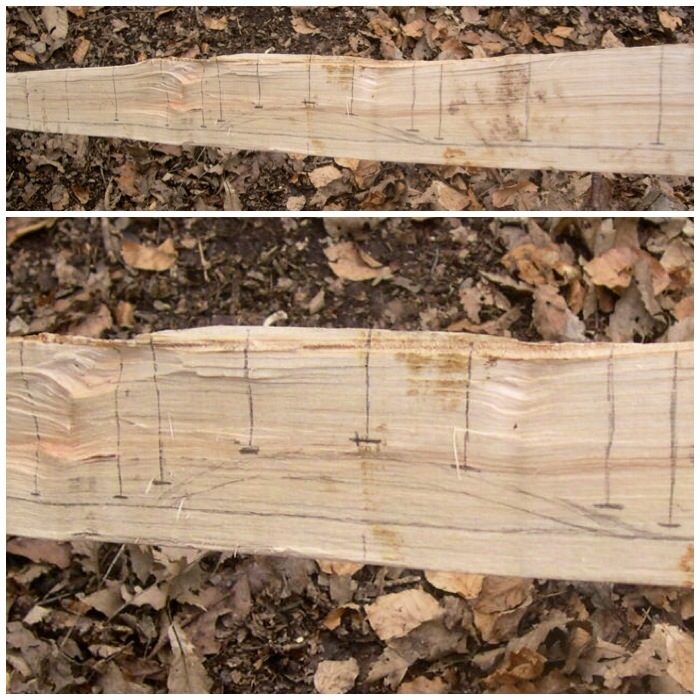 I then repeated the procedure on the opposite groove. I wiggled the centre section back and forth until it started to break away from the main arrow shaft. 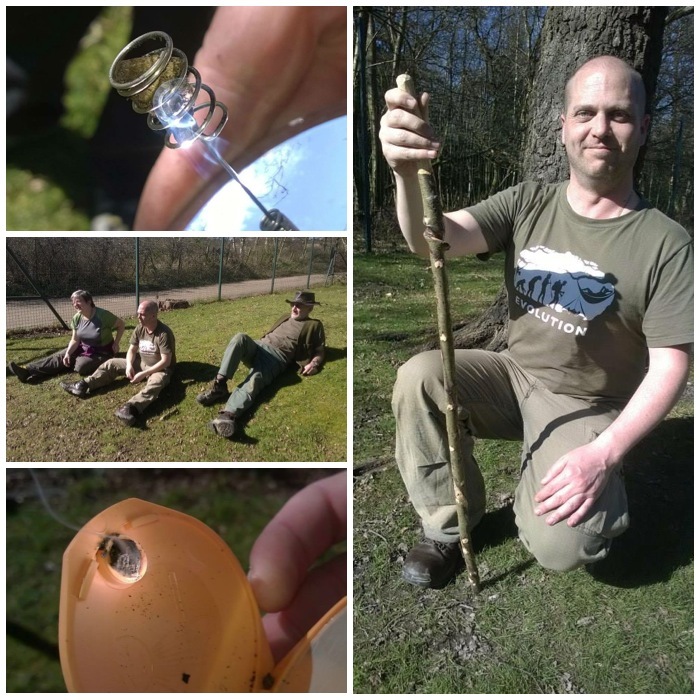 In the bottom picture you can see the nock starting to appear. 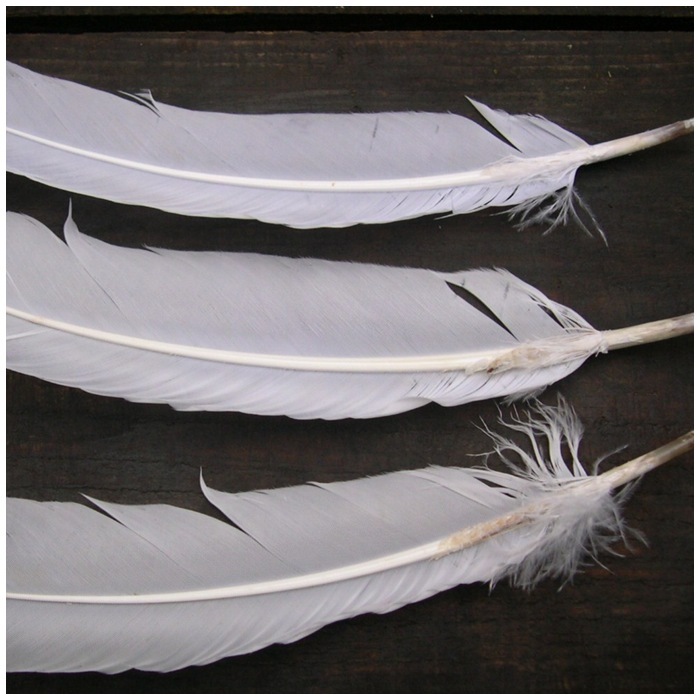 John Ryder provided feathers for us to use. 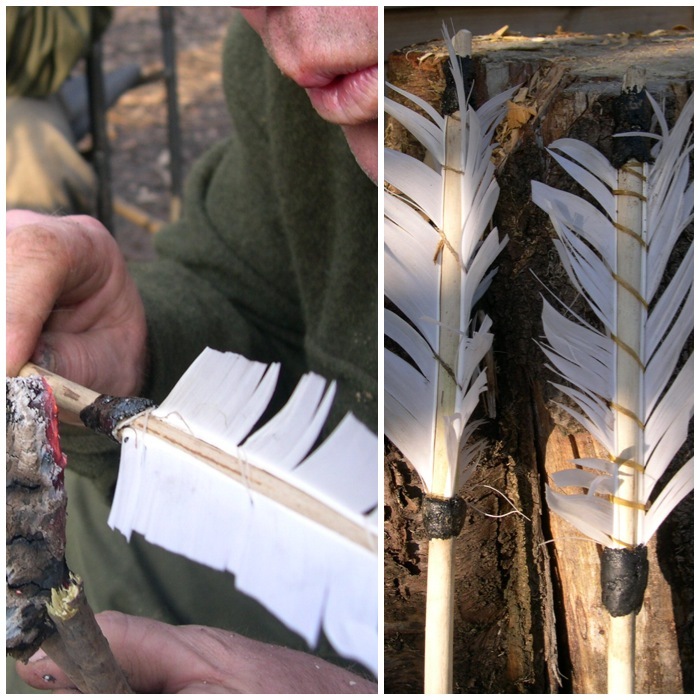 Due to health and safety requirements John had to supply his students with feathers that had been washed: traditionally of course the remnants of bird kills would have been kept and the feathers used for this job. 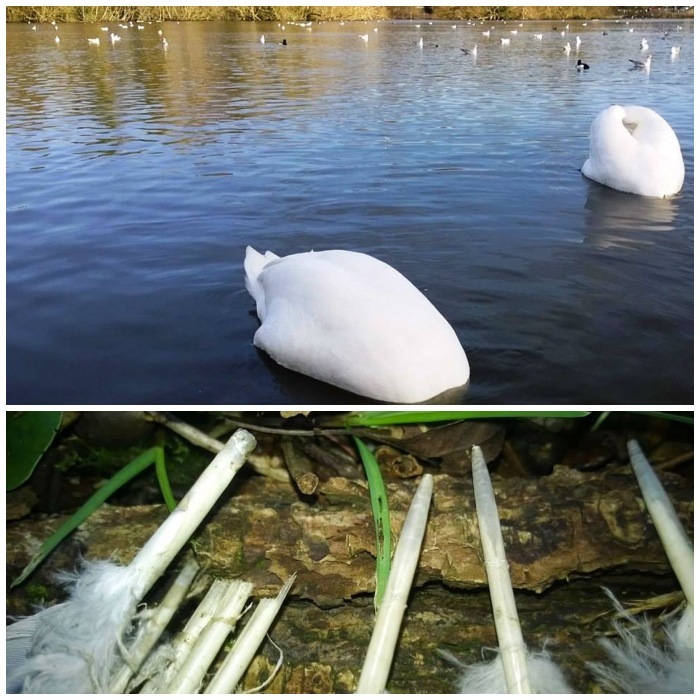 If the feathers are from the same wing they make excellent flights, making your arrows more accurate. 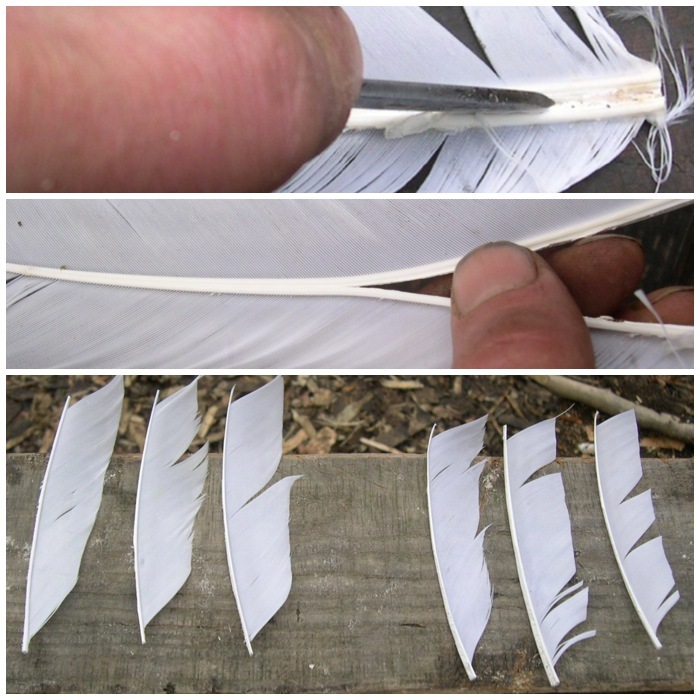 I used my knife tip to start the split of the feathers to create the flights – a sharp piece of flint would have worked just as well. 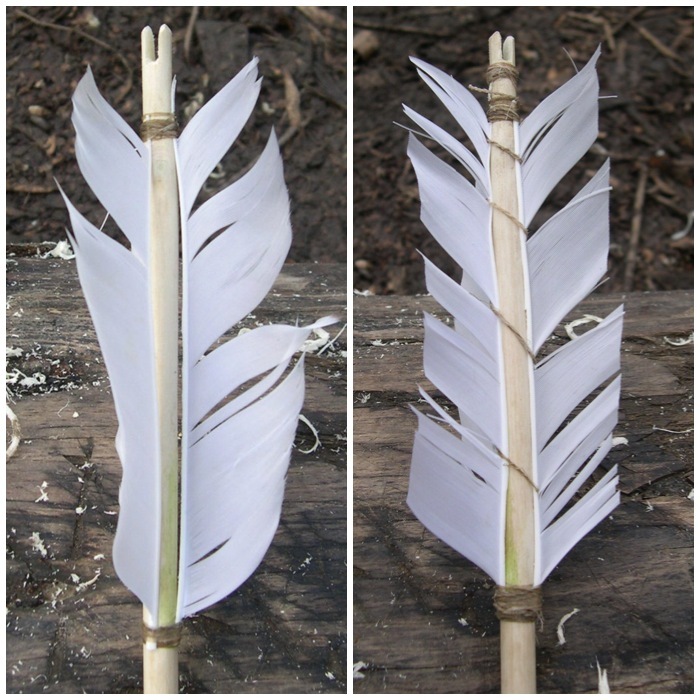 After the initial split had been made I used my fingers to split the rest of the feather. 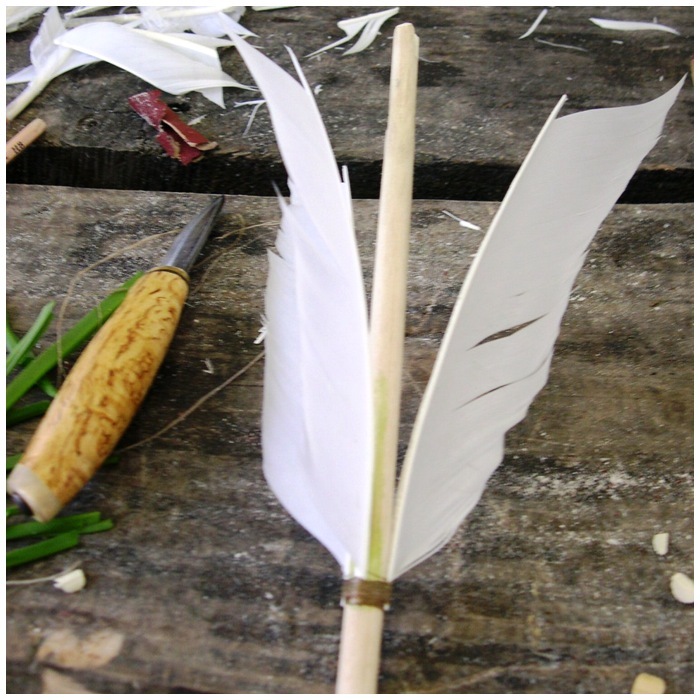 I tried to be very careful here to keep the split in the centre of the spine of the feather all the way to the end. It gets a bit tricky as it tapers out near the end. 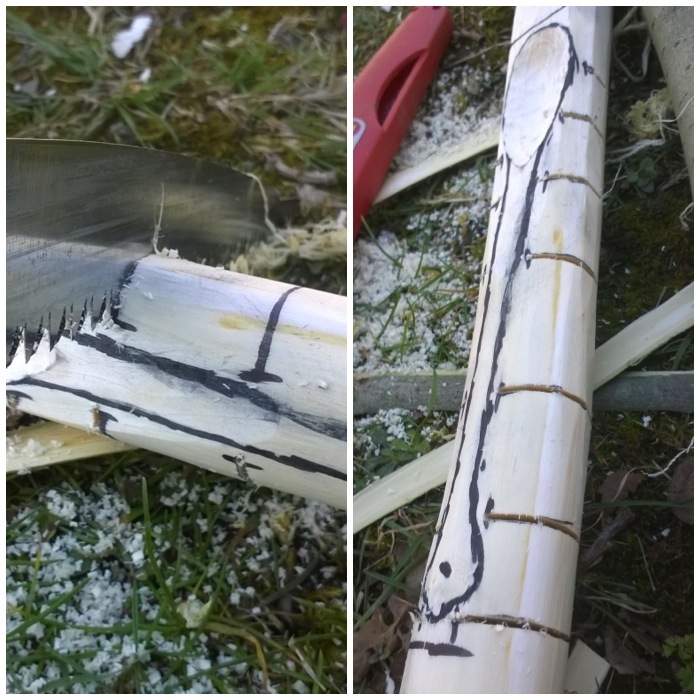 I split and trimmed the feathers leaving enough of the spine at each end for wrapping purposes. 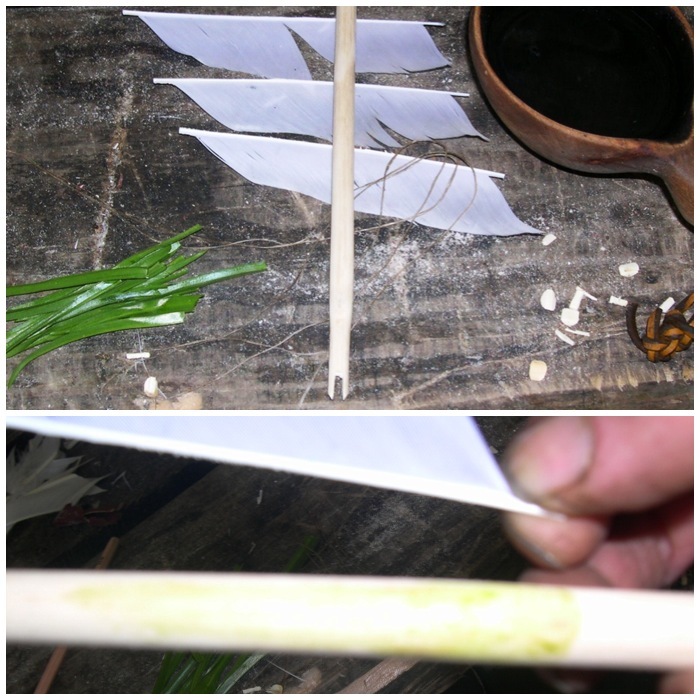 To wrap the feathers onto the shaft I used deer sinew. 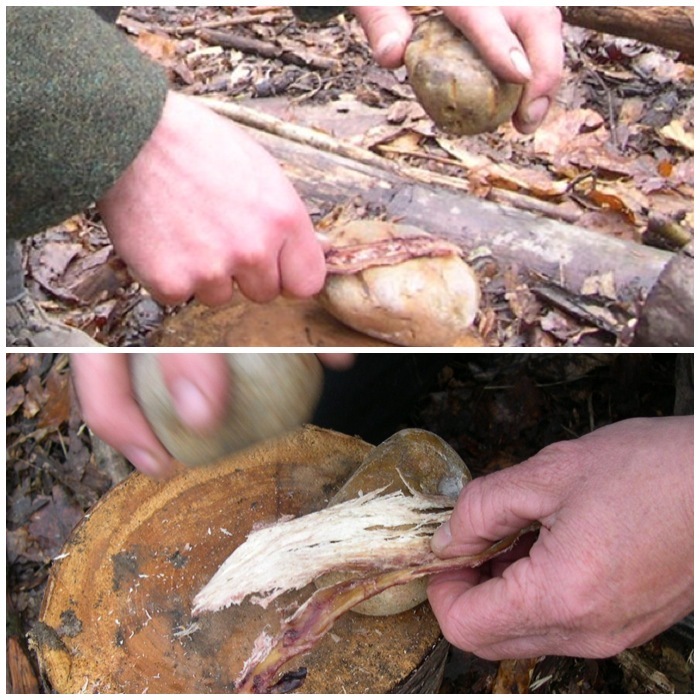 This needs to be pounded gently between two stones until all the sinew fibres separate. This takes time but it is worth it to see all the strands of sinew start to appear. Here you can see the fibres starting to really fall apart. There wasn’t enough real sinew for everyone so I had to supplement it with some false sinew: dental floss is another possible alternative. 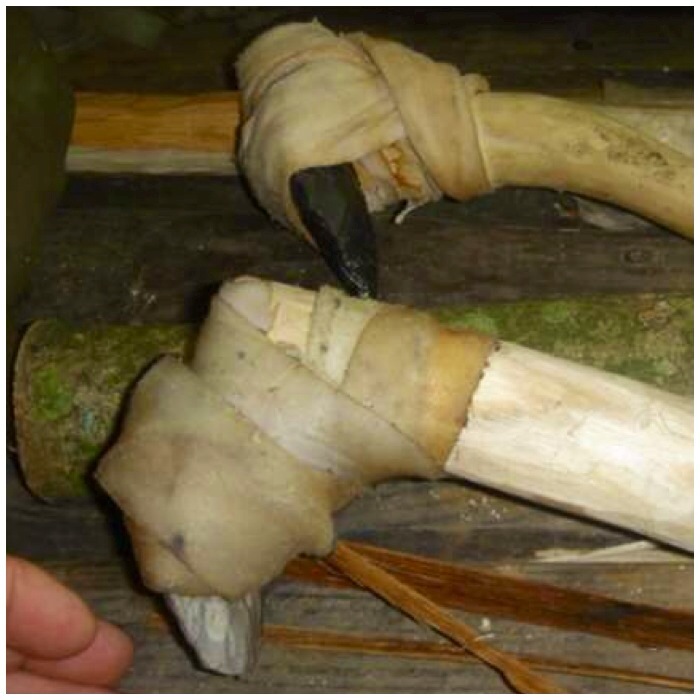 I rolled the sinew strands to make them stronger and wet each strand with saliva. 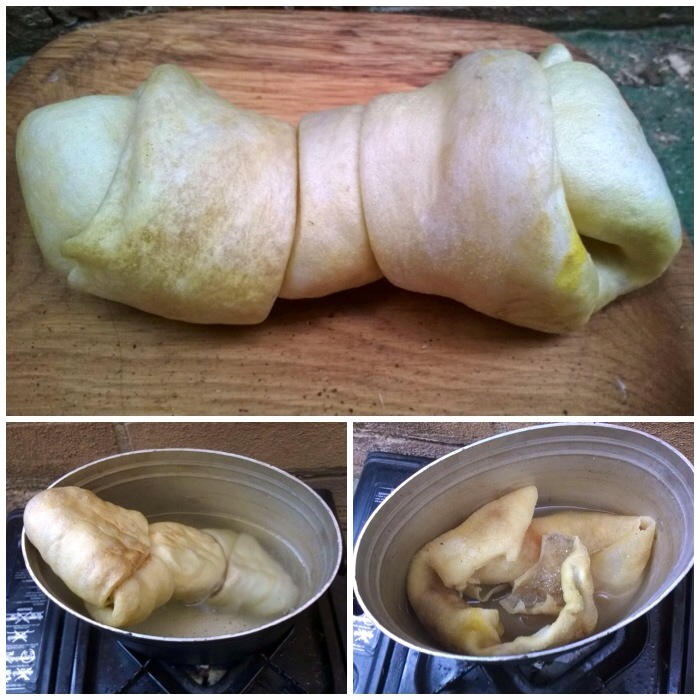 This allows the sinew to bind to the shaft as the fats in it act like a glue when wet. 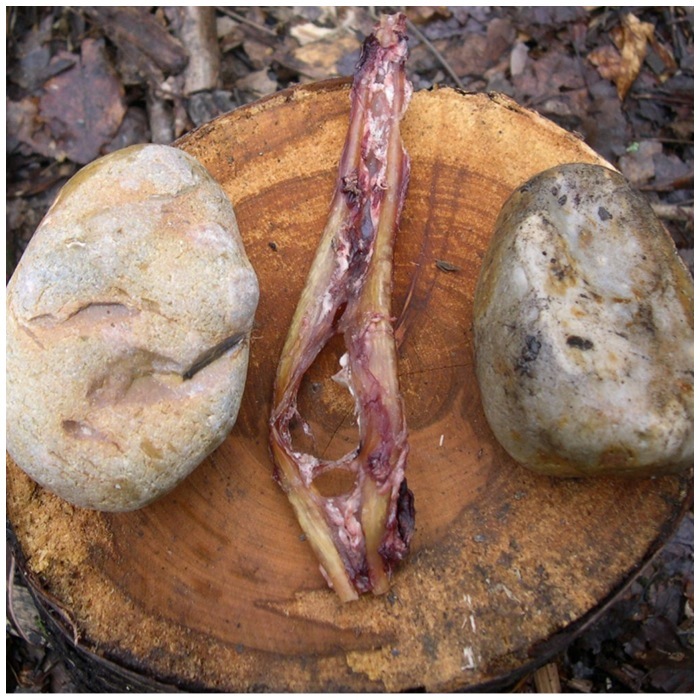 On the right you can see some sinew that is ready to use as wrapping. To aid in the process of attaching the flights to the shaft I tried out another type of glue made by crushing bluebell leaves to a pulp between my fingers. The resulting gloop was supposed to act as a first fixing to help keep the flights in place before wrapping; it turned out to be a little bit tacky but nowhere near strong enough to act as a glue. 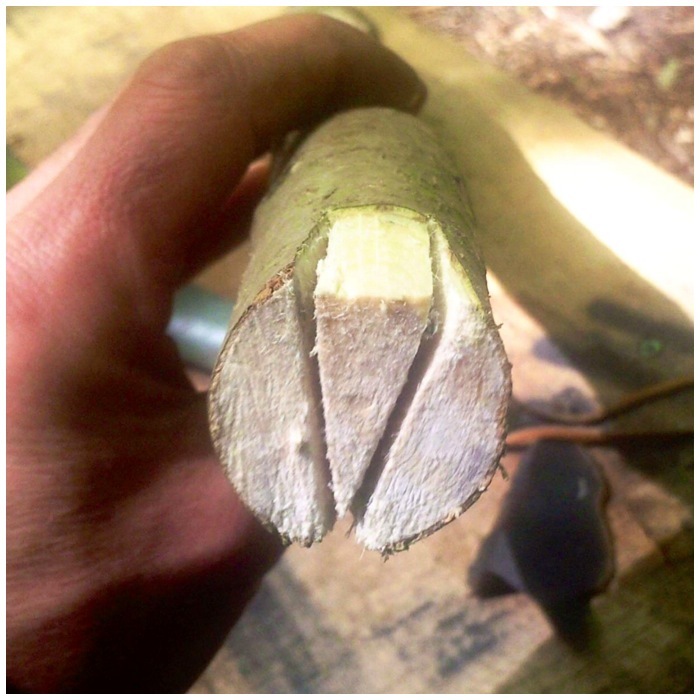 In the bottom picture you can just make out the shaded area on the shaft where the bluebell ‘glue’ was placed. In the end I just used sinew to hold the flights in place. You can see the bluebell stain on the shaft in this picture. 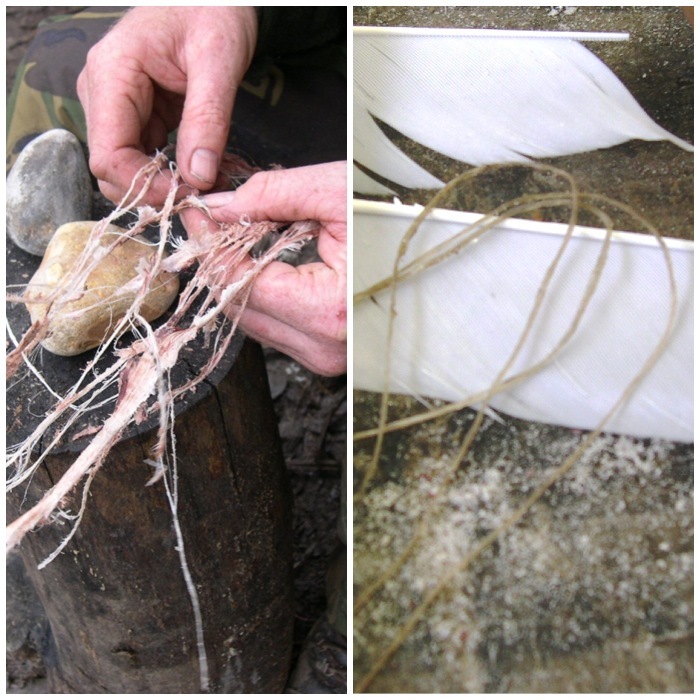 I then wrapped the flights at the top with sinew (bottom left) and then to finish this stage I wrapped the body of the flights with more sinew (bottom right). 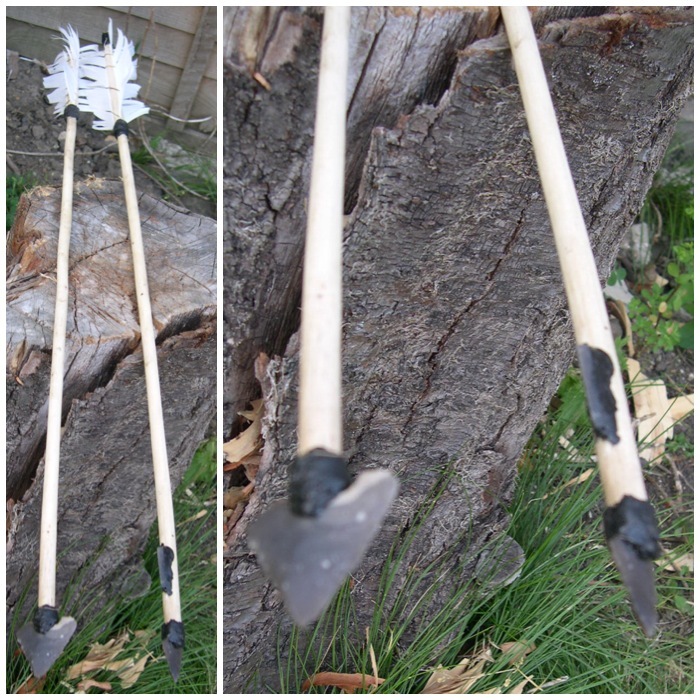 I also wrapped sinew just below the nocks on each arrow to strengthen them. You can see this clearly in the arrow on the right. 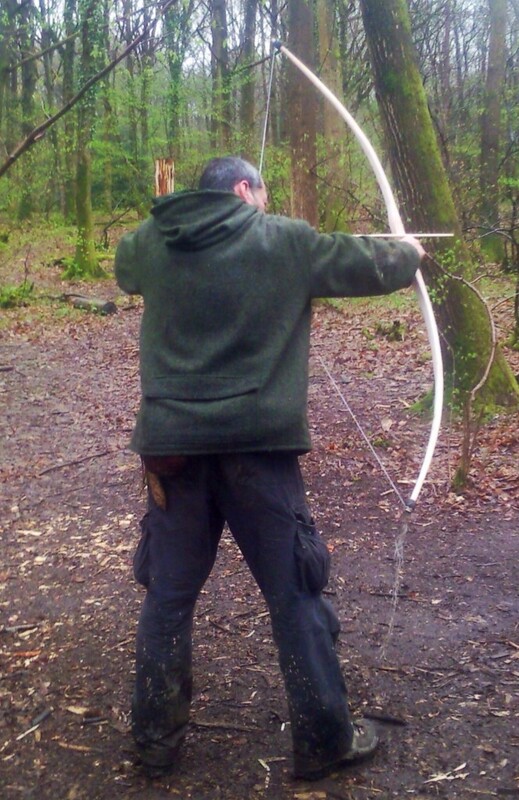 If I hadn’t reinforced the nocks with sinew they could easily have split with the forces of the bow string as soon as I shot them. 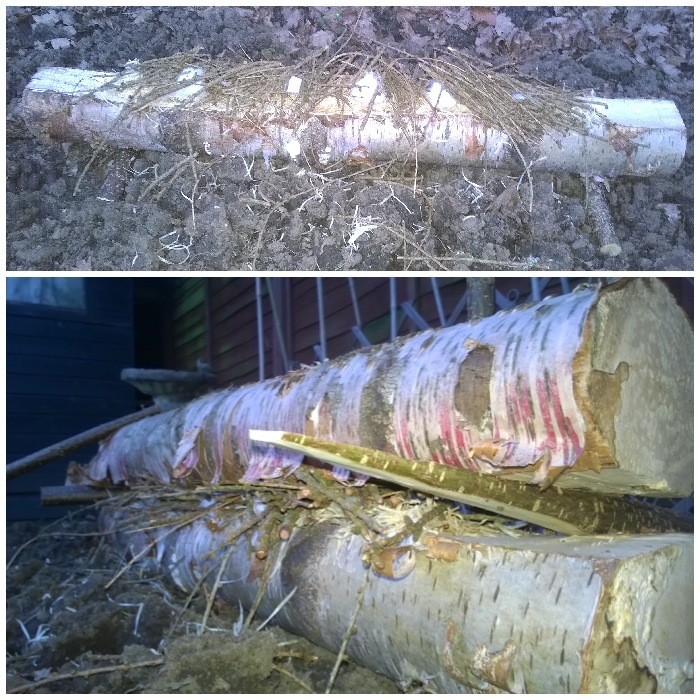 Once the sinew was attached to each arrow I decided to put together some pine pitch. This was to cover the sinew to protect it from fraying and also to waterproof it. The name pine pitch is a bit misleading as I used spruce resin, since that was what was readily available in the area. 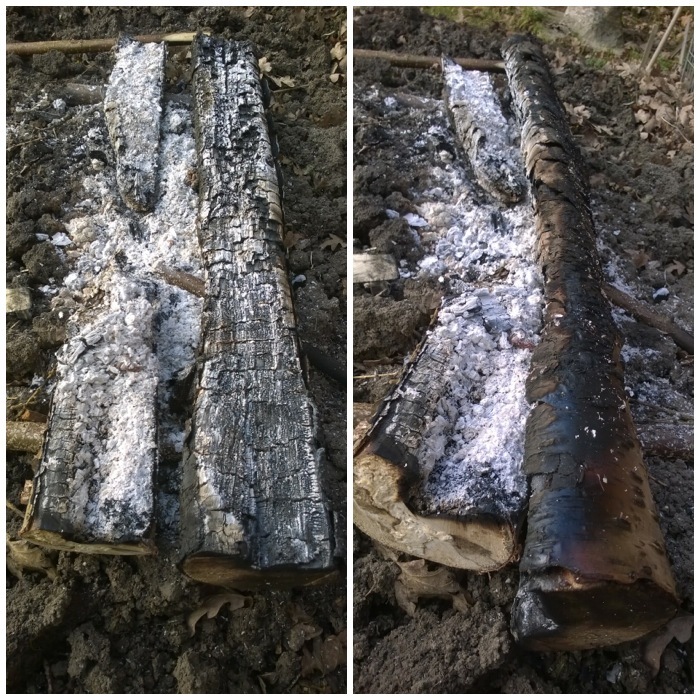 After collecting the resin that had oozed from spruce trees (the tree uses the resin to seal any damaged areas on its bark) I mixed it with fine charcoal (to give it strength) and beeswax (to give it flexibility). 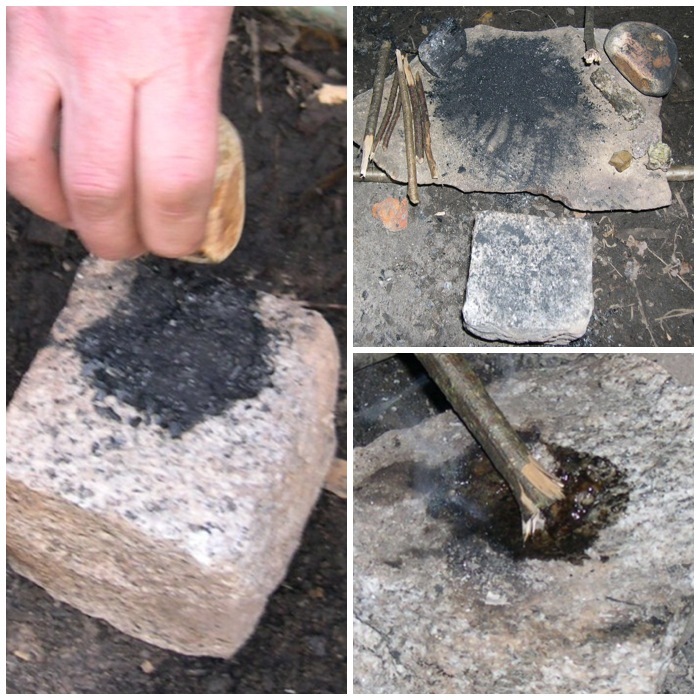 I used the small rock (left hand picture) to grind the charcoal and a large flat rock (top right) as a preparation table. 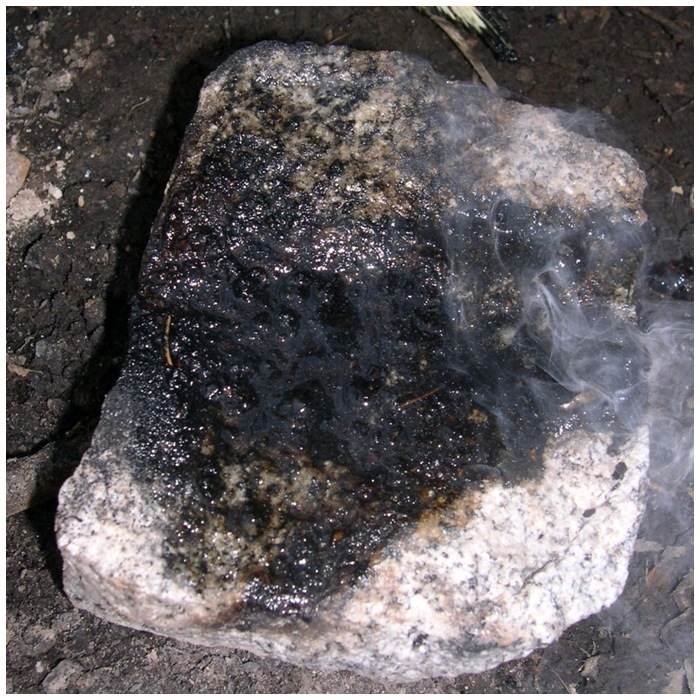 I heated the square rock in the fire to help with melting and mixing everything together. 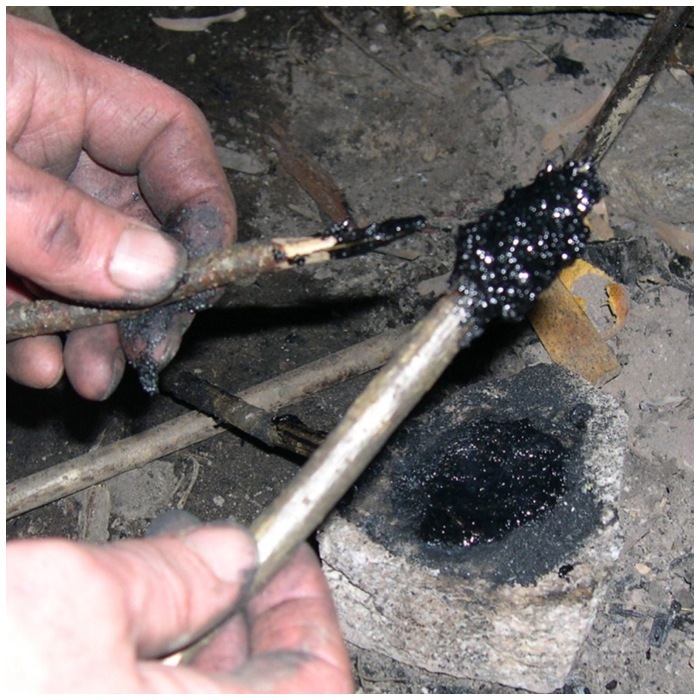 The sticks were used as mixers and to store the resin (see below). 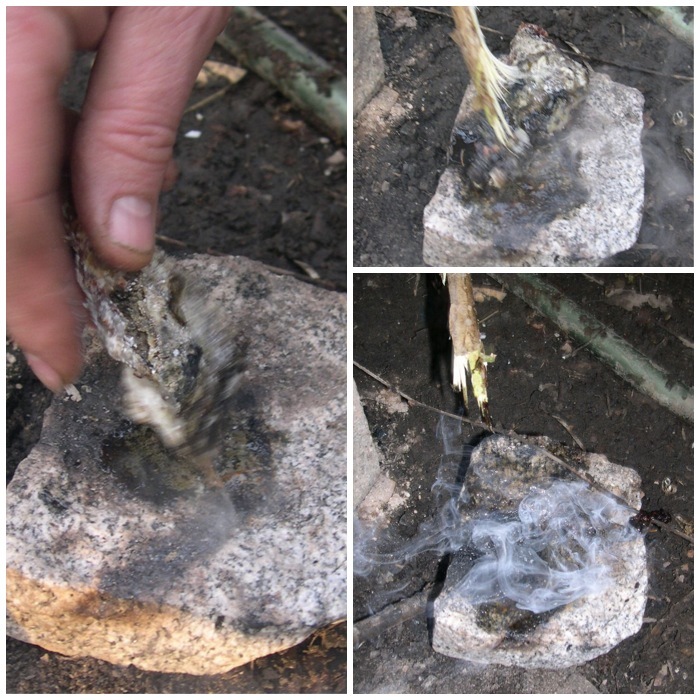 The hot rock I used had been heated before many times so there was no risk of it exploding (which can happen if they contain trapped air). On the heated rock (bottom right) I heated the first lump of resin, and as it melted I scraped off any debris such as bark. I kept adding more and more resin, charcoal and beeswax (I just added charcoal until the mixture thickened slightly and added beeswax in little lumps) until it had all melted. The rock was super-heated so I had to take great care not to burn myself. The rock had a slight indentation to collect the melted resin. It doesn’t look like there is much resin here but it was enough for what I had to do. 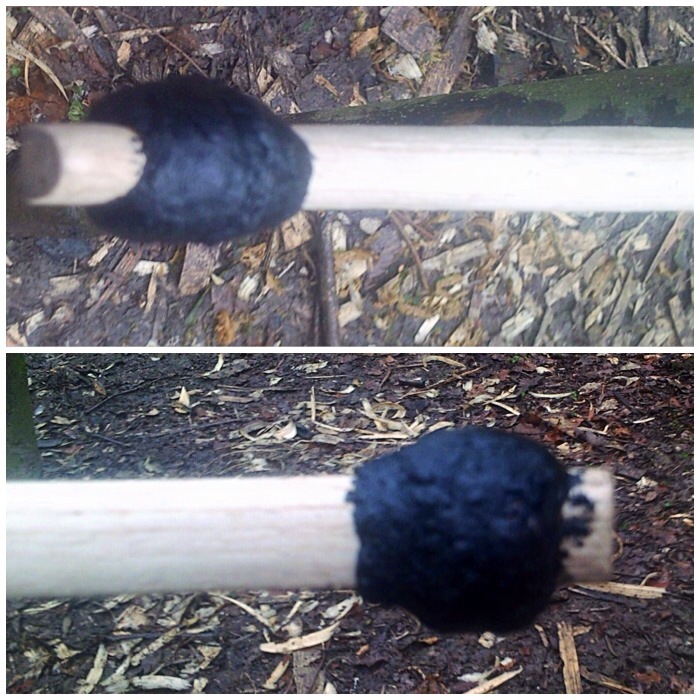 Using two sticks, one to scrape the pine pitch up and one to hold the cooling pitch, I coated the holding stick with the pitch mixture then submerged it in a pot of cold water to harden it. I would then repeat the process adding more and more layers. Using cold water speeded up the whole process. 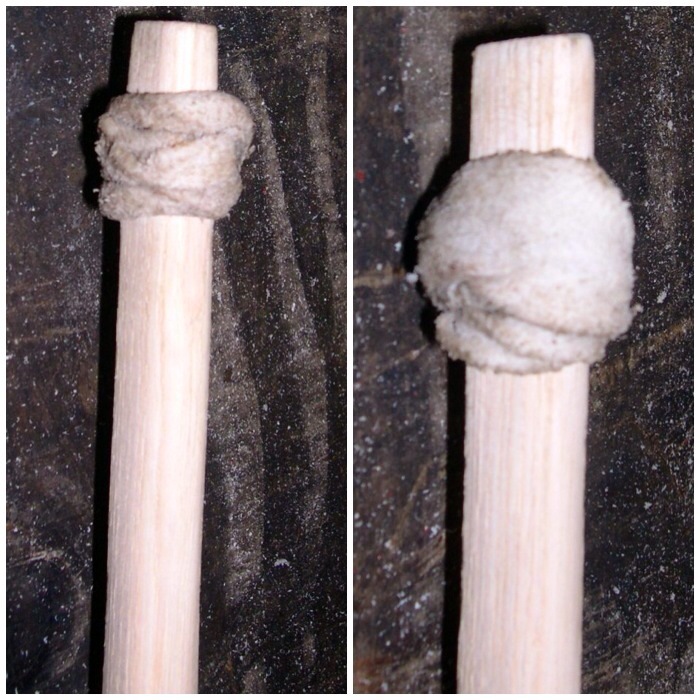 After re-lighting the charred stick I used it to to re-melt the tip of a pitch stick (top picture). 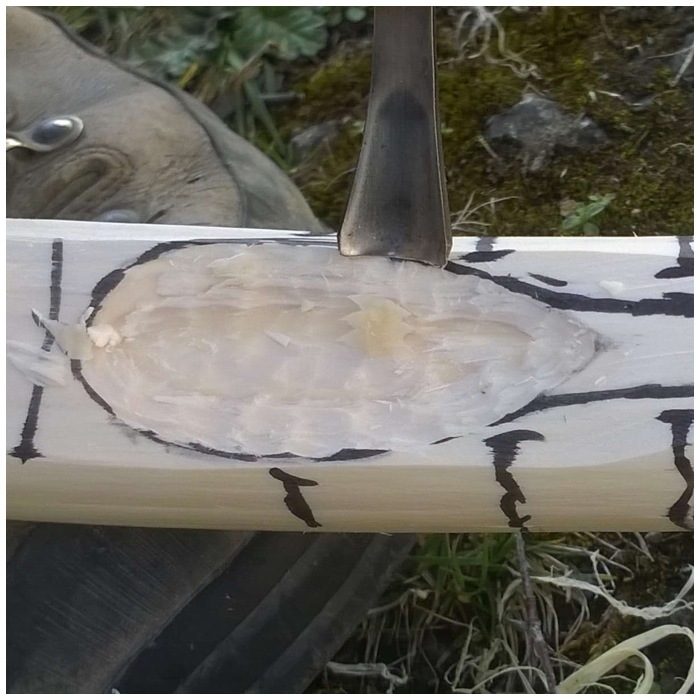 I found it fairly easy to drip the melting pitch onto the area of sinew on the arrow I wanted to cover (bottom picture). 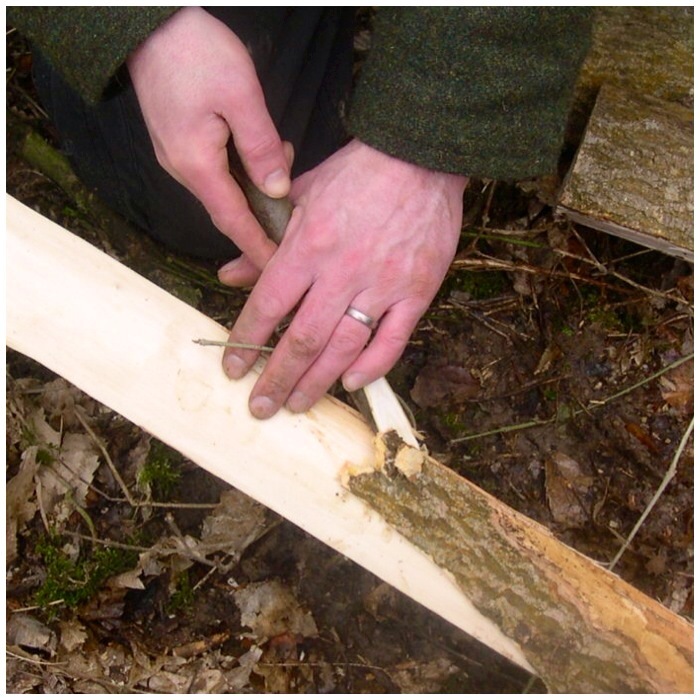 As I dripped the pine pitch onto the sinew I wet my fingers so that I could smooth the resin out and spread around evenly (John the course instructor is in the left hand picture demonstrating this). 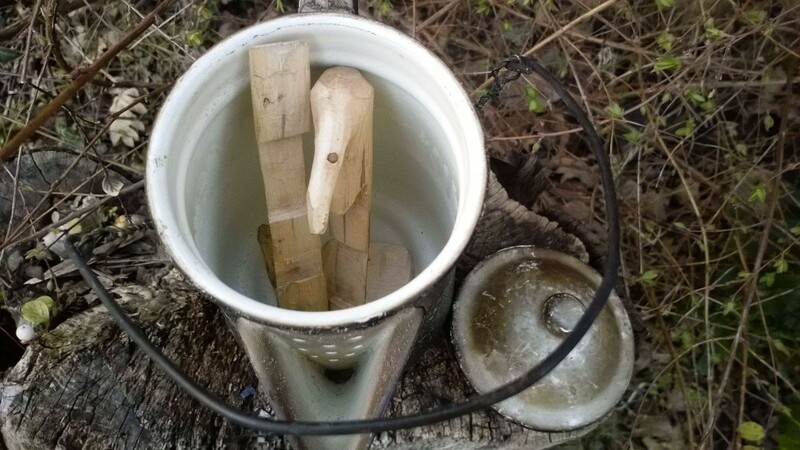 If you do not wet your fingers the hot pitch could burn you and also it will stick to your fingers (out in the woods without hot running water this is a pain to clean up). 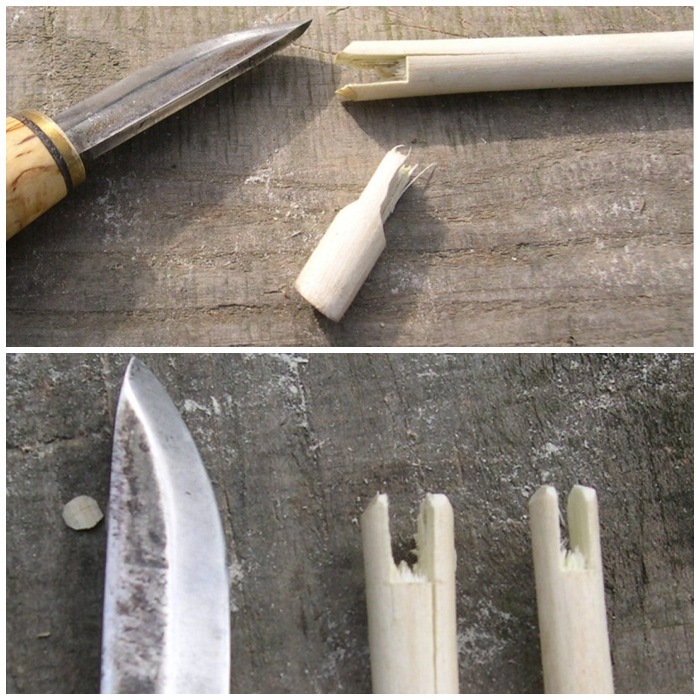 The next stage in the process was to make some arrow tips. 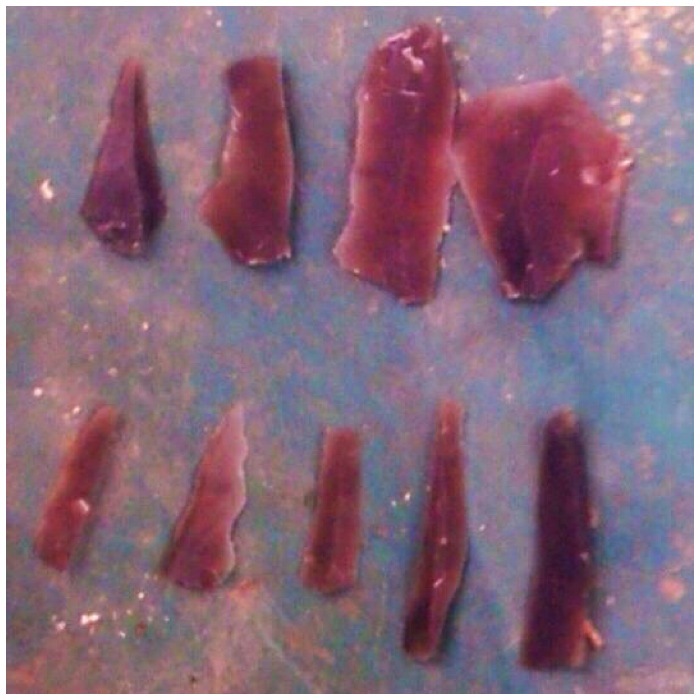 I had collected up some shards of flint left over from the course we had with John Lord. Thankfully there was a mass of leftover flint for me to look through and choose from. 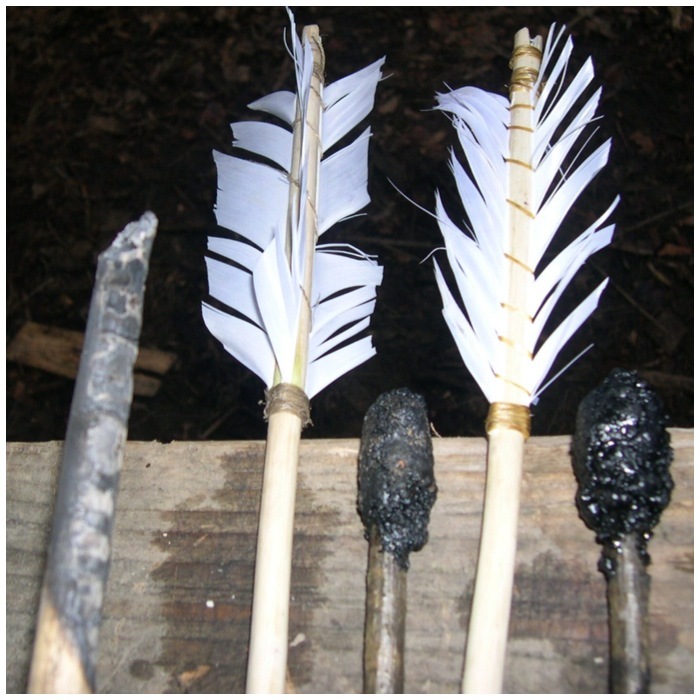 All of the pieces shown below I thought could be made into decent arrow tips or barbs with the minimum of effort. 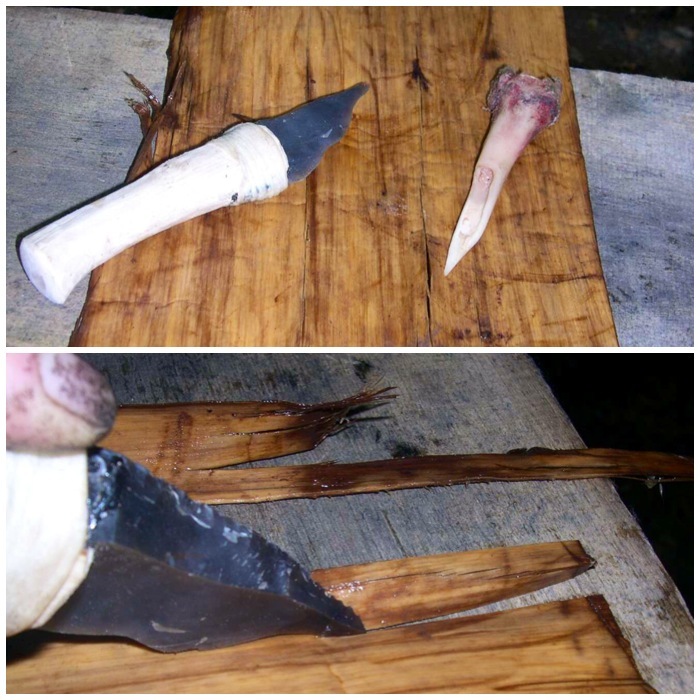 The next stage was to pressure flake the pieces with a copper tipped pressure flaker and an antler tine (I wanted to try both tools) into usable arrow heads. The glasses were worn to protect my eyes from flying pieces of flint and the glove protected me against cuts. 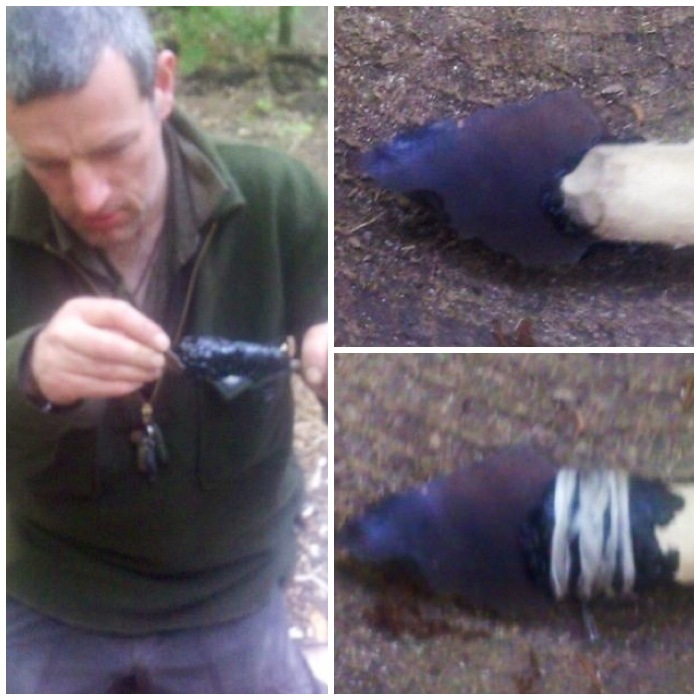 I placed under the flint a strip of leather to give support and further protect my hand. 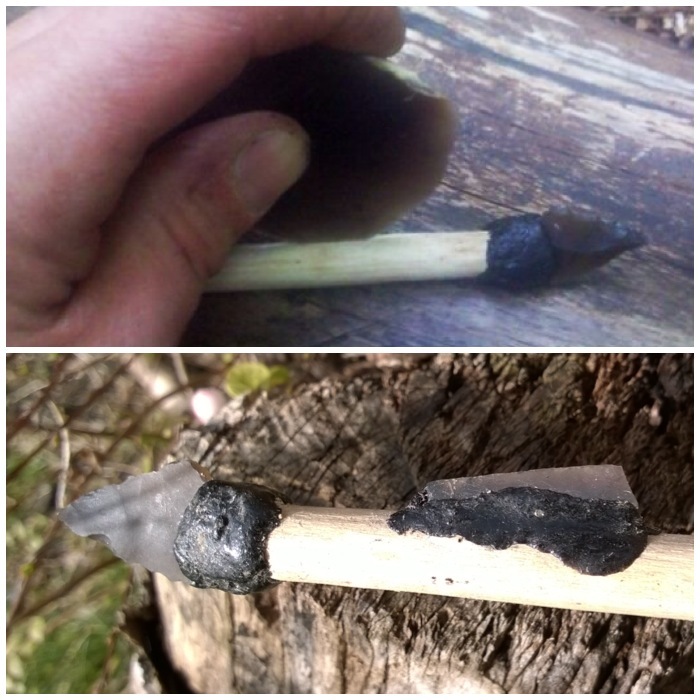 The picture on the right did not turn out very clear (a smear on the lens of my camera) but I soon had an arrowhead ready to insert into my arrow shaft. 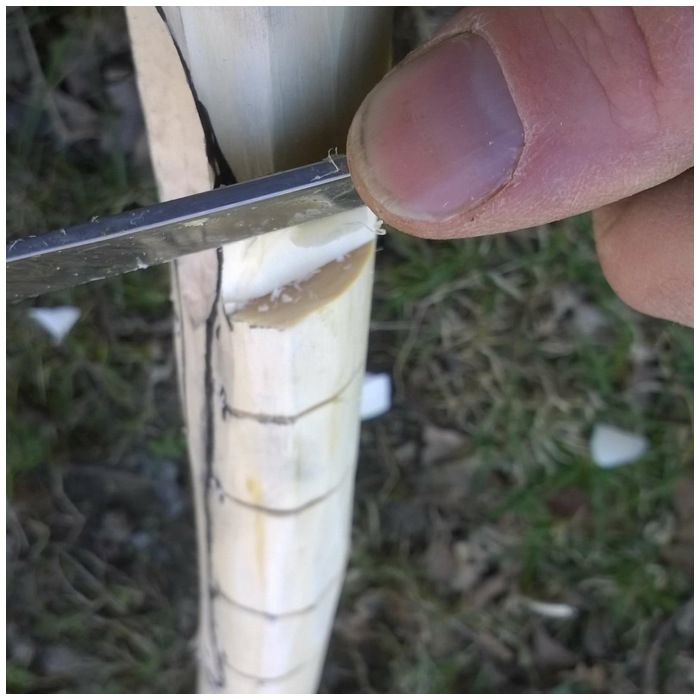 Using the same method as I used to make the knock, I created a groove at the arrow tip. 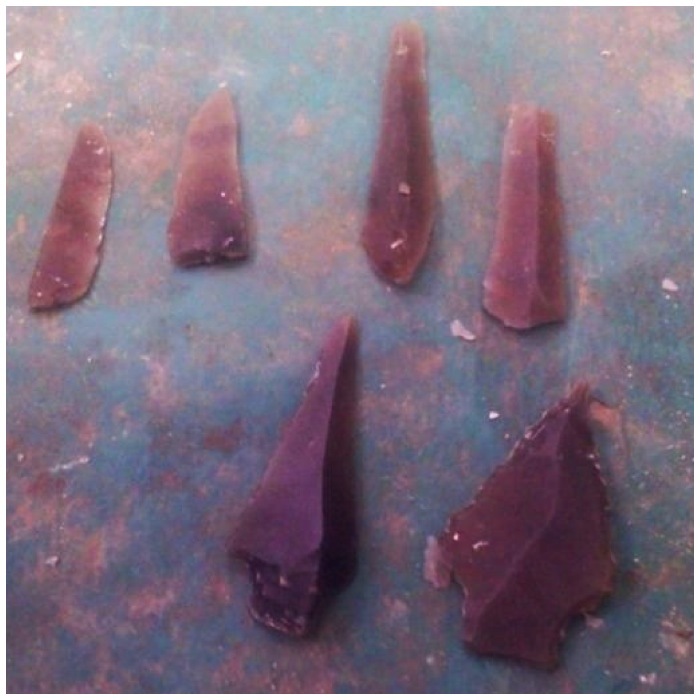 I re-worked the other pieces and after a little touching up these other flint points were ready to be used. 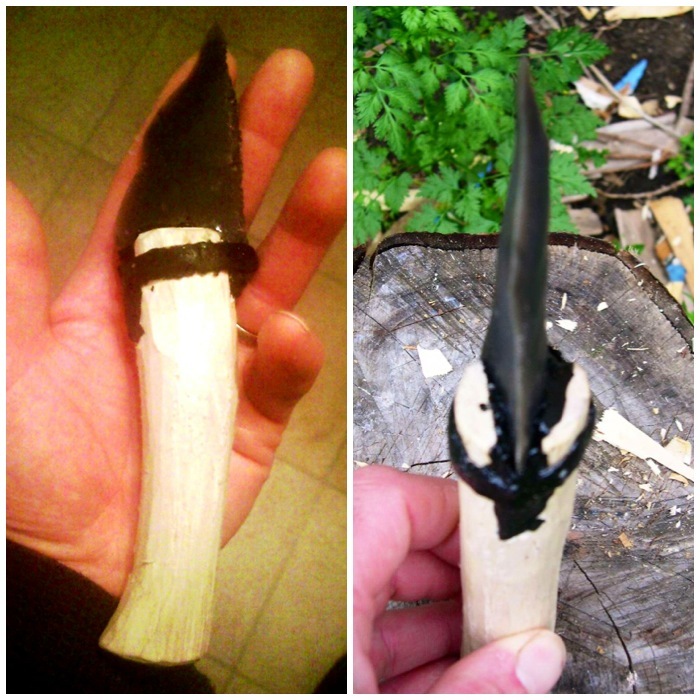 I then coated the arrowhead with some pine pitch and placed it into the groove on the shaft. 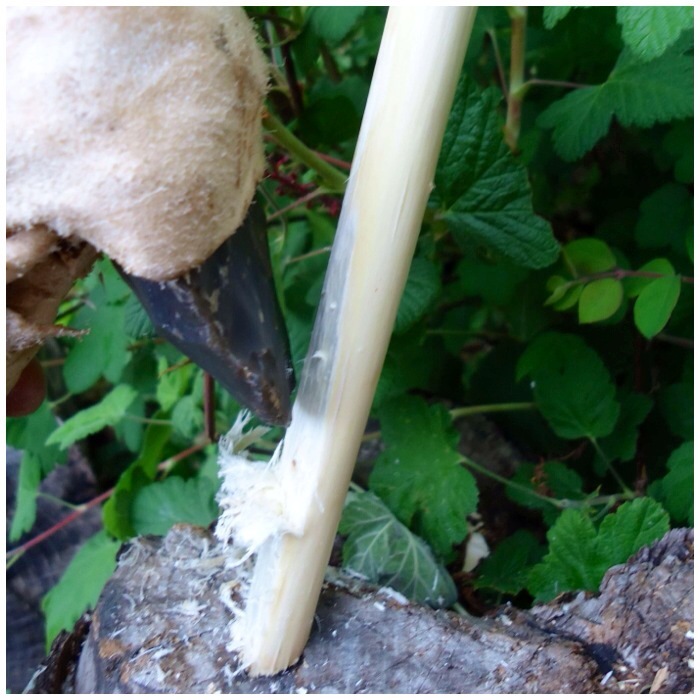 I then coated the tip of the shaft in more pitch and wrapped sinew round it to keep the arrowhead secure. 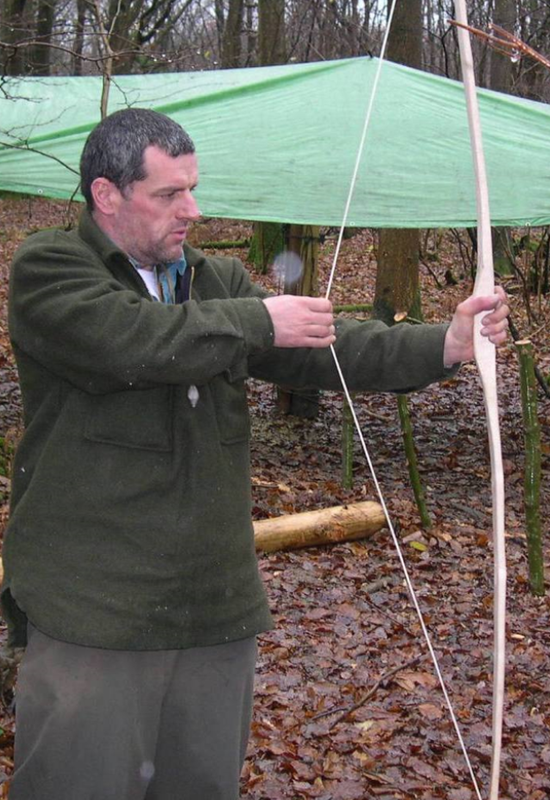 Update 13/03/2014 – I have been advised by one of the Primitive Arts Society members David Colter that it is very important to securely bind the shaft immediately below the point for a length of about a centimetre to prevent it from splitting on impact and failing to drive the point into the target. There is a very good experiment showing this in the Traditional Bowyers Bible Vol 3. I did not bind it for a full centimeter in my example (thanks for the update David). I finally added more pitch to cover the sinew to waterproof it all. 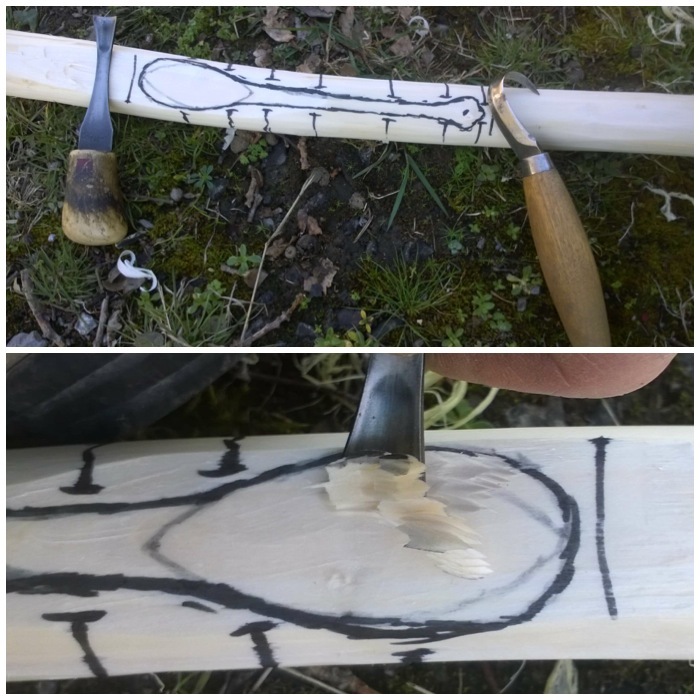 Based on archaeological evidence I decided to add a barb to the arrow. 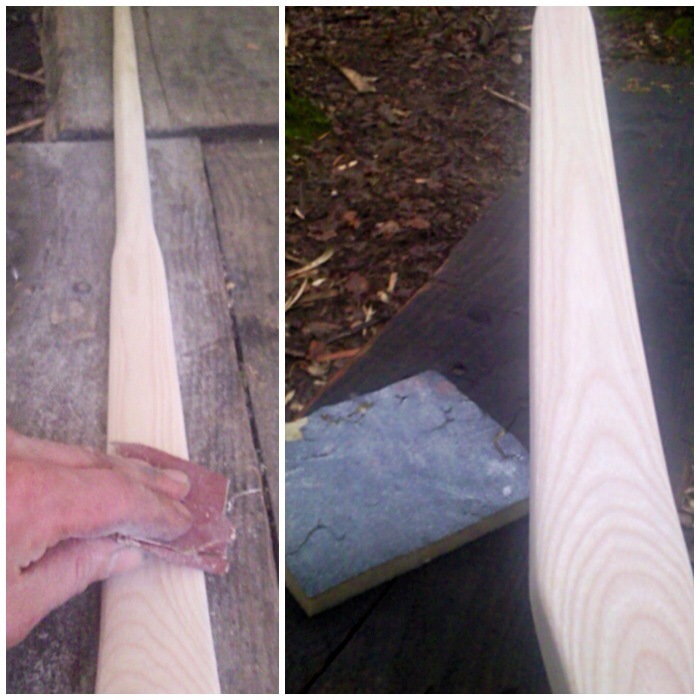 I firstly scraped a groove along the arrow shaft then put some pine pitch into it. 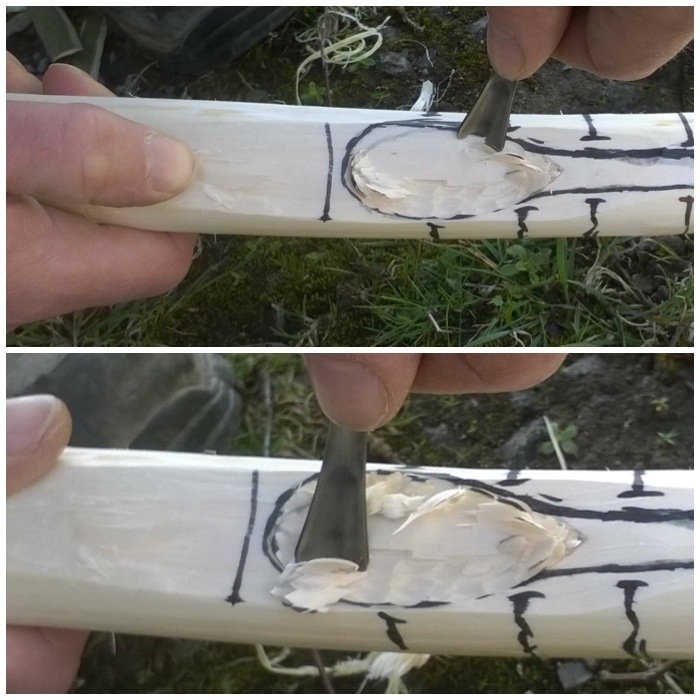 I then placed a long thin piece of sharp flint onto this pitch and coated more around the base of it (bottom picture) The barb is designed to cause maximum damage to the prey animal as the arrow enters its body. I finished two arrows in this project. The one I completed for this tutorial is the one on the right. Using similar techniques I was able to produce an Atl atl set as well. 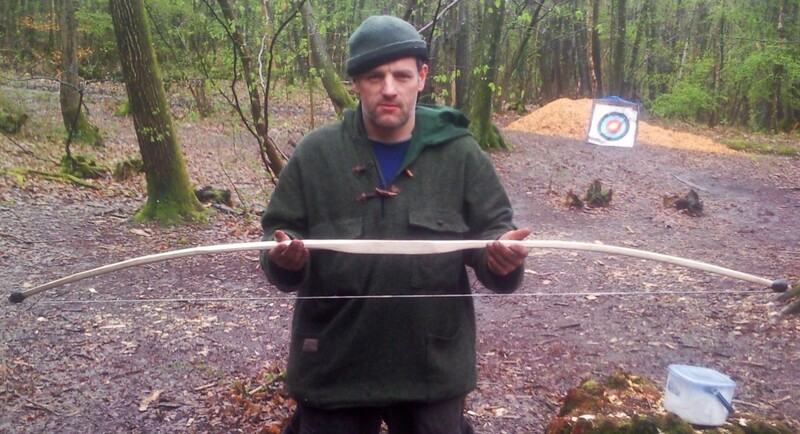 I have never shot these arrows at a modern target as I don’t want to break off the tips but I did shoot them into some bales of loose hay and was very impressed with their accuracy. 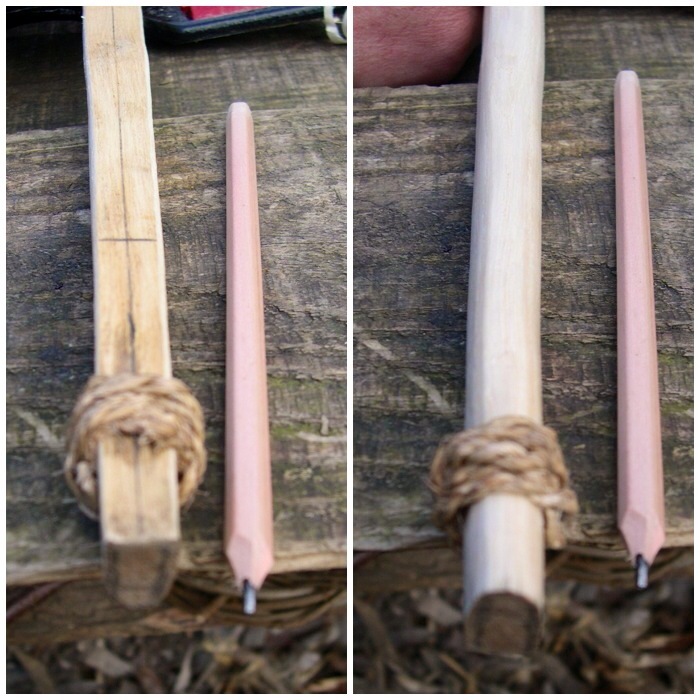 This was a great project as it introduced me to some primitive but very effective techniques in arrow making. 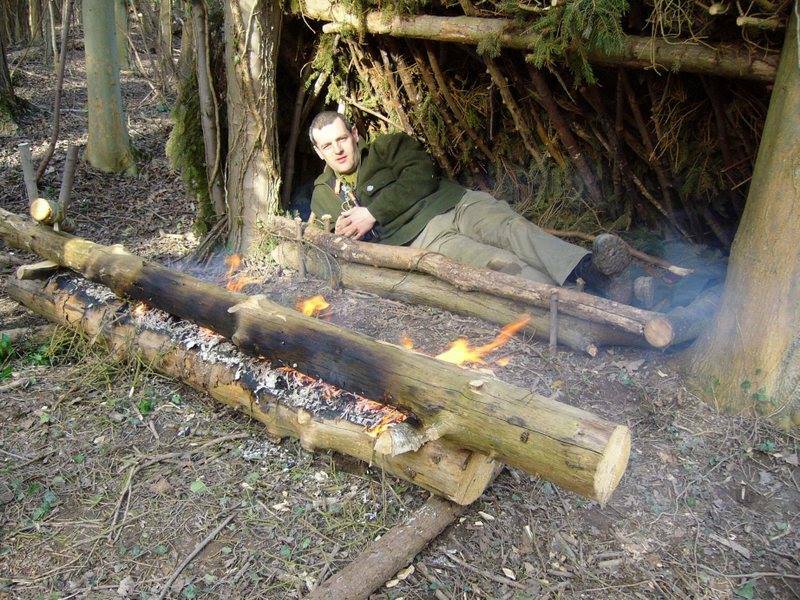 Back in 2007 I was on a bushcraft course with Kevin Warrington and he showed me how to set up a long log fire. This isn’t quite the Finnish Rakovalkea but the idea is basically the same. 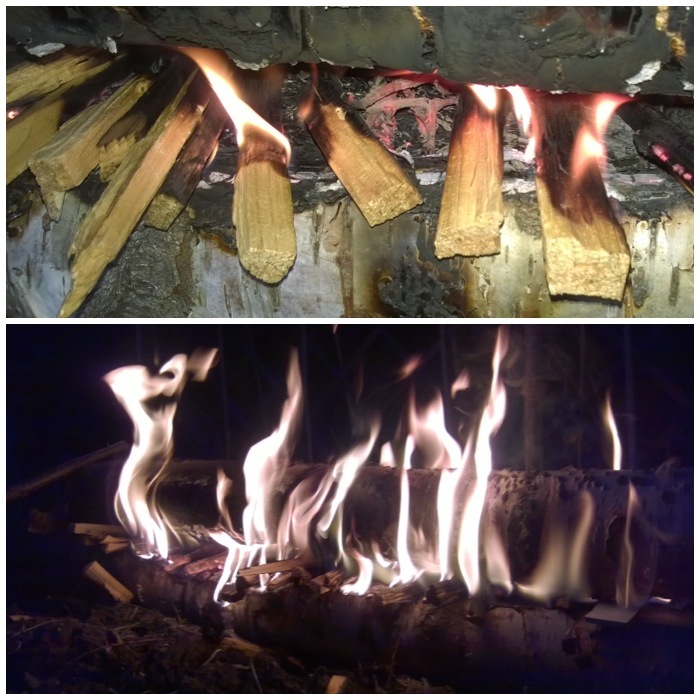 These fires are great when you’re sleeping outdoors in a lean-to shelter or under the tree canopy in very cold or arctic conditions. 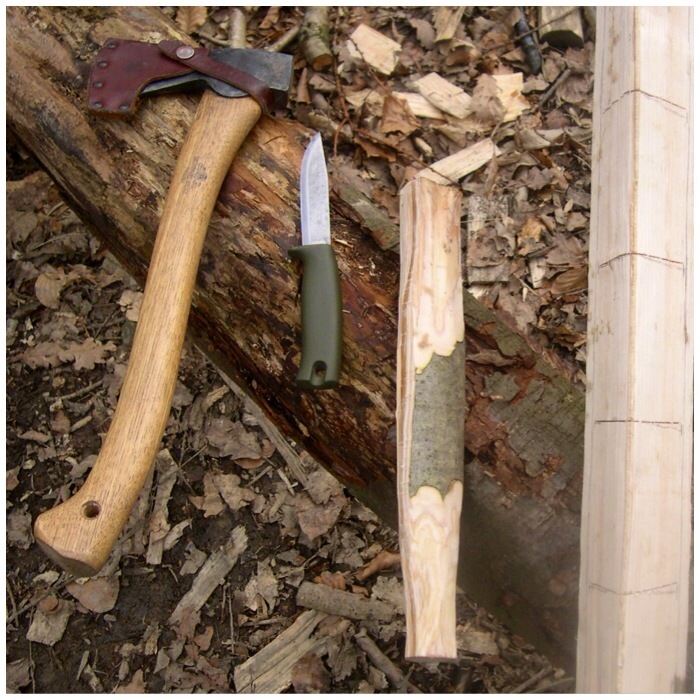 Last weekend I came across an excellent post on making a large full length Rakovalkea Gap Fire by SKW Bushcraft (I used Google Chrome to translate the page). 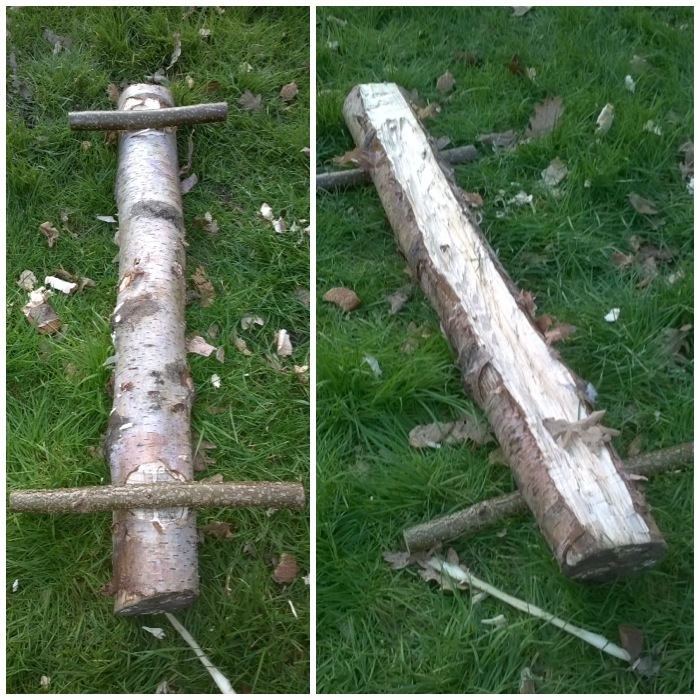 While out last weekend in the woods I came across some dead standing birch logs that looked ideal for the fire (normally pine is used but I do not have access to any at the moment), and luckily there were some handy, biddable children around to help transport it home. 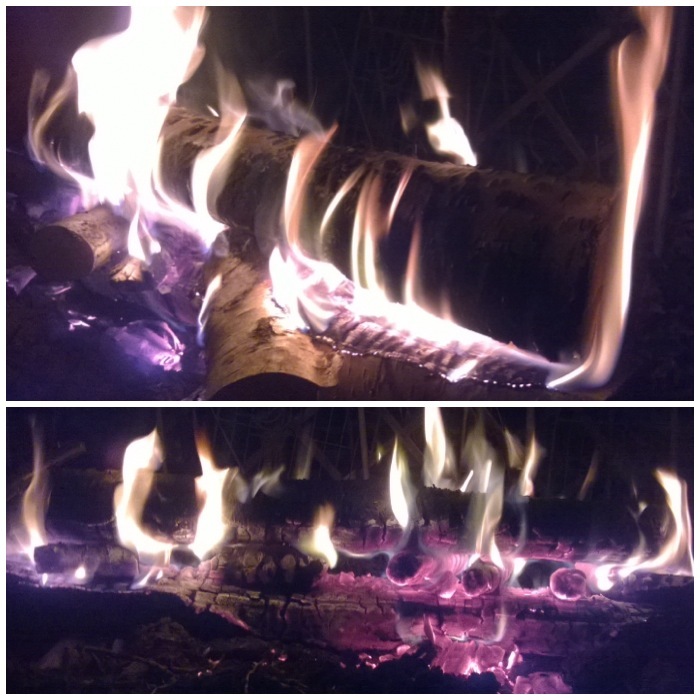 For the next hour I just kept giving the fire the occasional waft and added more and more kindling. I made a short video (the sound is quite poor I am afraid) of the fire at this stage. 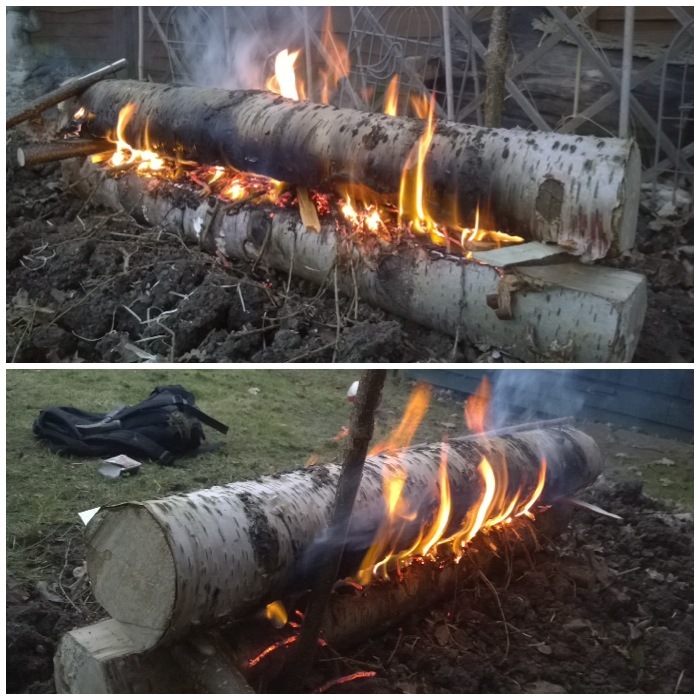 There are some excellent long log fire pictures here on the Bushcraft UK forum to view and the Winter Trekking forum shows some good pictures of the Finnish army using the method.